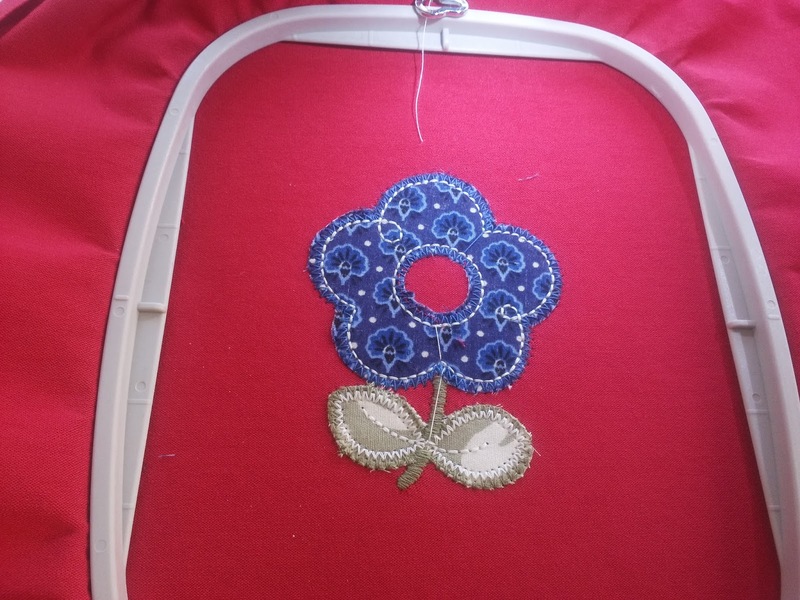 SWEET PEA IN-THE-HOOP MACHINE EMBROIDERY DESIGNS. 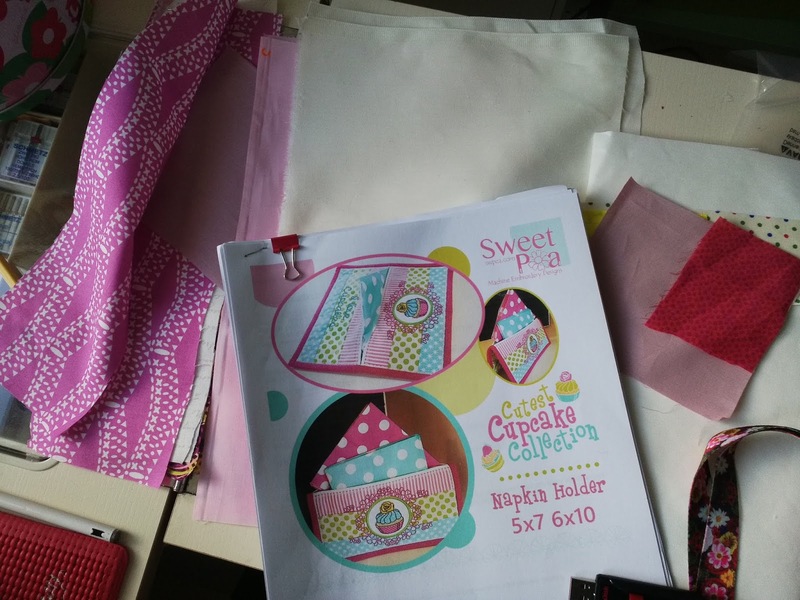 A while ago I was fortunate to meet the Sweet Pea team and see their amazing designs close up. 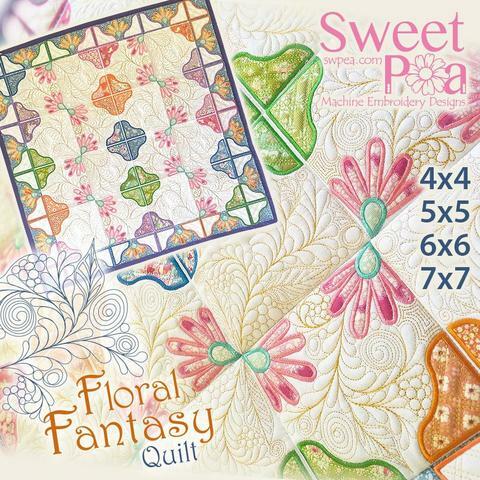 If you have not come across Sweet Pea before then you are in for a treat. This is embroidery at its most exciting, the designs are mostly made entirely in the hoop,and what stunning designs they are! 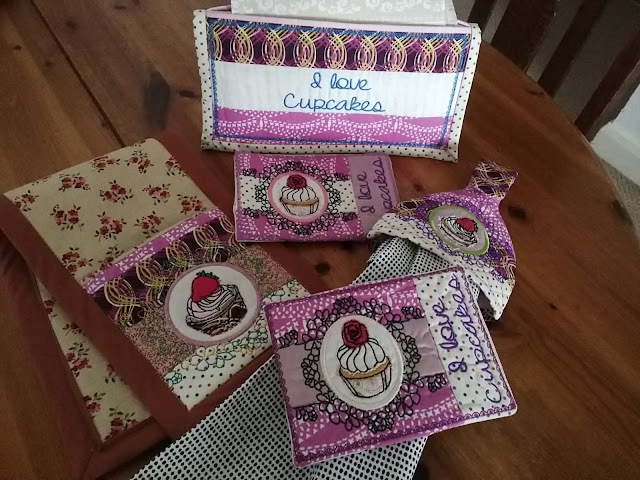 The Cupcake collection, which I am making at the moment. The FARM ANIMAL BAG which is utterly delightful. It even contains soft toys. What an amazing gift this would be for a special child. I dare not make this one just yet until I have time to make a few of them for all the young children in my family. First of all let me introduce you to the team. On the far left is Holly, and next to her is Allison. Allison is actually the creator of Sweet Pea Embroidery. 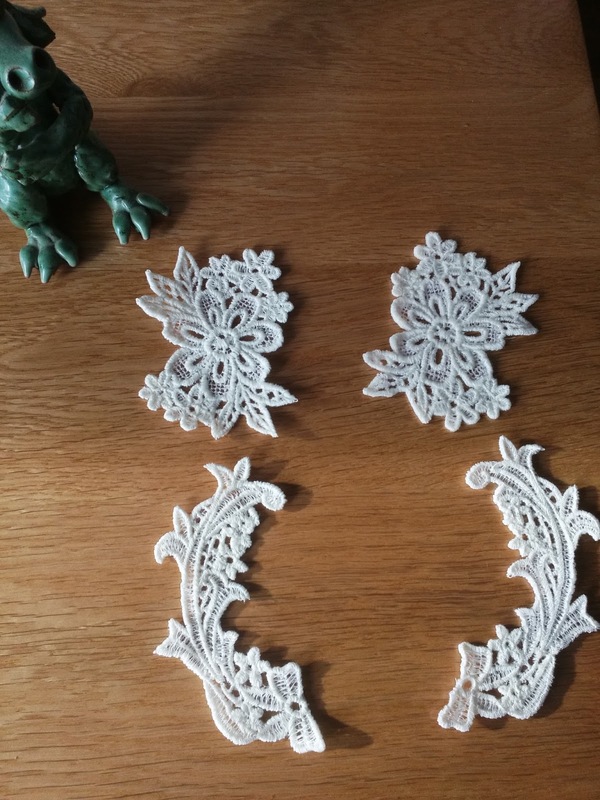 She was looking for something new and exciting to make and as she couldn't find anything she started to produce free-standing lace earrings which she sold on market stalls. So this is a very new company. Next to Allison is Annette and on the far right is Emma. Sweet Pea are unique in that they specialise in " in the hoop" Embroidery. This form of embroidery is different to other forms of machine embroidery where a part made article is embroidered and then made into a garment or other item. With this method the actual piece of work is either fully or partially completed without removing it from the hoop! Sweet Pea website But now a very limited number of places are now selling some of their exclusive designs - and happily Jaycotts is one of them! So, what designs can be made " in the hoop?" Well the answer is almost anything! 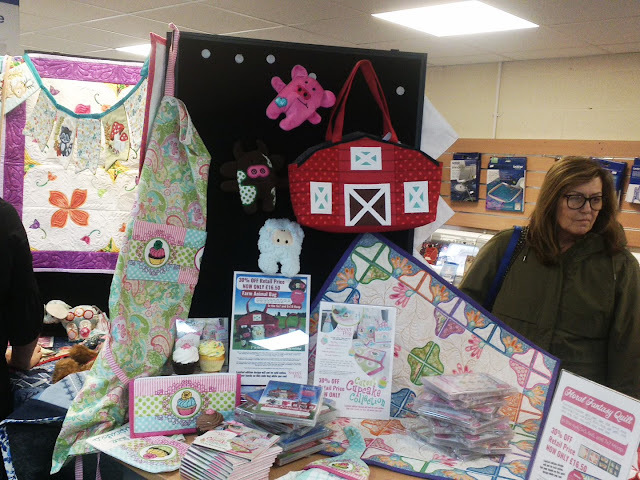 Toys,table runners, bags with zippers, quilts and much more. 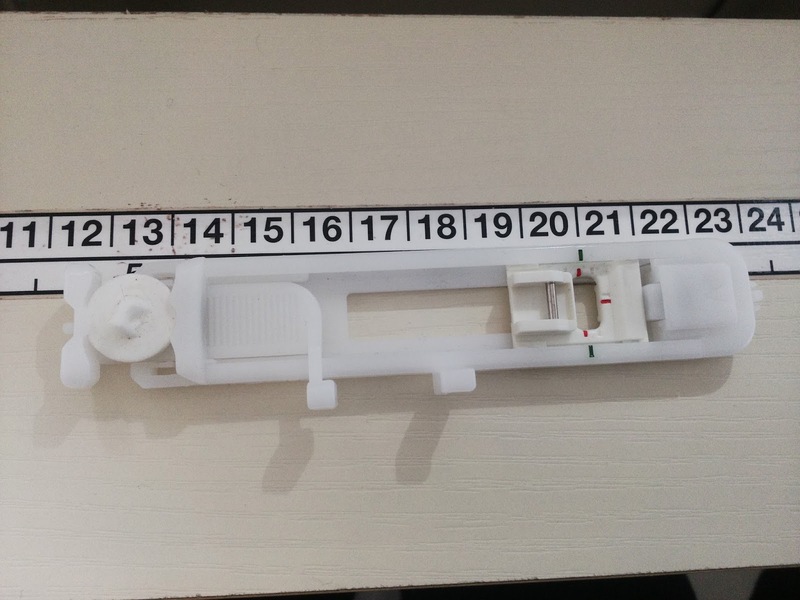 Some of the comments I heard from people who have used the designs are that the instructions are very clear and easy to follow with pictures for every stage, and that is true, time whizzes by very quickly when making one of the designs,and everything is so very well explained . They really are addictive. For all these designs you need an embroidery Machine. Sweet Pea recommend Brother machines. 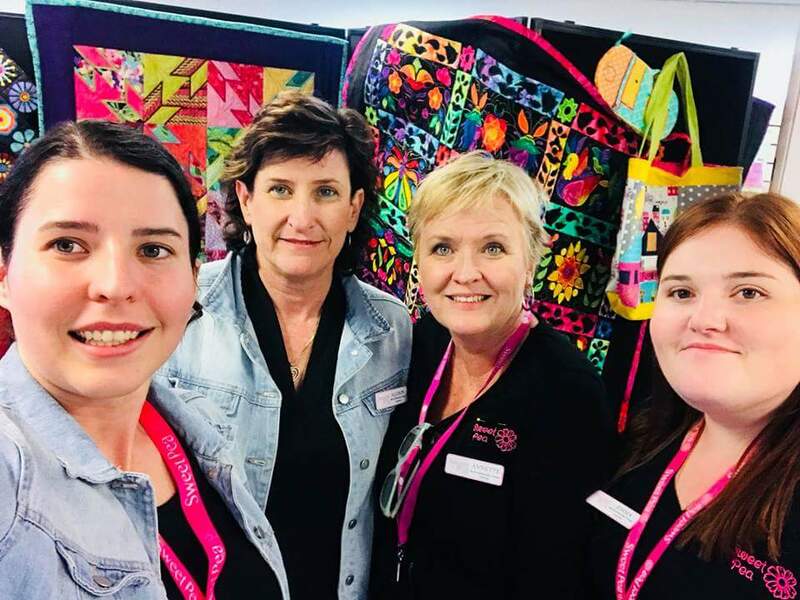 There is a wide choice of embroidery machines at Jaycotts and your choice is dependant on whether you want an embroidery only machine or a machine which does both sewing and embroidery. 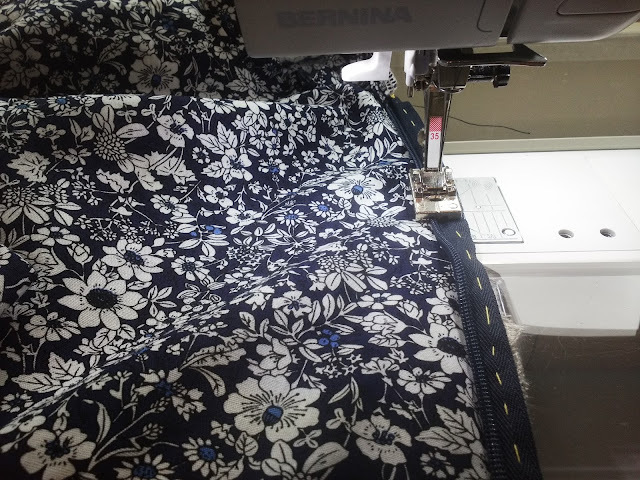 These machines sew normally but easily switch to an embroidery machine at the touch of a button. Take a look at the machines on offer at Jaycotts Brother. Sewing and embroidery machines and or call in to their Chester showroom for an amazing range to look at and try out. 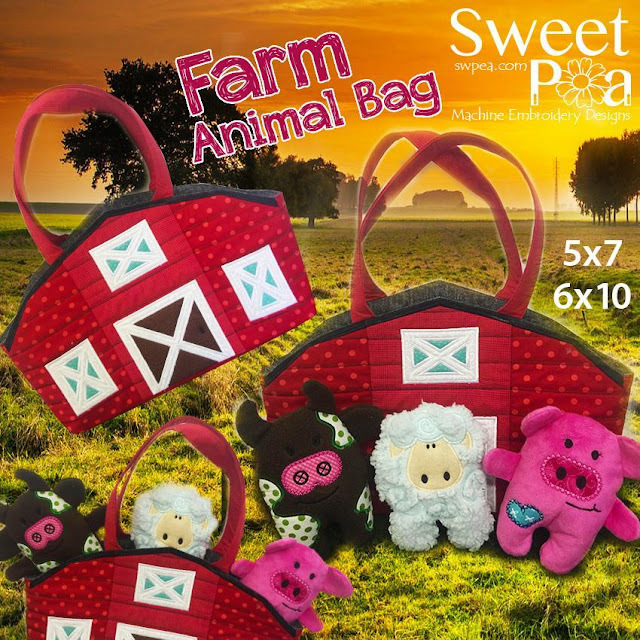 Sweet Pea on Facebook you can show your own sweet pea makes and enter into their competitions. 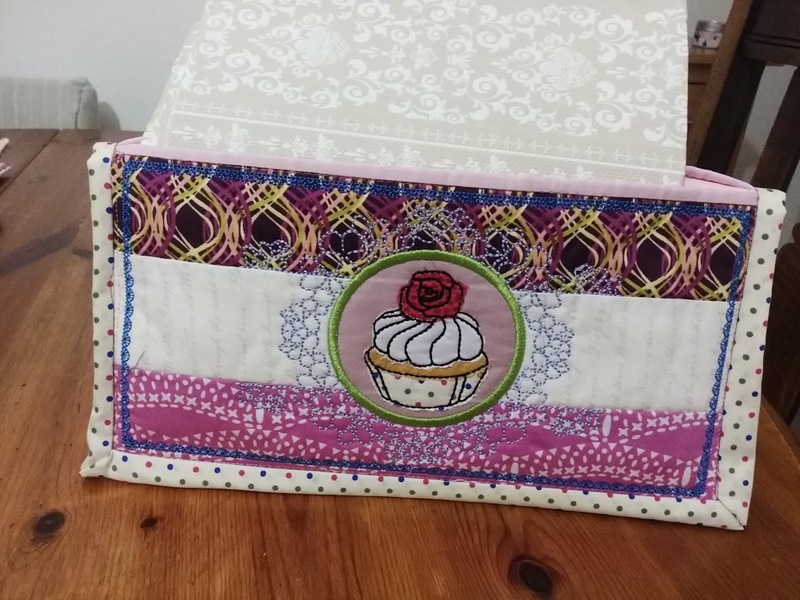 There is a monthly sew-along with prizes to be won. 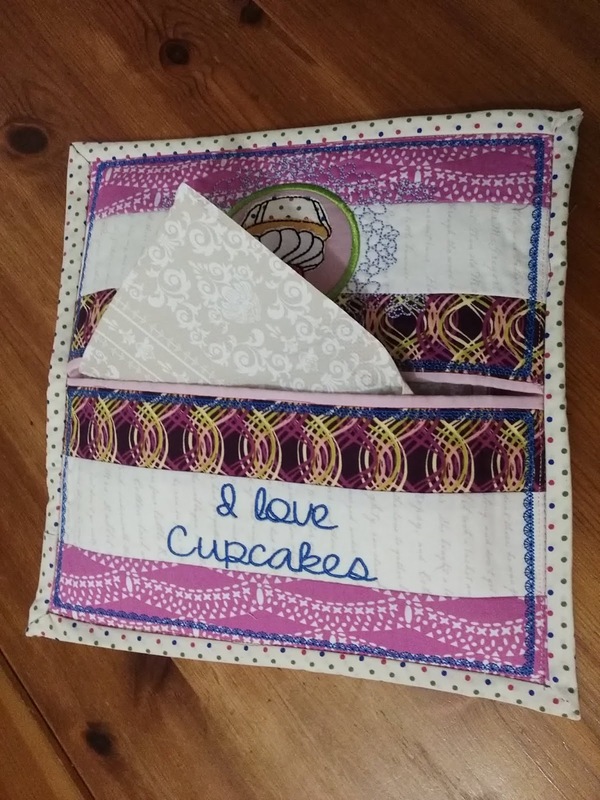 There is also a quilt block of the month. If you are looking for gifts then this is perfect. If your recipient owns an embroidery machine then the CD is the perfect choice. But if you love to give handmade as gifts as I do then this collection, or even just one or two items from it would be perfect. There are options for different hoop sizes. So, to get started put your CD into the computer and open the files. You can choose if you want to print your instructions as I prefer, or if you have room for your computer next to your machine you can follow the instructions from there. 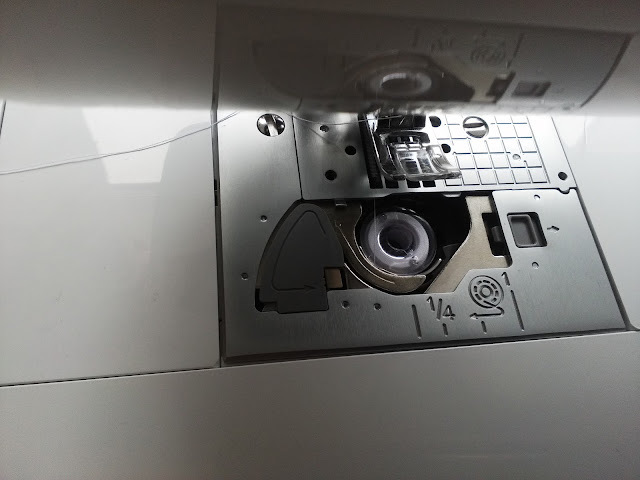 When you have transferred the .pes file to your pen drive insert it into your embroidery machine. 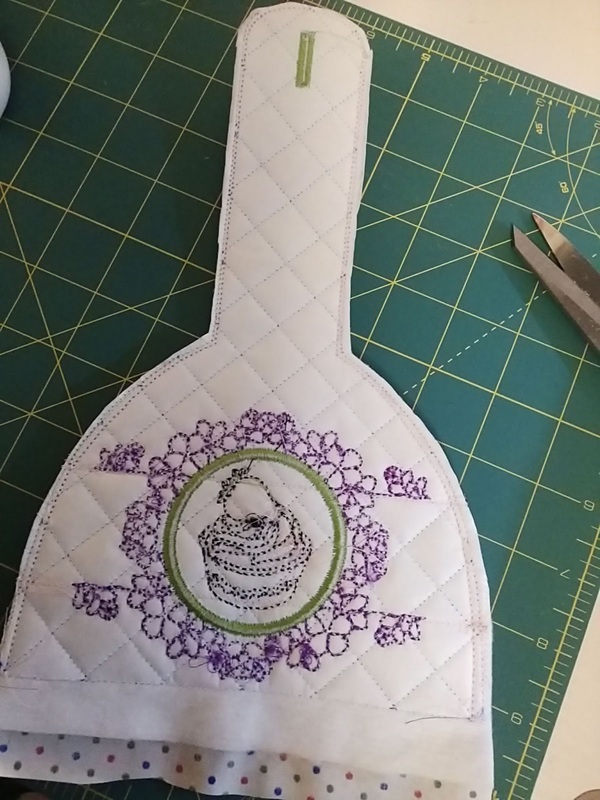 You then need to scroll through your designs until you find the one you want, if you are like me you will have quite a few embroidery designs on your pen drive! The mug rug is the easiest design to start with. It comes in three sizes, the finished dimensions being 5x7" 6x10" and 7x12 . The ones I have made for now are the smallest size but I intend making the larger ones too. To start, prepare your fabric and lay it out so that you know which piece is which. 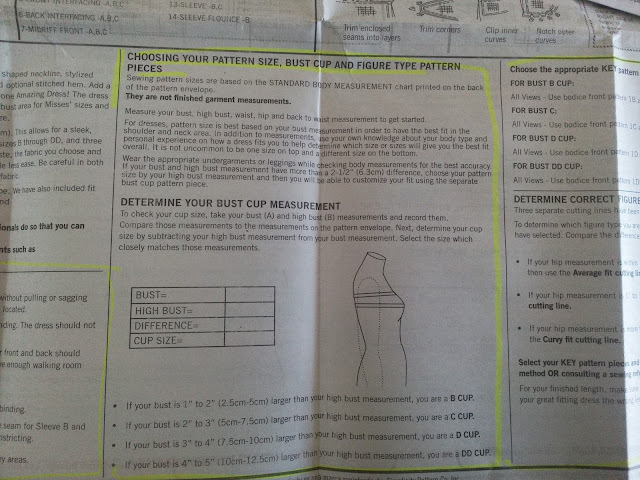 The measurements for each size are given on the instructions. The beauty of these designs is that you can choose your own colours and personalise your designs to your own colour scheme. Cut your wadding out to the measurements given . 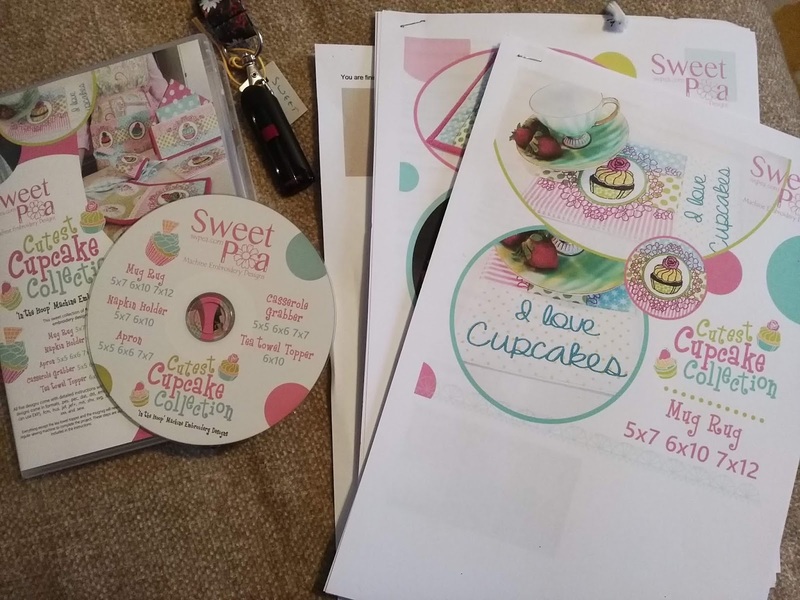 On the instructions, every single step is explained very clearly and if by any chance you just cannot understand a step you can contact Sweet Pea via the website or Facebook and they will be happy to help. This is the placement for the cupcake, I have already stitched the background strips in place. 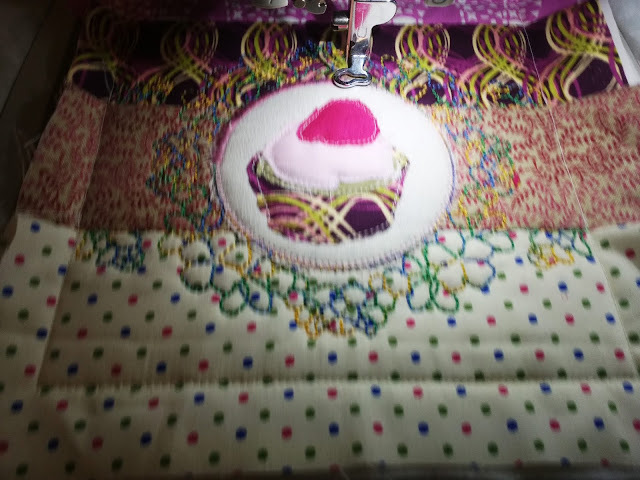 The cupcake is built up layer by layer and you do need to take the hoop out and trim around the shapes as you attach them. This doesn't take long. 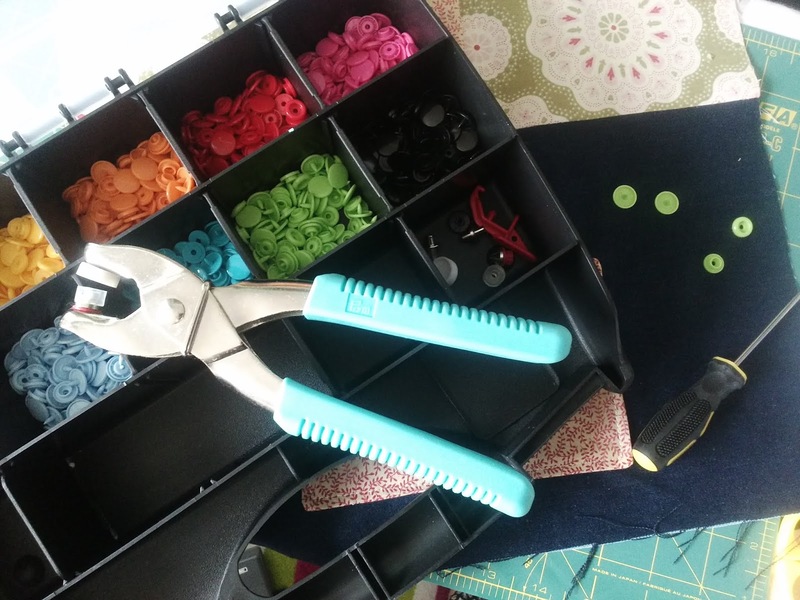 You will need a quality pair of Embroidery scissors to cut around the shapes close to the stitching. For larger areas Duckbill Applique scissors are extremely useful. The design is progressing and it amazes me that the entire mat is completed without removing it from the hoop at all. Even the backing is attached in the hoop by stitching it right side down on top of the design. If you are concerned that the process of making these is difficult, then don't be. Your machine automatically takes you from one step to the next and tells you when to change thread. Do use the colour of embroidery thread to match the area you are stitching, and not necessarily the colour shown on the machine display. I have now finished my mug rug and it has been taken out of the hoop. 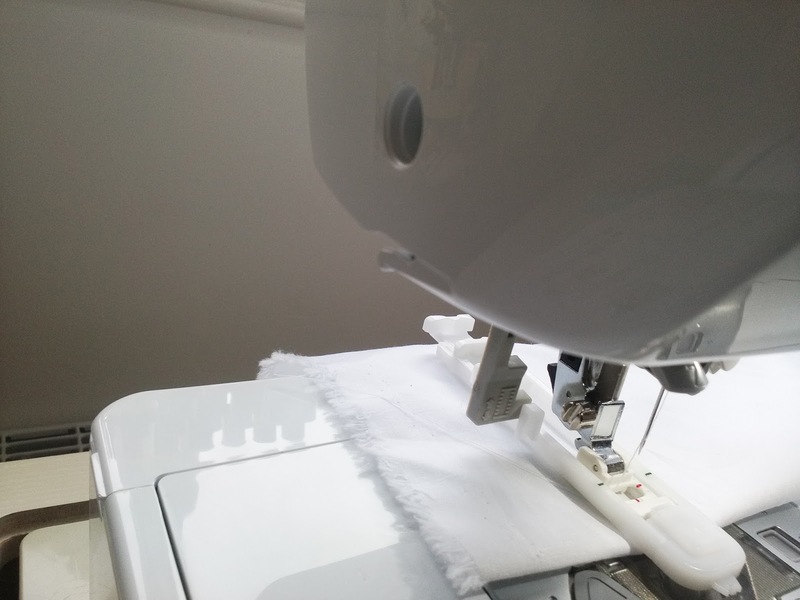 Remove your tearaway stabiliser and trim the wadding very close to the stitching line. This is the inside of the mug rug, it needs to be turned right sides out. Used to turn the mat right sides out. 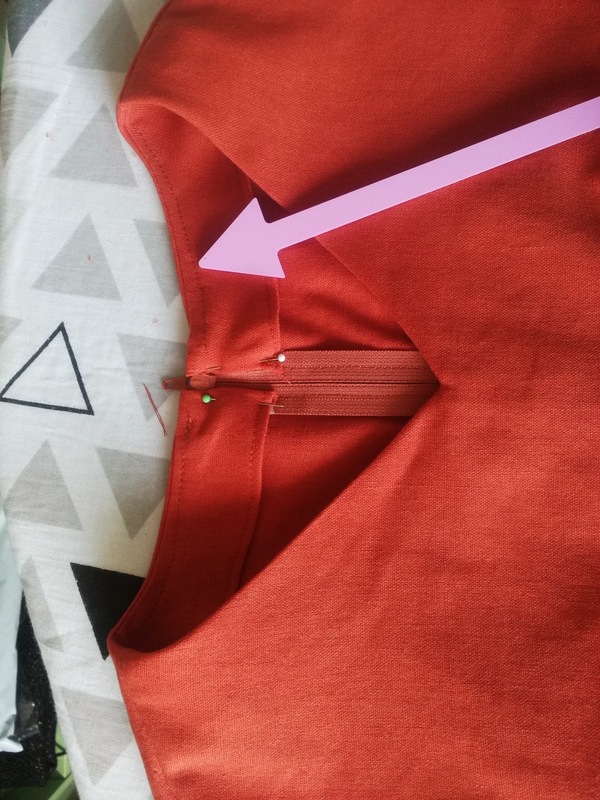 Trim the seam allowance and cut across the corners, leave a larger seam allowance at the gap to enable you to close the seam easily. You will need a point turner or a chopstick to push the corners out. 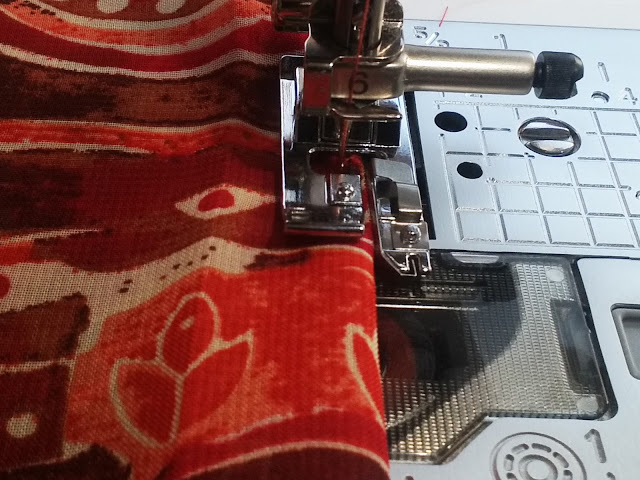 Then simply press, handstitch the gap closed and press again. I guarantee that you will have hardly noticed time passing, this really is very absorbing work. This comes in two sizes, 7"x 8•75" and 10•5" x 10•5"
Firstly cut your fabric and wadding out as before. Remember that you need two sides for the top and a larger piece for the back. 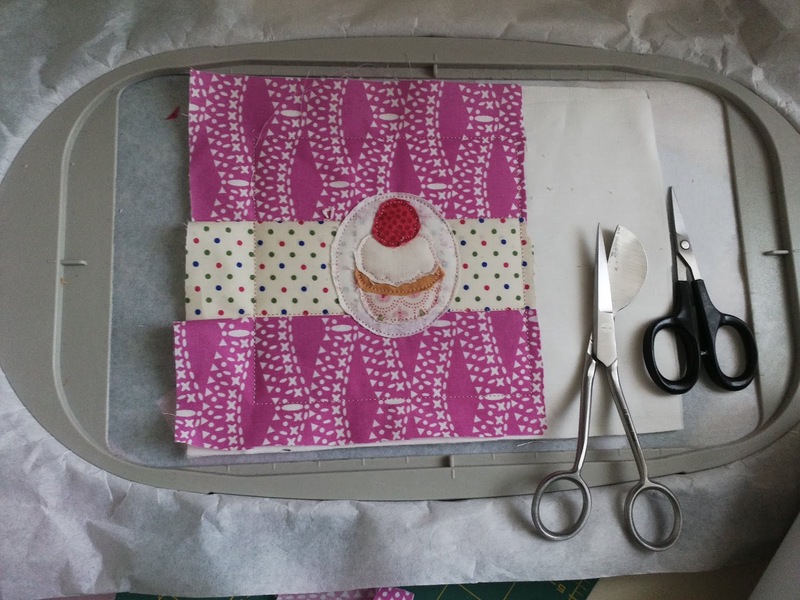 you need your regular sewing machine to finish the napkin holder. 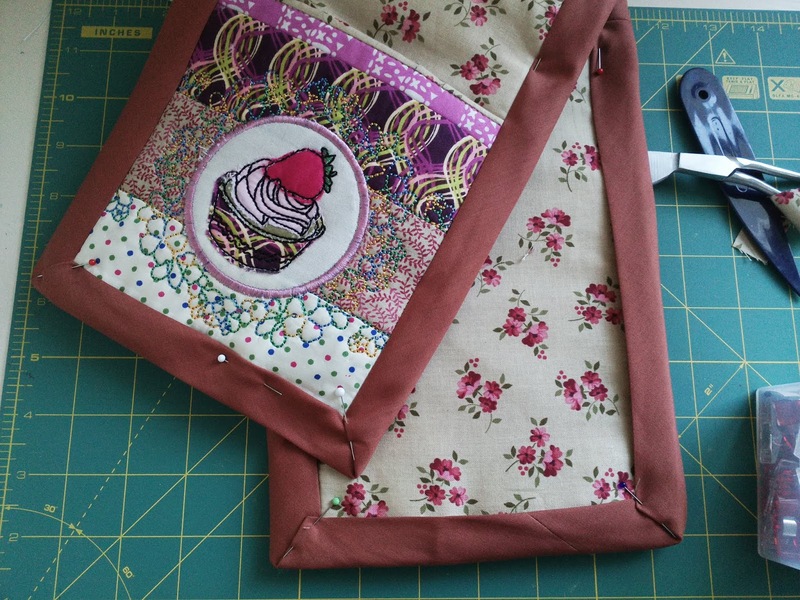 Pin or clip the tops to the bottom, right sides out and matching your stitching lines carefully. 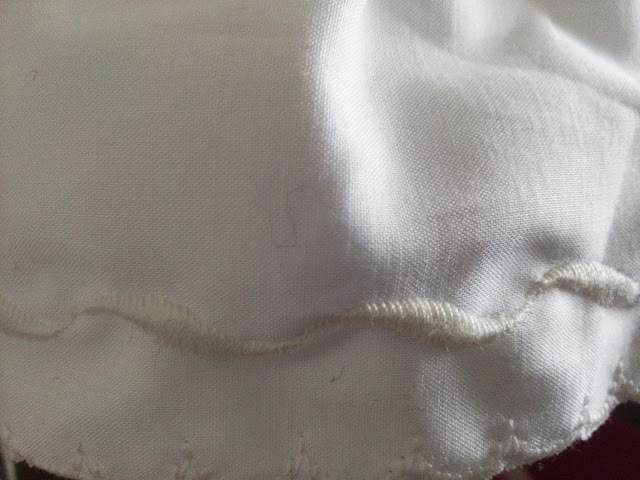 Then machine stitch close to the edge all the way round. 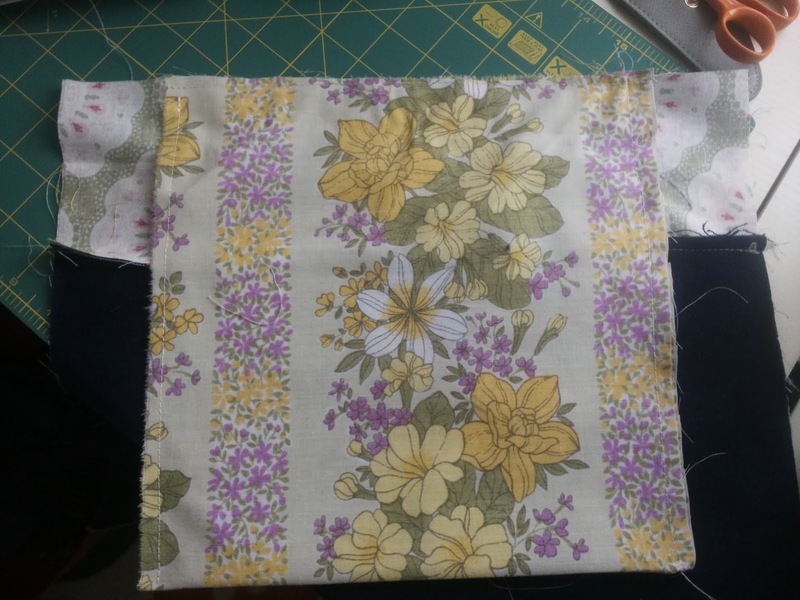 I cut out a 3" wide piece of fabric more than long enough to fit around the outside. Pressing it in half wrong sides together. 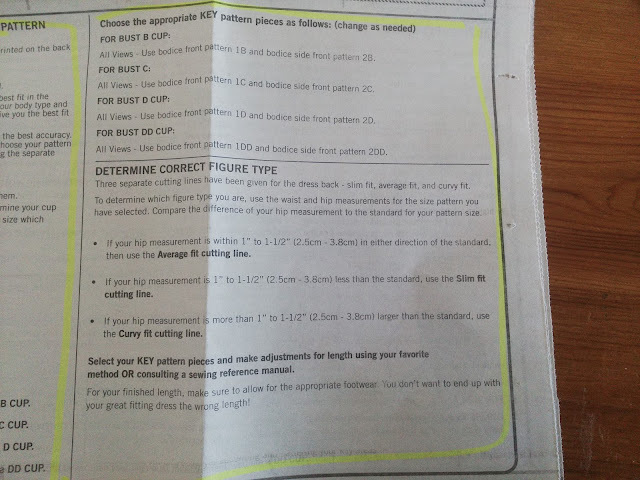 Cutting measurements are given in the instructions. 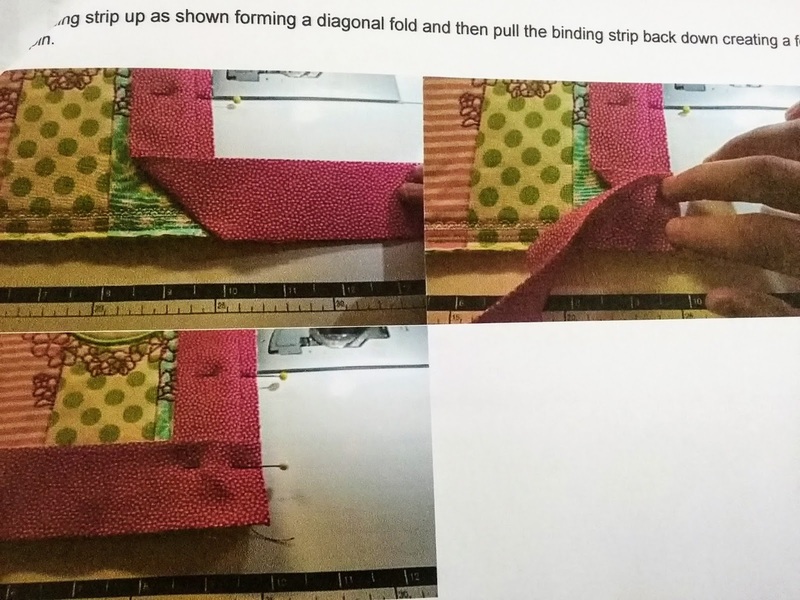 The strip is stitched to the edges following the very easy to understand tutorial which forms part of the instructions. You do need to mitre the corners but this is explained very simply. 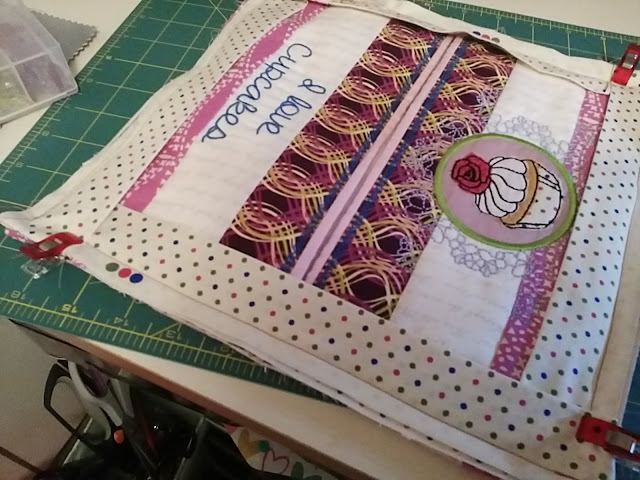 You might find more easier to hand stitch the corners before stitching in the ditch after the binding has been folded to the back of your work. So please don't worry about how you are going to apply the binding around the edge as there are step by step instructions to guide you, and the way it is explained is incredibly easy to follow. 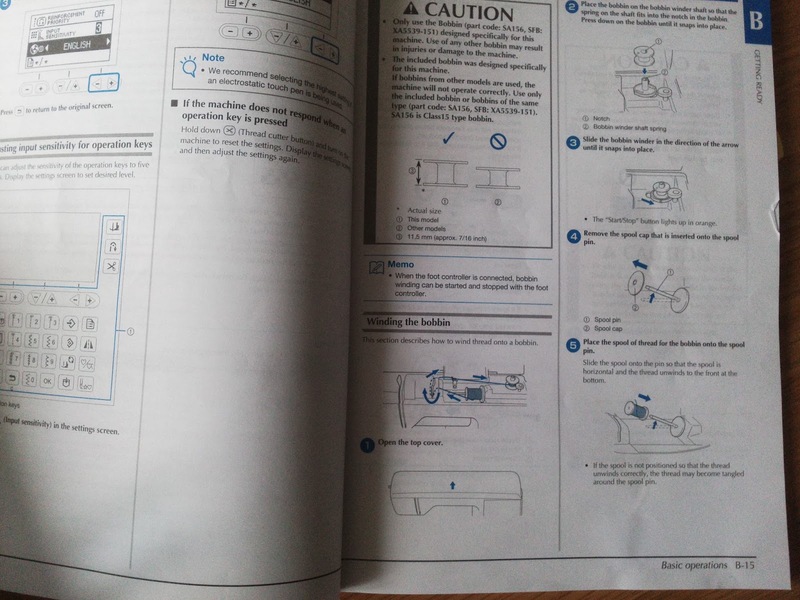 This is a copy of part of the instructions showing how to fold the binding. 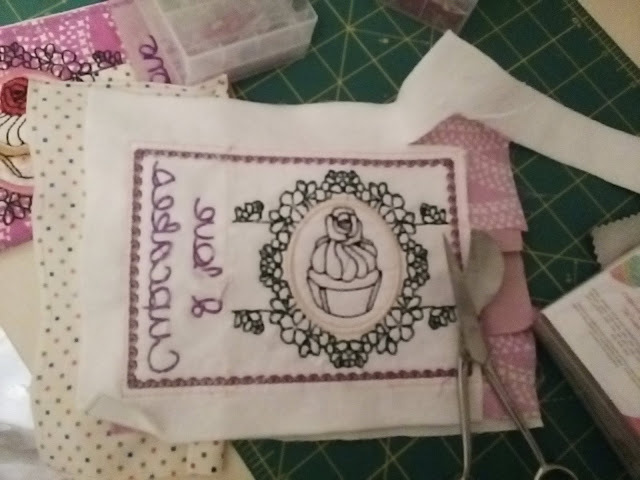 The next thing I must do is to make and embroider my own napkins, but for now these paper ones will have to do. ..... Or it is capable of standing when folded over . Just one size for this, and I love it. 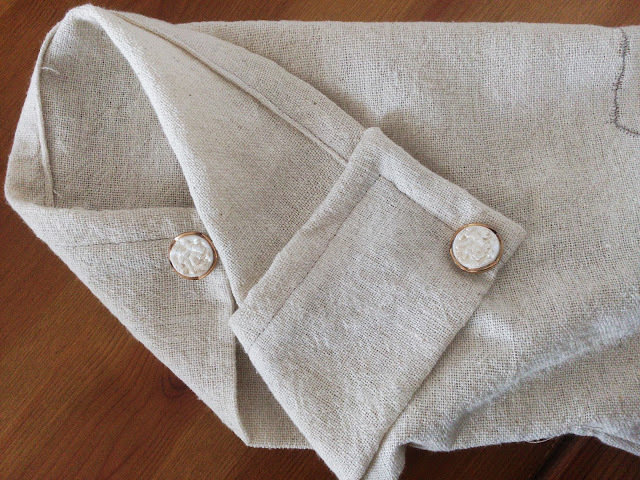 There is even a ribbon hooped inside to drape your tea towel over. This is so easy to make. 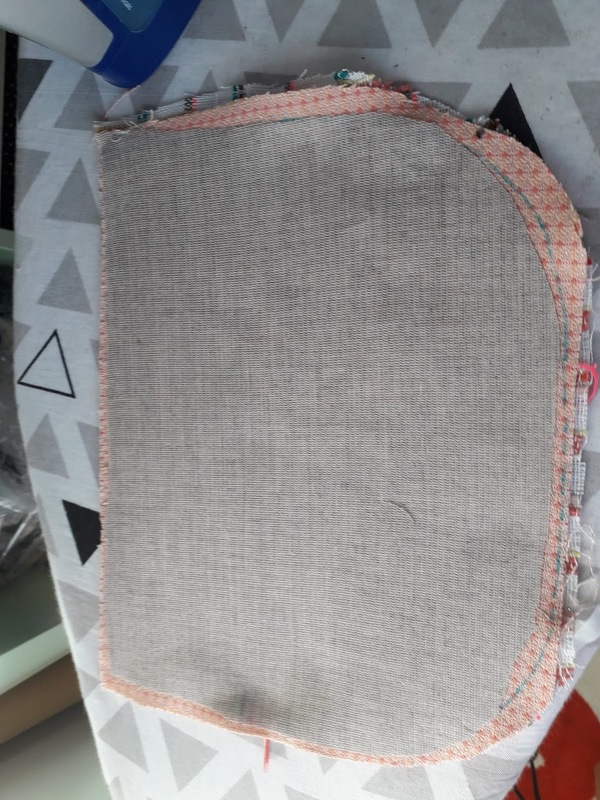 The back is made first and then new fabric is put into the hoop to make the front.the linings are attached to both pieces. The back and front are then stitched together with a piece of ribbon sandwiched between the front and back lining to hang your tea towel over. 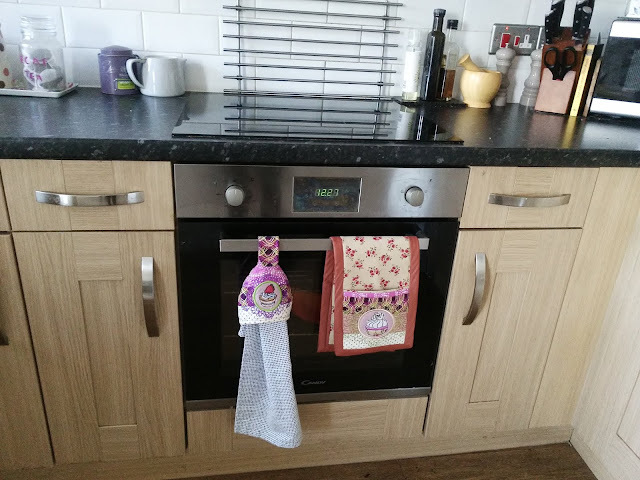 It even sews a buttonhole so that the holder can be hung over the oven door handle. The edge is bound in the same way as the napkin holder . 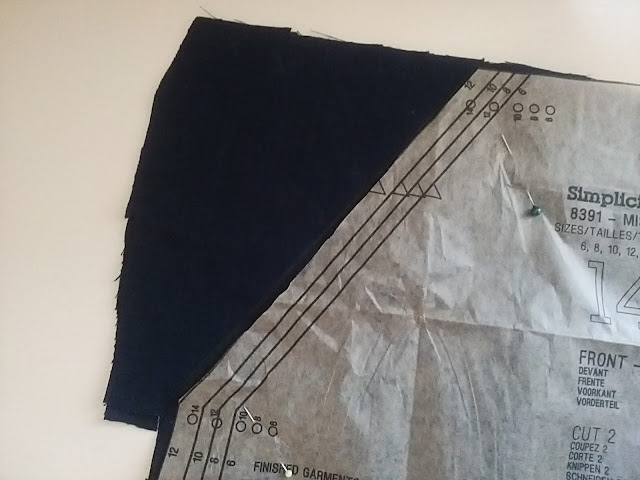 You do not need to cut your binding for either piece on the bias as it is not going round any curves, so use the selvedge as a guide. 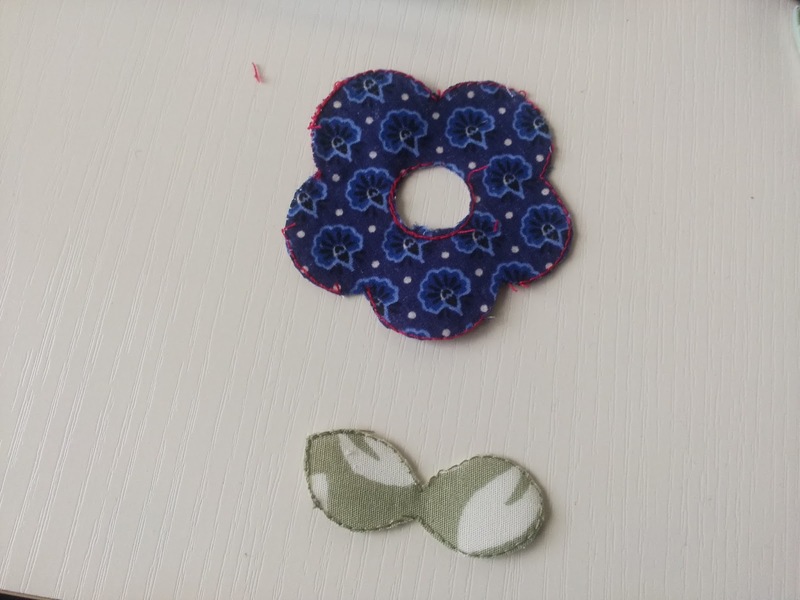 Fold it around your oven door handle to find the position for the button and sew it in place with button thread. 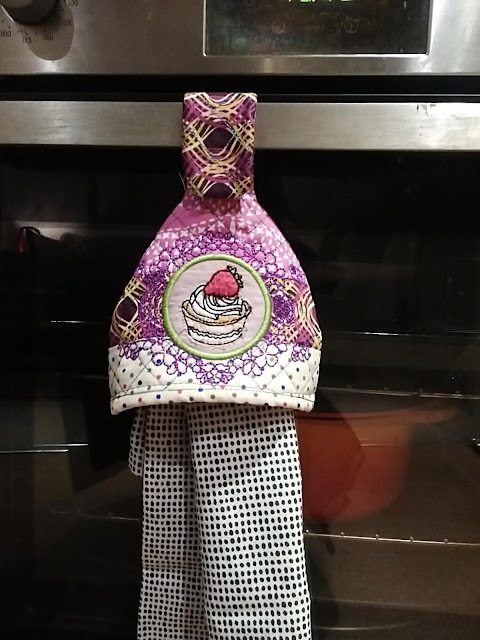 So, I made two mug rugs , one tea towel holder and a napkin holder. I am still making more mug rugs and some napkins and also some more of this collection for gifts. 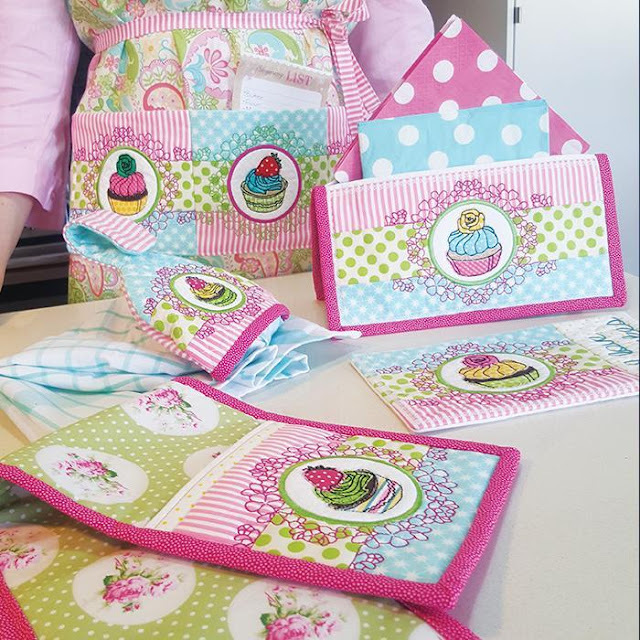 I also want to make the pot holders, then my kitchen is nicely kitted out. They make superb gifts, and you know that nobody else will have one just the same . If your friend has an embroidery machine the software itself will make a very welcome gift. 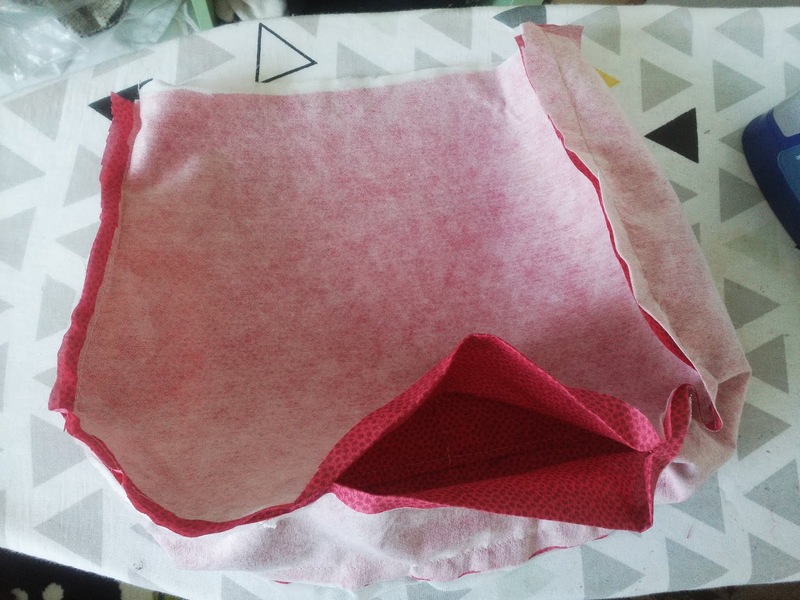 If you intend making the potholder then you need to use a special heat proof wadding, Vilene Thermolam compressed fleece is ideal. Some of the heat proof waddings are very thin so I would use a double layer just to be on the safe side . The basics are just the same as the mug rugs and tea towel holder, you build up each end of the pot holder bit by bit . The only difference is that a longer piece needs to be attached between them. For some of the embroidery I chose to use some of these Variegated threads by Madeira they are so beautiful don't you think? They come in lots of colours . I also like these Potpourri by Madeira they have a subtle speckled effect. There are other interesting threads, which I confess I have not tried yet, for example this one glows in the dark! Sulky Glowy embroidery thread .and this one looks fascinating Sulky Solar embroidery thread this changes colour in sunlight! Who said embroidery was boring! The pieces which form the pockets to put your hands in are sewn on top of the base "sandwich" of two layers of fabric with the thermal wadding in between. The edges then need to be trimmed ready for the binding. The binding has been stitched onto the right side - don't worry there are step by step instructions - and I have mitred the corners ready for sewing. I am also making another set as a gift for a friend. These are so pleasurable to make. These are all the three designs available from Jaycotts. The price today for each design is £19•50 which is very reasonable. For that you get the embroidery software to download and comprehensive instructions to help you. They are very very addictive so be warned! The machine really does all the work for you,. You just need to change thread and add various pieces of fabric and the design is sewn for you. Some basic hand sewing is needed to finish them off. 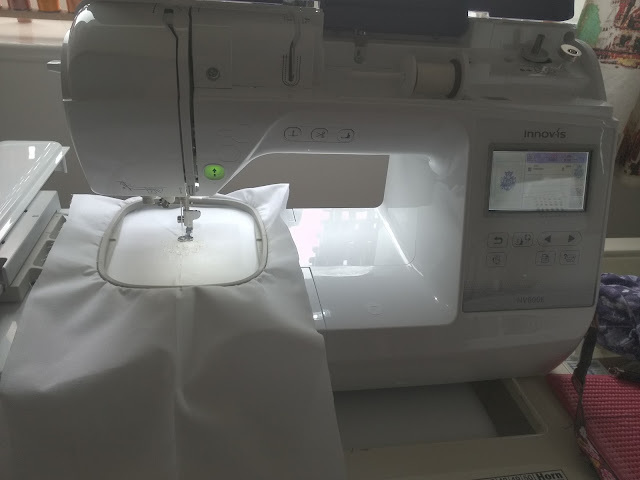 There is a huge choice of embroidery machines to consider and if you are considering one it is worth talking to the very friendly staff at Jaycotts who will help you to make the best choice for your needs. 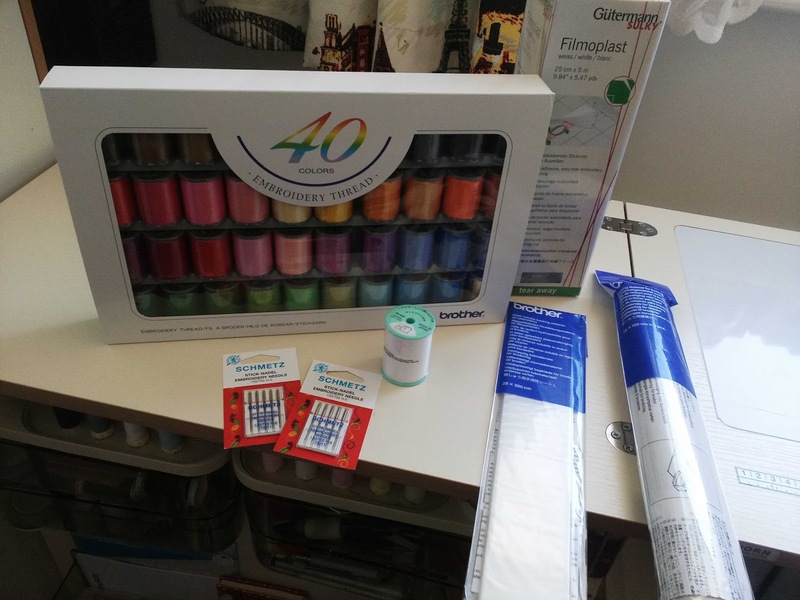 For enquiries about any products - sewing and embroidery machines, haberdashery, patterns and anything else sewing related Contact Jaycotts via the online contact form by telephone or by calling into their Chester showroom. 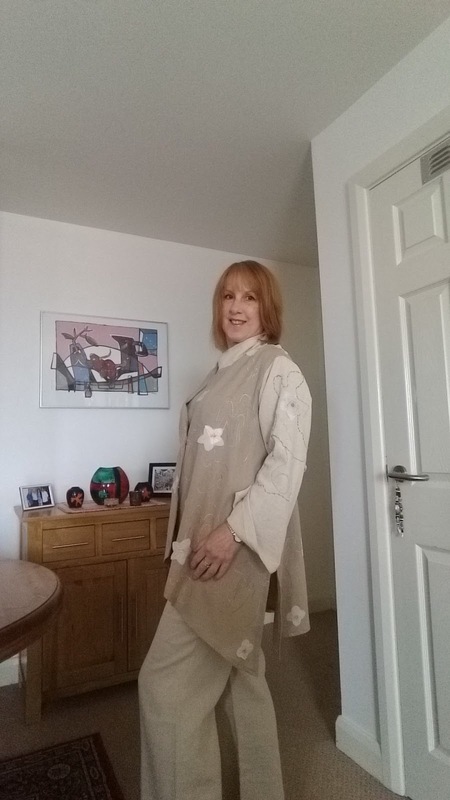 For sewing queries please contact me via the contact form on my blog or Jaycotts will pass a message on. Lastly a huge thank you from me to everyone mentioned for including me in this very special event. 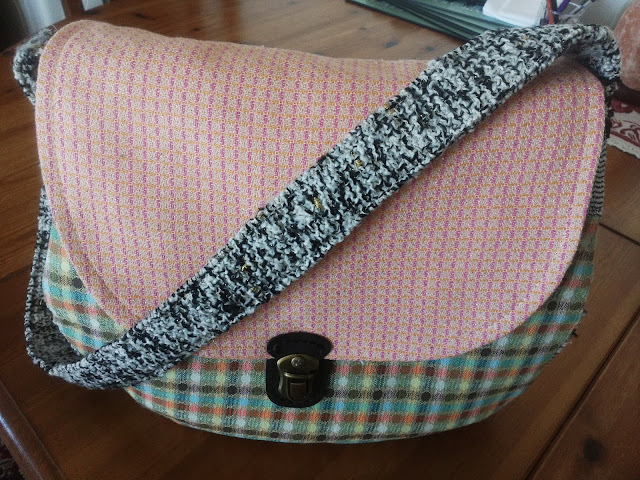 A post all about bags and what you need to make them. 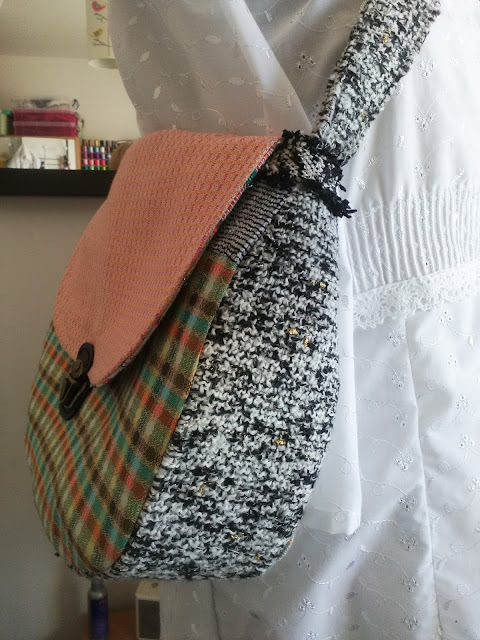 It's not difficult to make your own bags, in fact they are one of my favourite things to make. I use them myself and give them as gifts. Quite often I am out with one and I end up giving it away and then I have to go home and make myself a replacement! 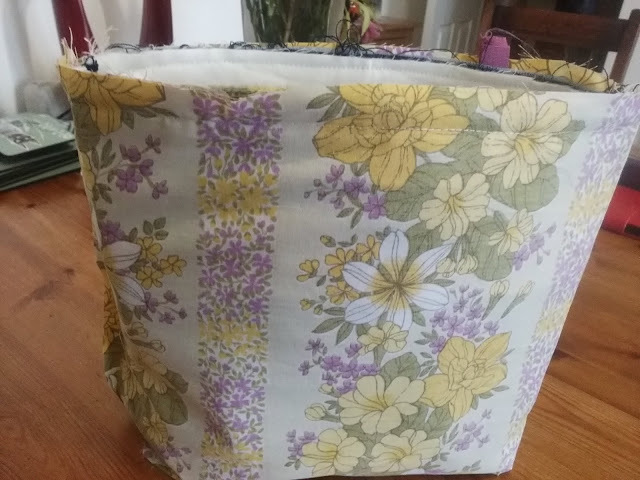 I sometimes make one to match an outfit or for a specific purpose, such as a beach bag,and I have shopping bags everywhere! 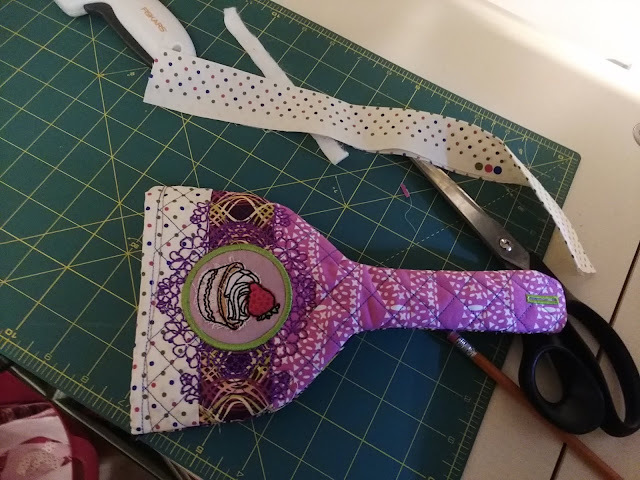 The other great thing is that once you have a few basic supplies you can use up odds and ends of fabrics which you would otherwise not have a use for. It's all win-win! This is one I finished last night, it's a saddle bag and I made it from remnants of tweed fabrics. This is a special bag which I made for my school bestie Margaret for her birthday. I was in such a rush to finish it and post it that I didn't take many photographs of it before it went off to Devon! My friend Melanie bought me this book for my birthday and I was itching to copy some of the fabulous bags. 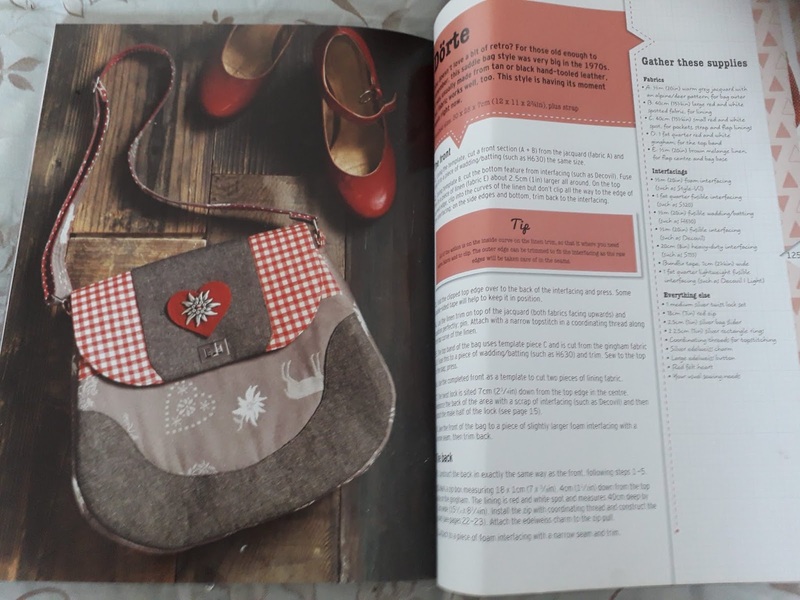 It is a great book as everything is explained in great detail and options given to make the bag purely yours. There are lots of ideas for trims and embellishments too. 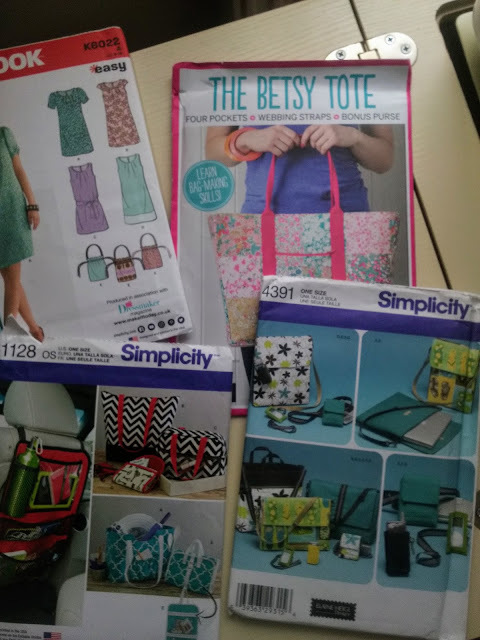 There are however dozens of great bag patterns from almost every sewing pattern company, these are just some from my stash. 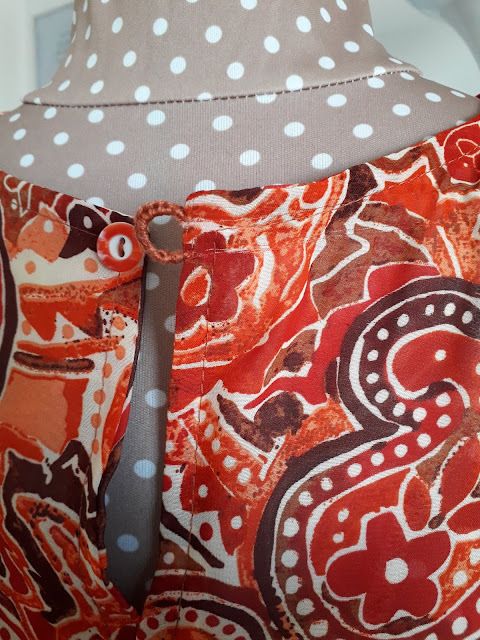 Many dress patterns come with a bag pattern too. If you take a look here, Bags and accessories you will find a huge selection of bag patterns from clutch bags, tote bags, handbags and lots more in between. Think about what you would like to make and buy a pattern. 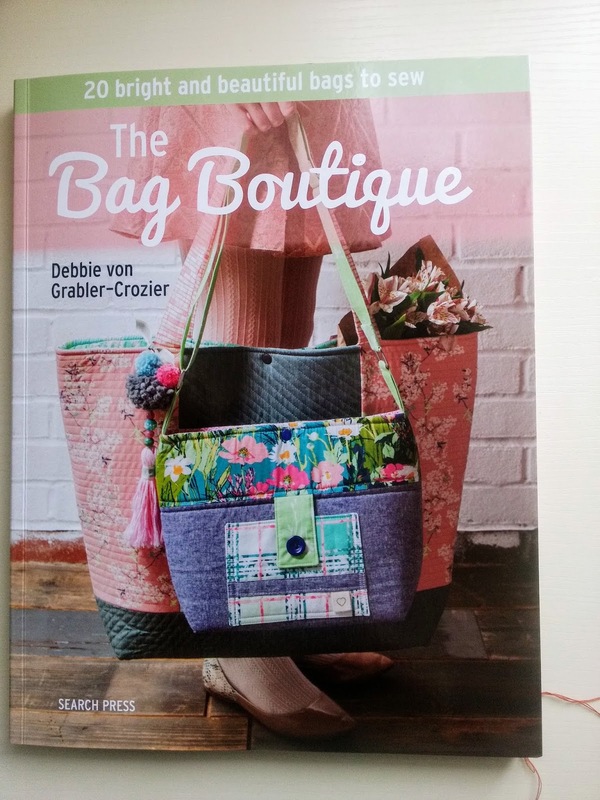 As you become proficient in bag making - and you will because it is addictive - you will find that you don't need a pattern at all, just an idea. For Margaret's bag I chose the Claudia bag from the book. Of course you do not have to use the fabrics suggested, you can use whatever you like which is of a suitable weight. My main fabric for this was denim. I wanted to include some fabric which has been in her family for as long as we can remember so I used it for the bag and pocket linings. It brings back lovely memories for her everytime she looks inside. 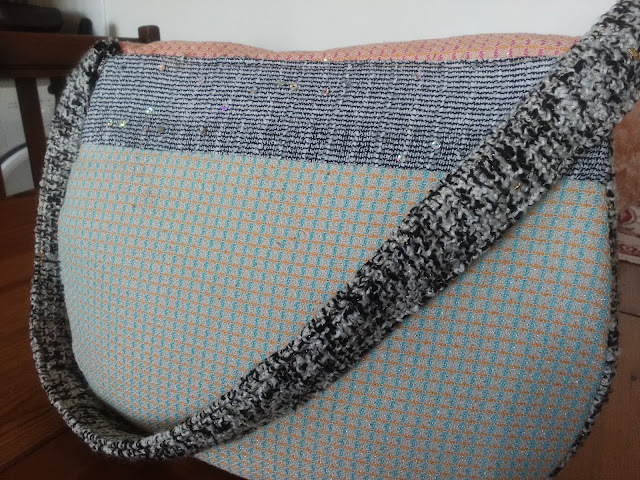 All bag patterns explain what fabric you need and usually you can use your leftover scraps from other projects, or fat quarters, as they really don't need much fabric. 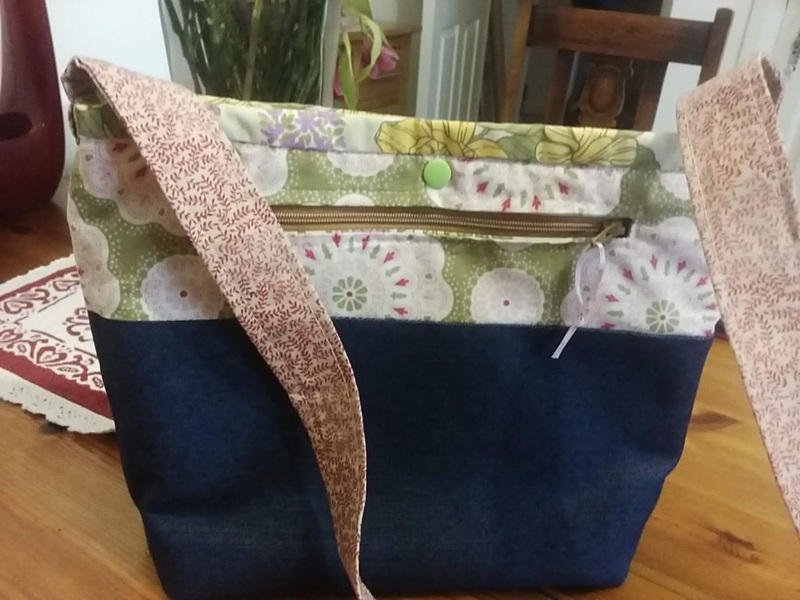 You could also use smaller pieces to make a patchwork bag. The bag has an external zipped pocket, don't be afraid of this as they are far easier to insert than a dress zip! Use a plastic zip or a special bag zip . 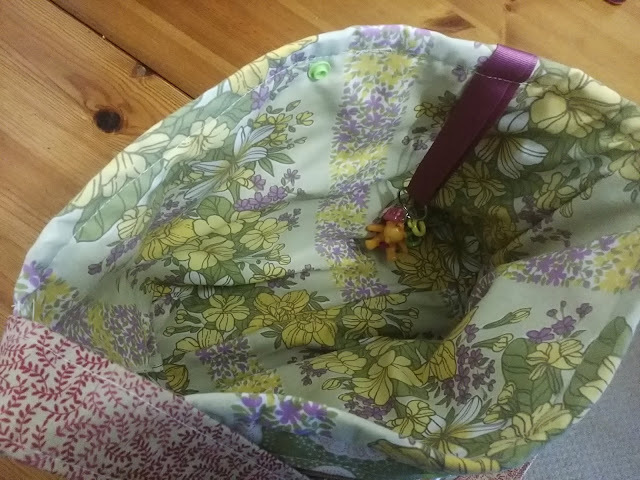 Place the right side of the pocket to the right side of the bag, centering it exactly. Machine stitch around the outside of the markings and carefully cut along the centre line and corners taking care not to snip your stitches. Then "post" the lining through the hole, straighten it all out and give it a good press. This is your zip opening. 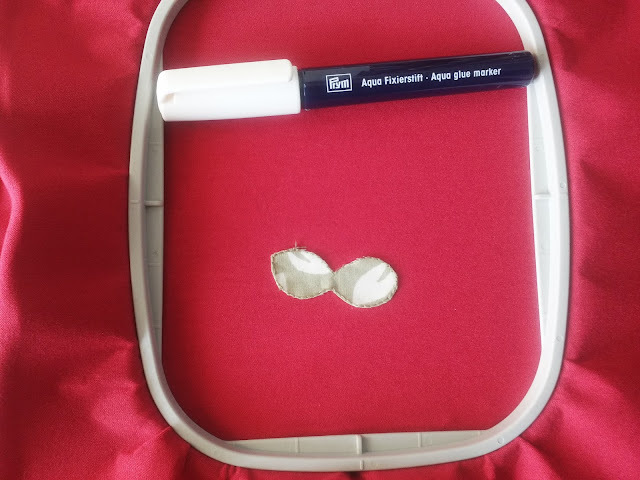 Use some Prym wonder tape to stick the zip on the reverse of the bag, centering the teeth and making sure that it lines up as perfectly as possible. This is the back of the pocket with the zipper stitched in place. And this is the front. Beautiful! 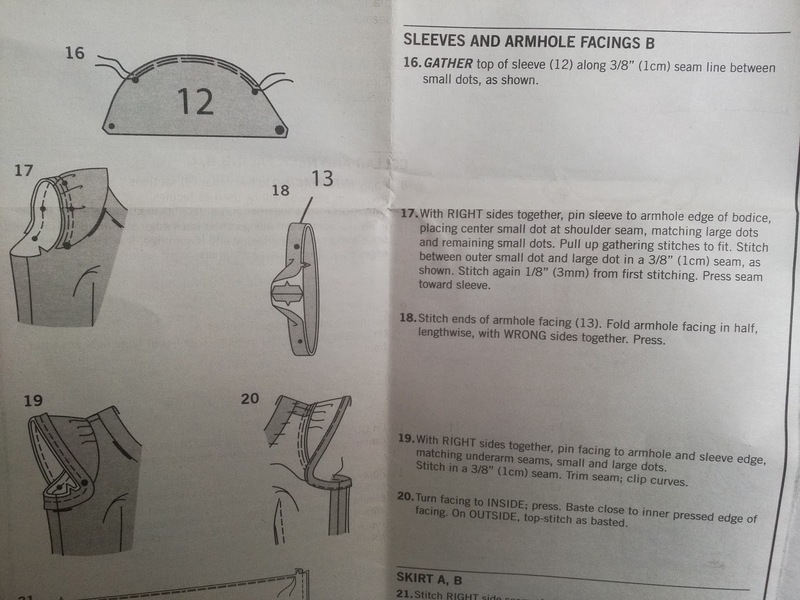 Don't worry about the lack of instructions here on this post because whatever pattern you choose comes with all the instructions you need. 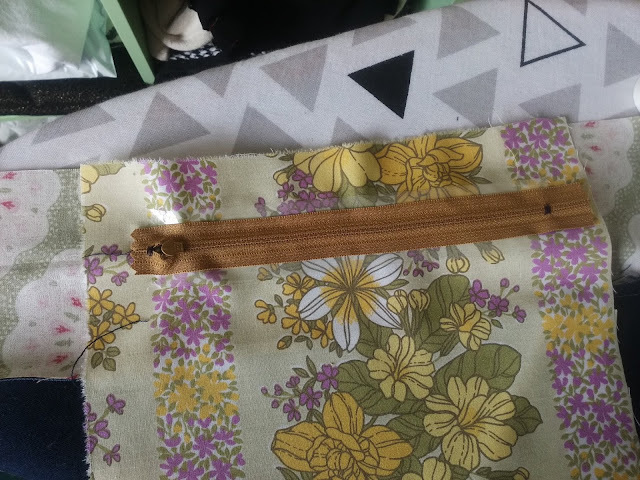 The back of the pocket bag has been stitched down the sides. 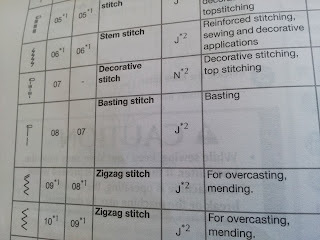 Go over your stitching again for strength and if your fabric frays a lot then use your overlocker too. I'm now making the tab with which to close the front patch pocket. 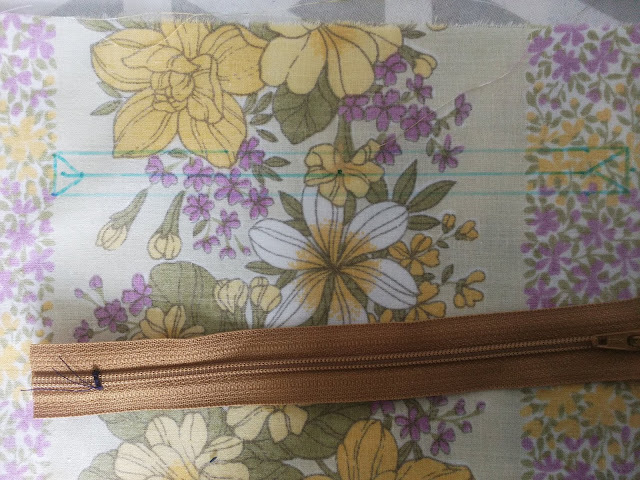 You will need to line this - and the bag itself , with a specialist interlining. I used Fusible volume fleece but there are others such as Decovil depending on the finish you require. 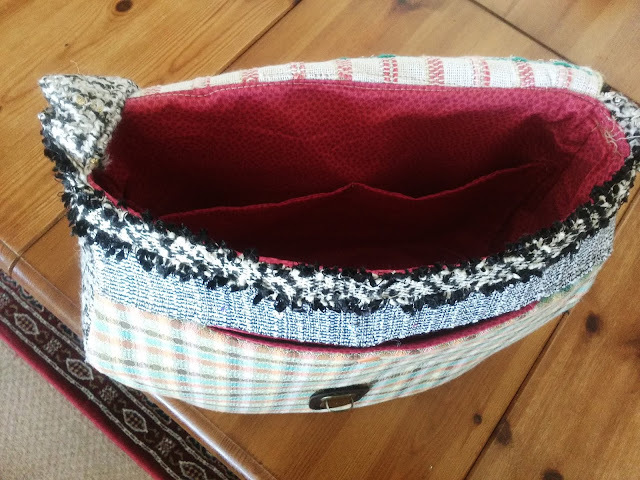 The finished tab is stitched between the lower and upper bag front. Another product which I absolutely love are these fabulous colorful poppers from Prym. This Colour snap kit represents great value for money or you can purchase individual packs in a variety of shapes and colours. Just look at these Various snaps there is every colour you can imagine, including packs of mixed colours. They are much easier to insert that the metal ones too and much more fun in my opinion. The poppers are extremely easy to put on just remember to put them in place as you go along otherwise you may struggle to fit the plyers over large areas of fabric. This is the closing for the patch pocket. 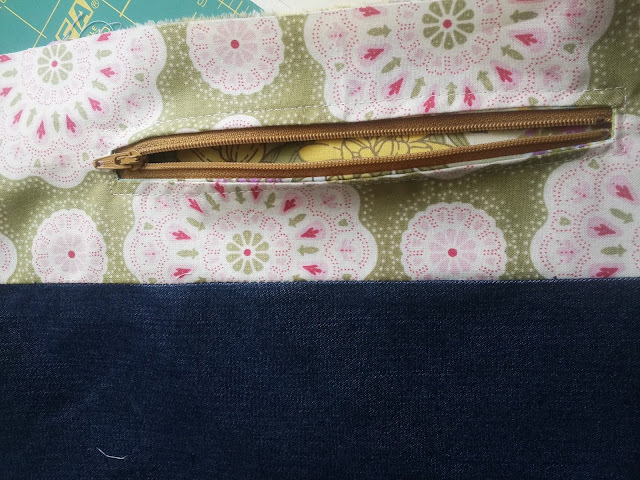 The pocket is two rectangles of fabric, one layer of volume fleece, sewn together, leaving an opening at the bottom to turn the pocket the right way out. Press and sew in place. On any bag if you wish to create a base then simply cut two-inch squares from the corners of the bottom of the bag. 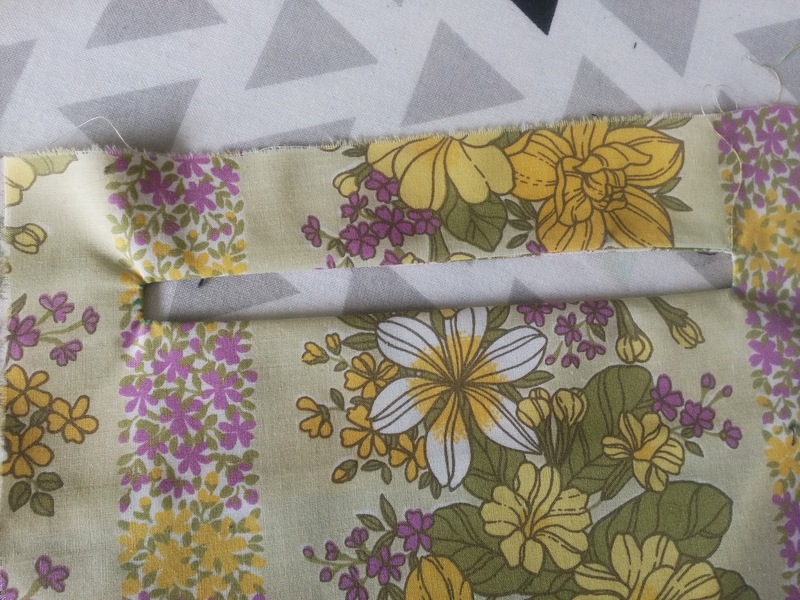 Bring the side and lower seams together and stitch across, matching the seams. I glued some extra decovil on the base to keep it firm. Make the lining in the same way. Using the made up front and backs as a template. You can add zippered or patch pockets if you want them. There are various ways to make the handle. This is where you decide how long you want the handle to be. Do you want a shoulder bag, a cross body bag or a handbag?. You decide. Try a few lengths out and see what works best for you. To make the straps I actually use waistband facing Folda-band is perfect for this. Simply iron it on the reverse side of the fabric and using the perforations fold the edges in and then fold it down the middle . Stitch close to the edge along both long sides. Or you may want to use a ready made handle , for example Bag handle handles can be in leather or chain or plastic. Take a look at the Bag handles available at Jaycotts. 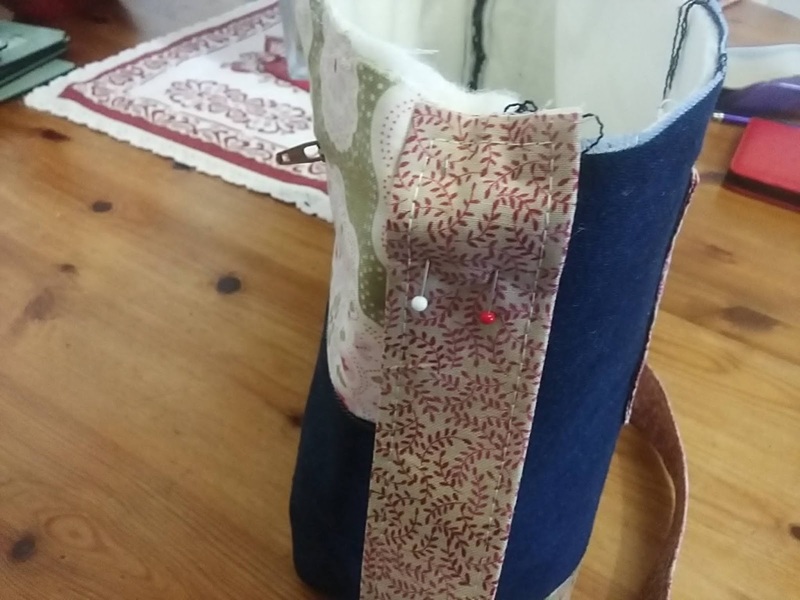 Pin and sew your finished handles to the sides on the outside of the bag. 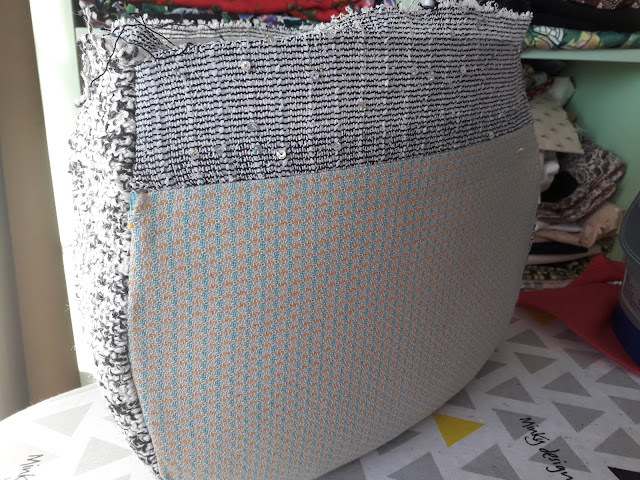 Make up the lining but leave a large opening at the side or bottom to enable you to pull the entire bag through to the right side. 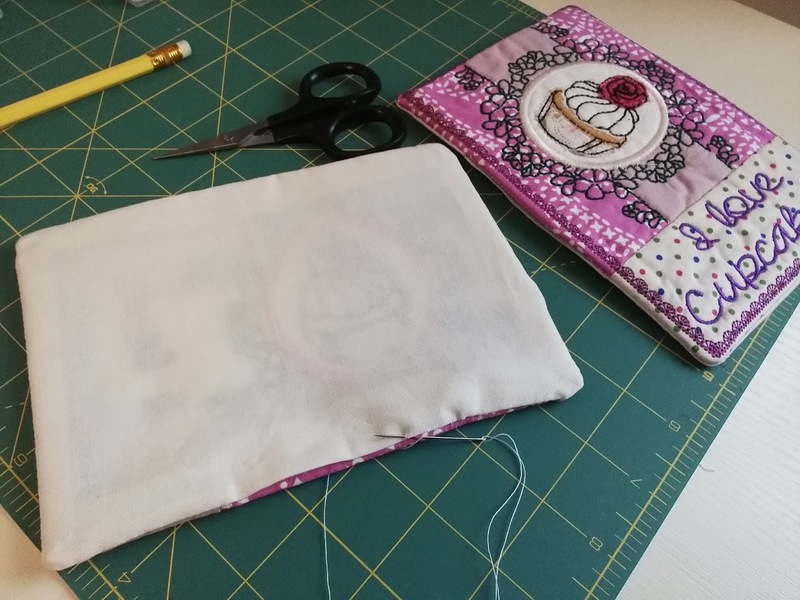 Put the bag inside the lining, right sides together and sew along the top edge. 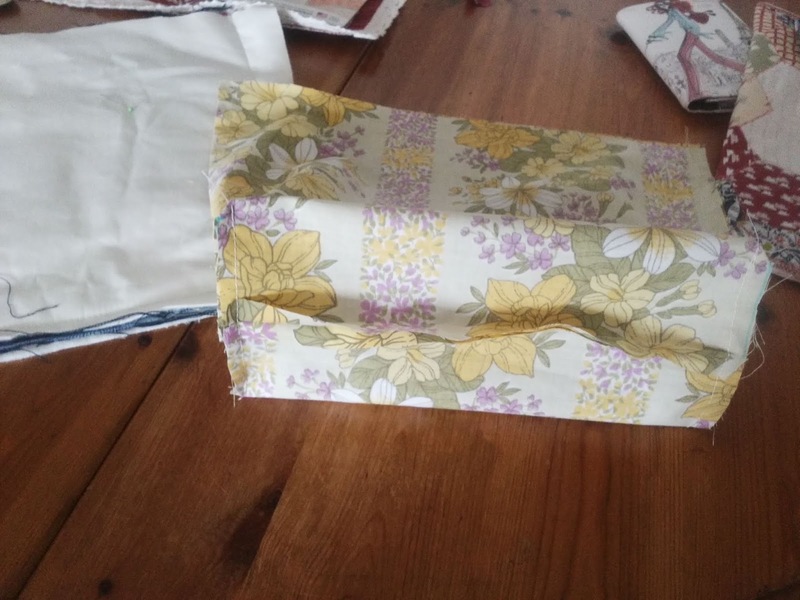 Pull the whole lot though the opening in the lining and then either machine or hand stitch the gap closed. It will be hidden on the inside of the bag and won't be seen. I inserted a ribbon with a key ring on the end before stitching the top. I added a fun charm as I knew Margaret would love it. An empty key ring is always useful I find - no more hunting for keys! I added another popper to close the bag at the top. This is the finished bag,pressed and ready to be posted. As I said earlier though I wasn't so much of a rush that I forgot to photograph the front with the pocket. 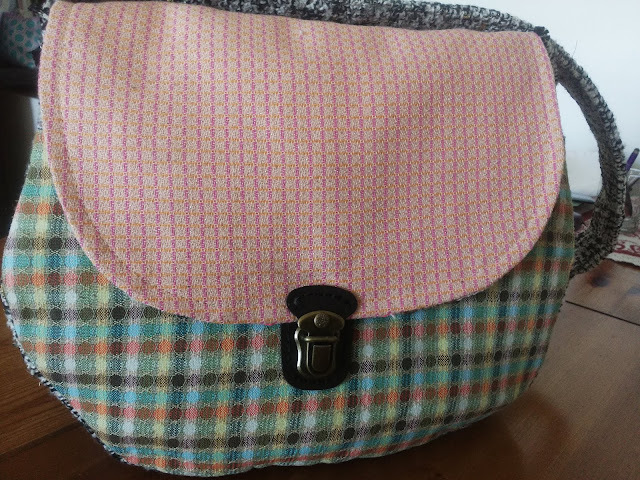 For the next bag I wanted to use up all the short lengths of tweed fabric I have in my stash. I chose colours which complemented each other. had just about enough fabrics to cut the basic bag out, but not enough for the curved additions at the bottom of the front and back. Not that it matters because the bag looks great without. 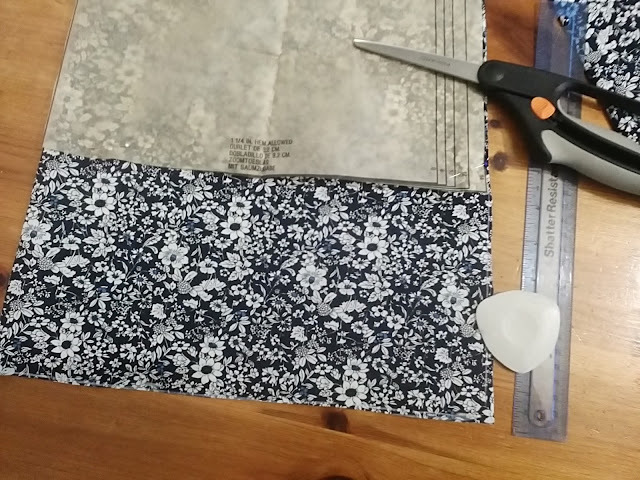 This fabric frays so it is important to cut plenty of seam allowances and sew large seams. 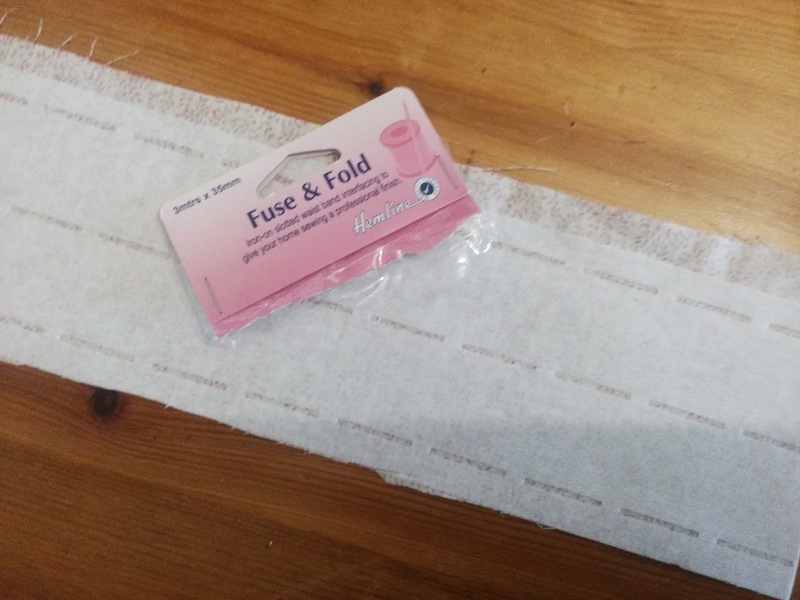 This is the fusible volume fleece in place. The pattern suggested an external zip similar to the previous bag, but because of the way my fabric frays I decided to add a pocket between the top and bottom sections of the front, to be hidden under the flap. 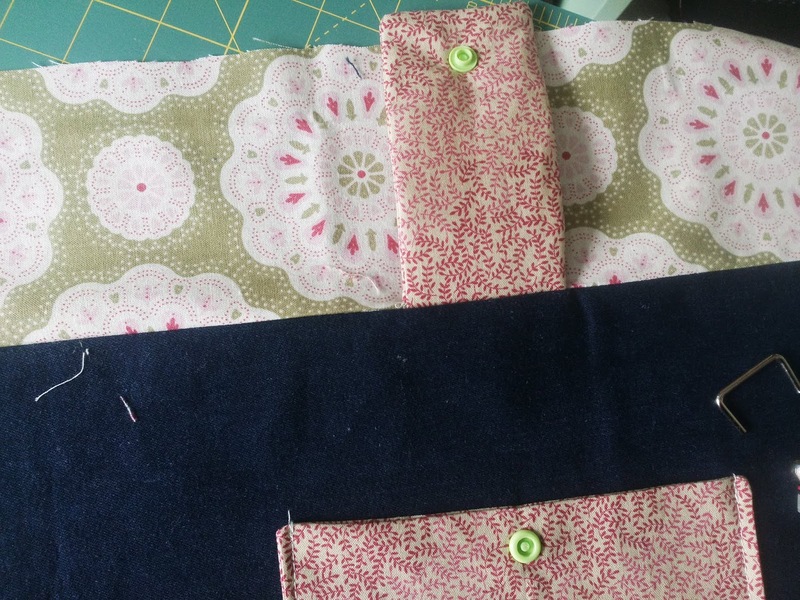 This is the pocket section being sewn onto the lower part of the bag. 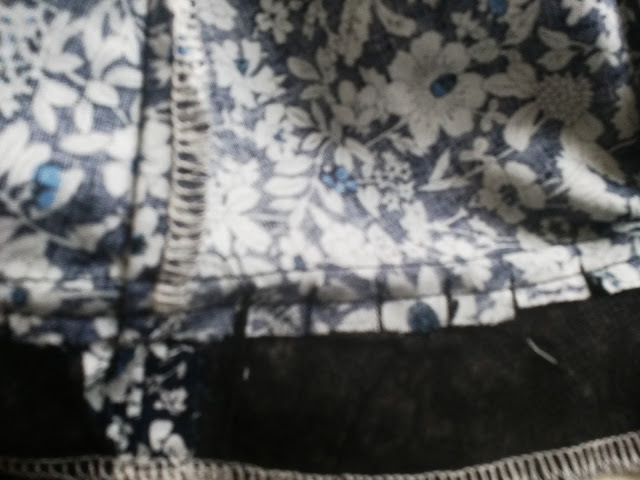 It is not clear here but I did interface the pocket with normal medium weight interfacing. 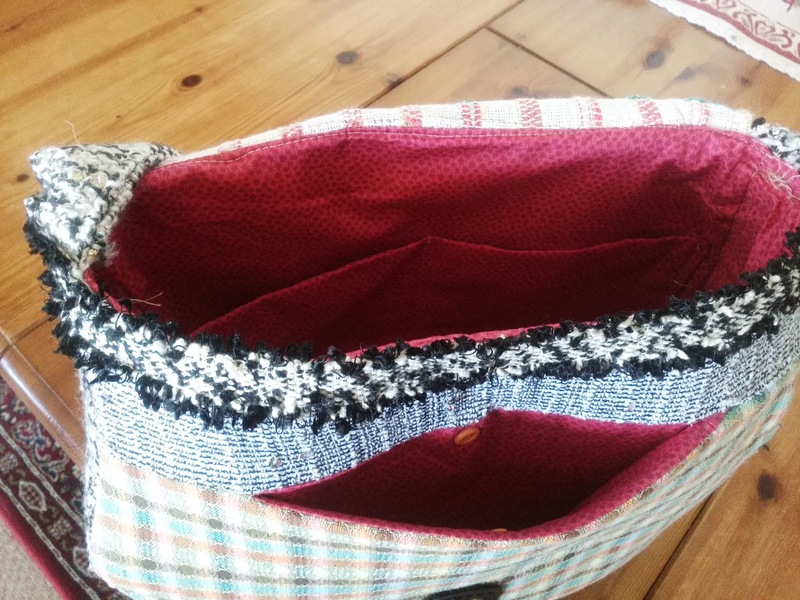 Once the sections are brought together the pocket will sit neatly inside. Once the bank front has been pressed you can hardly see the pocket. I added a popper at this stage to keep it closed. 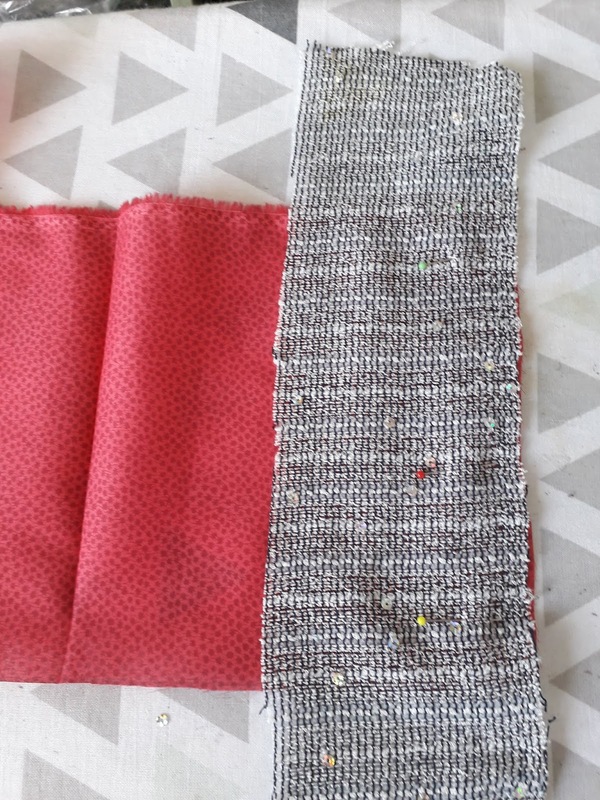 This pattern has a gusset so once the fusible fleece has been ironed on pin and then stitch the gusset onto the front. Stitch as close to the fleece as possible. Don't be same with the back. This is the basic shell of the bag. To make the pocket flap I interfaced both the front and the back pieces with a Woven iron on interfacing .this will give structure to the flap whilst still allowing it to remain flexible. Stitch the lining together but leave a large gap at the bottom of one of the sides. Make the handle as in the previous bag and attach them to the sides. 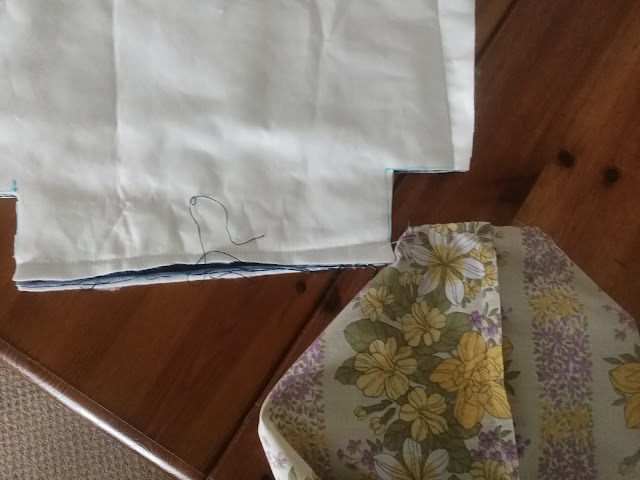 Pull the bag through, turning it right sides out and stitch the gap closed. 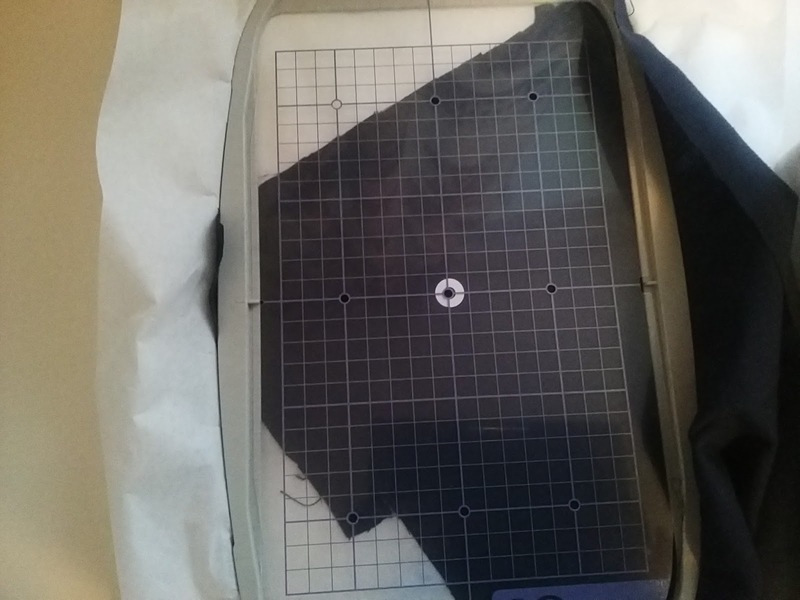 Press all the seams using a sleeve board. Add a trim along the front top edge if you like. 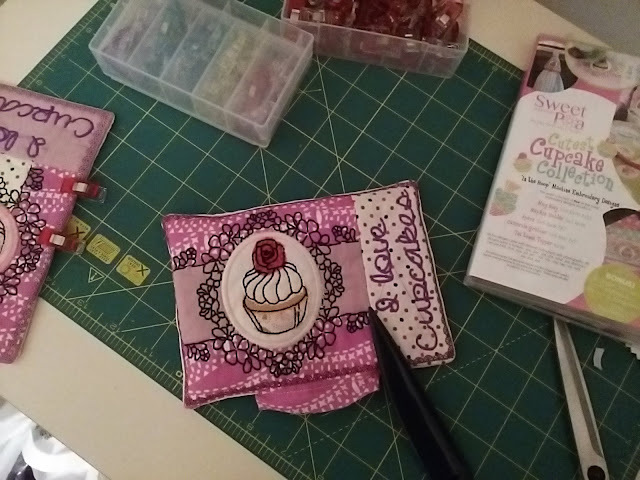 The nicest thing about bag making is that once you understand the basics you can make them whatever size you want, in whatever fabric you want - there are no restrictions. You can embroidery them, applique them, make them out of faux leather or basically anything. 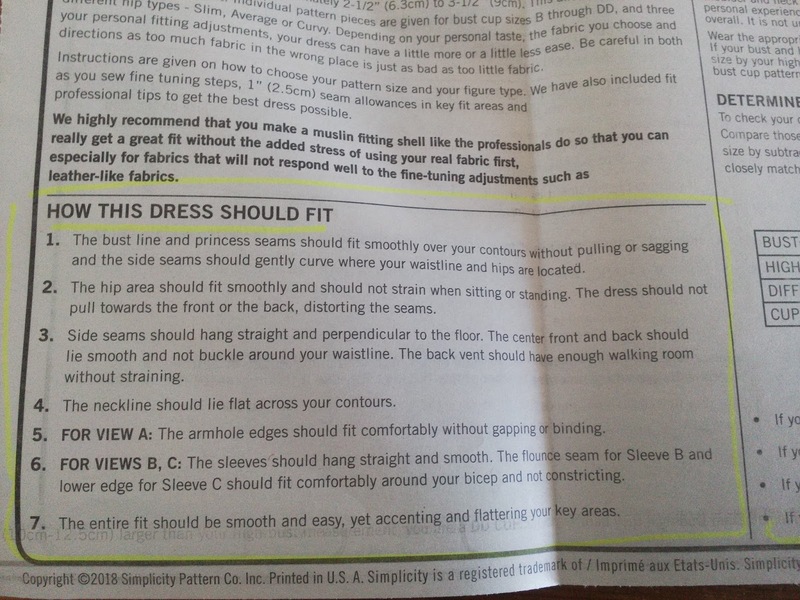 I would steer clear of stretch fabrics though for obvious reasons. I hope that you are tempted to make your first bag, so go to the bag making supplies on the link above and choose your pattern and hardware. 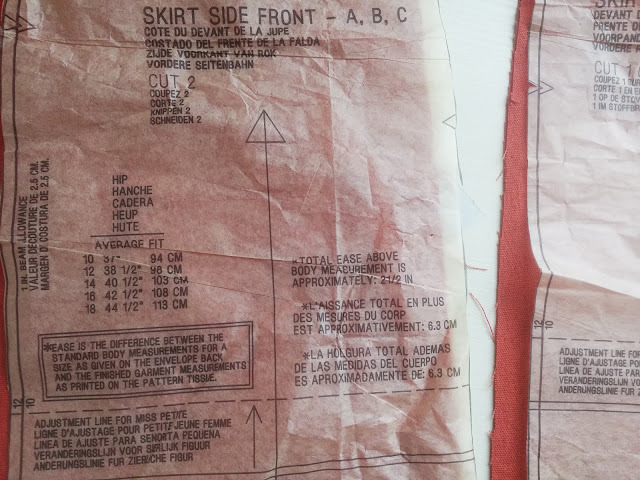 The interfacing requirements are on the back of the pattern envelope, if you struggle, then Jaycotts will be happy to help so give them a call. If you have fabric left over from your recent project then why not make a matching tote as I did? 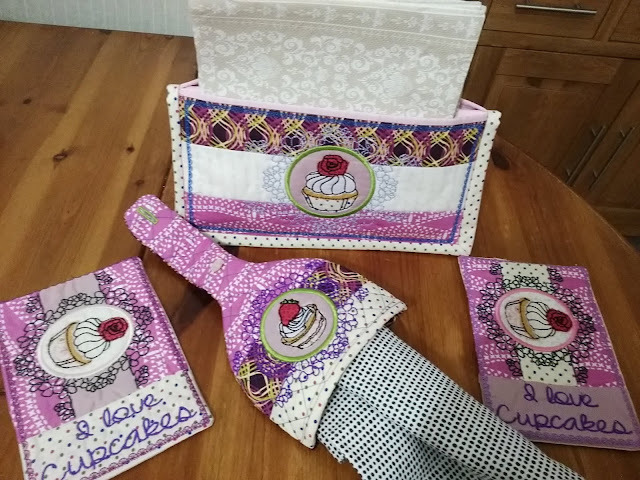 Don't just stop at handbags and tote bags, why not make lap top, mobile phone or glasses cases? 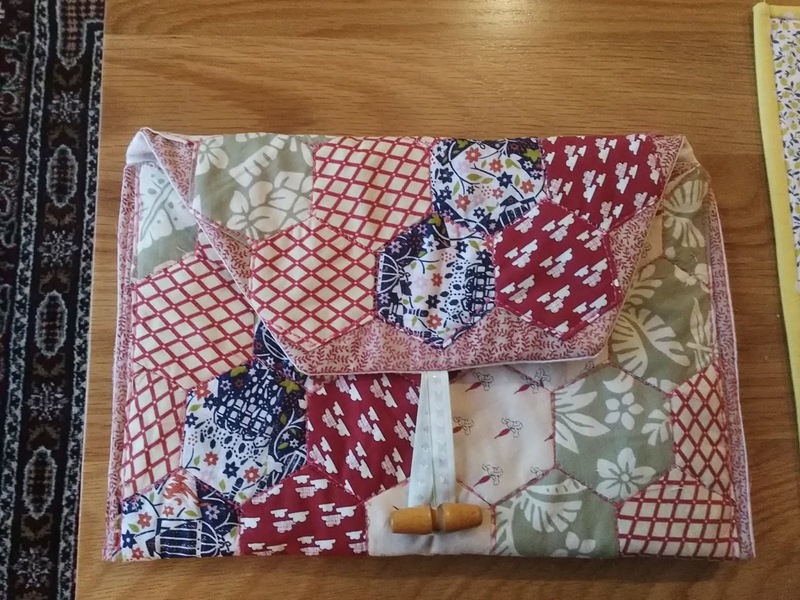 This tablet case was made using English Paper piecing. For more ideas and instructions please read my previous bag blog and learn how to make simple tote bags - we all need them for shopping now, also included is the large red bag. Thank you for reading this post. 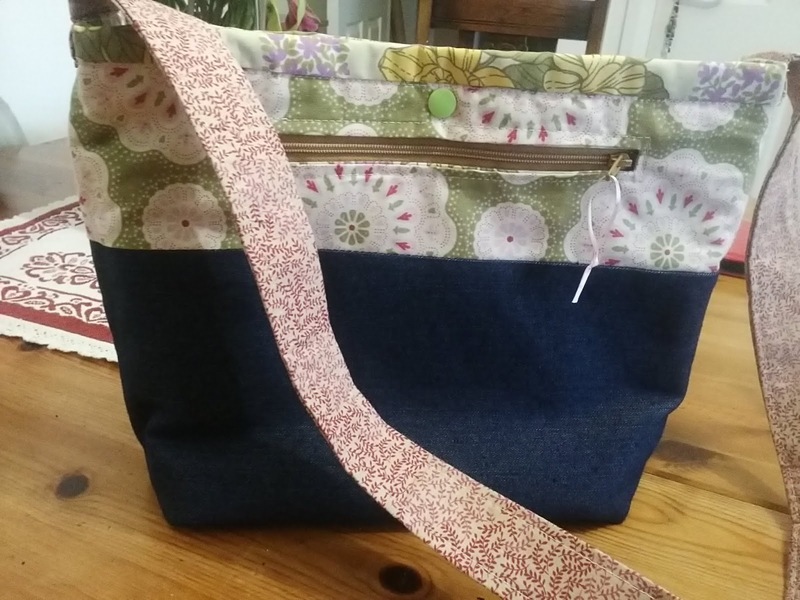 Bag making is extremely enjoyable and can be as simple or challenging as you like. 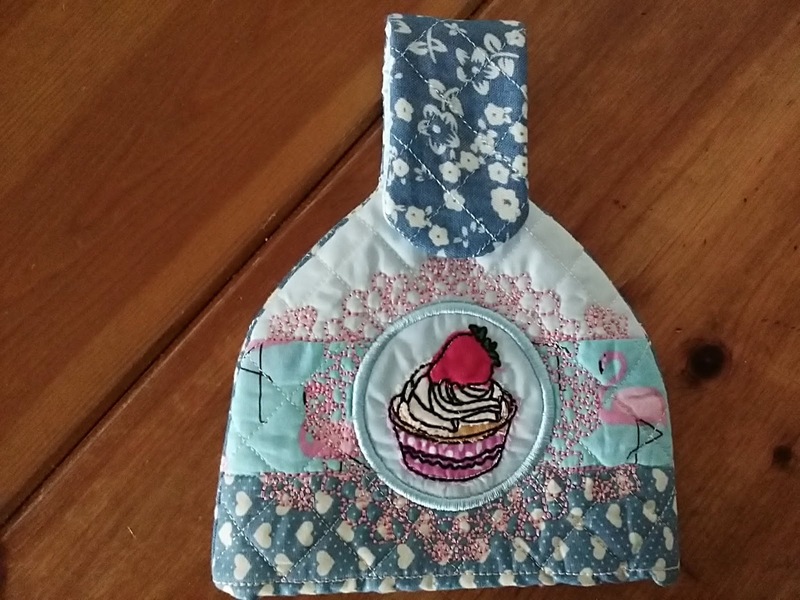 It is also a great way to use up your scraps of fabric or to find a beautiful way of using a piece of fabric which holds special memories. 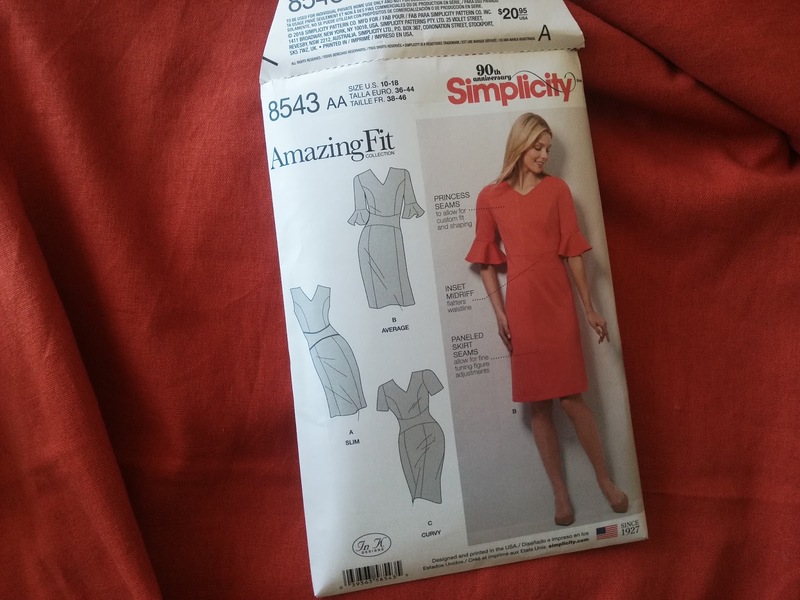 This is a Simplicity Amazing Fit Dress if you have not made an Amazing Fit pattern before then you should. This pattern has a choice of sleeves, a shaped midriff and a flattering neckline. More importantly it has many different size variations within the pattern. It comes in two choices of size ranges, 10-18 and 20-28. The princess seams are very flattering for any figure and you have the option of sleeveless or a short sleeve - with or without a flounce. The pattern gives comprehensive instructions on how the finished dress should look on your body, so I do suggest reading the pattern thoroughly before you get your scissors out! The pattern has a very good guide on how to choose your correct pattern size and how to take your measurements. There are separate pattern pieces for A to DD on the pattern size I chose which is the option for sizes 10-18. And there are also separate pattern pieces for slim, Average and Curvy fit. Once you have determined your correct size - don't just guess - cut out the pieces you need. There are plenty of fitting variations within the pattern. 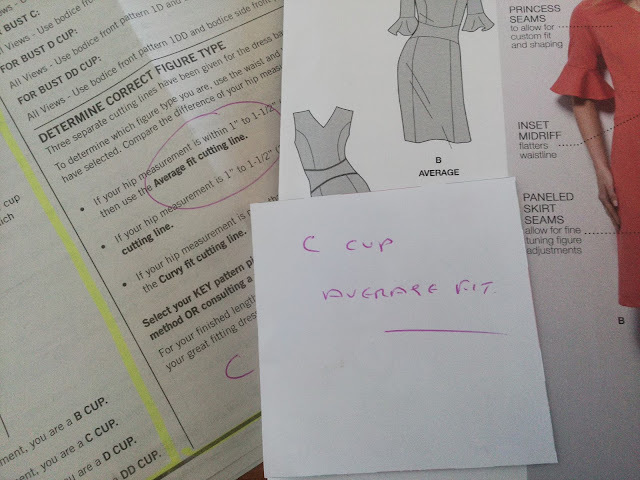 I took my measurements and determined that I am a size 10, C cup, average fit. I found out later that this was too big, but more about that later. I took a piece of fabric which I didn't want and cut the pattern out. I did not cut out facings or sleeve flounce as they are not needed for a toille. 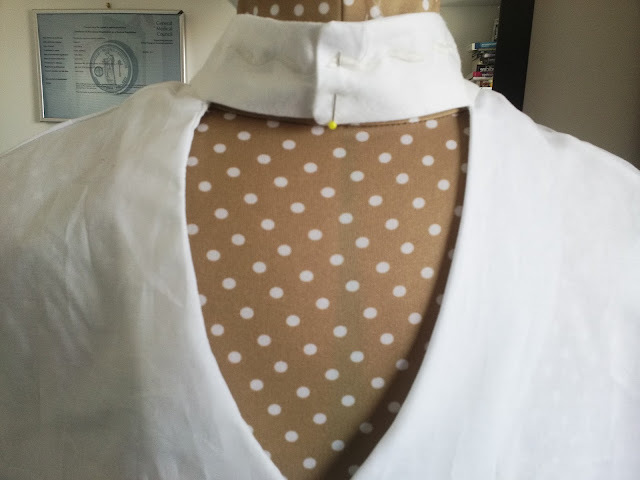 The idea of making a toile or test garment is to just tack together the main pieces for fitting purposes. I really do feel that this is a very important stage and should not be missed out. It really is worth the extra effort. The manual gave me the correct settings and it was quick and easy to put the garment together this way. 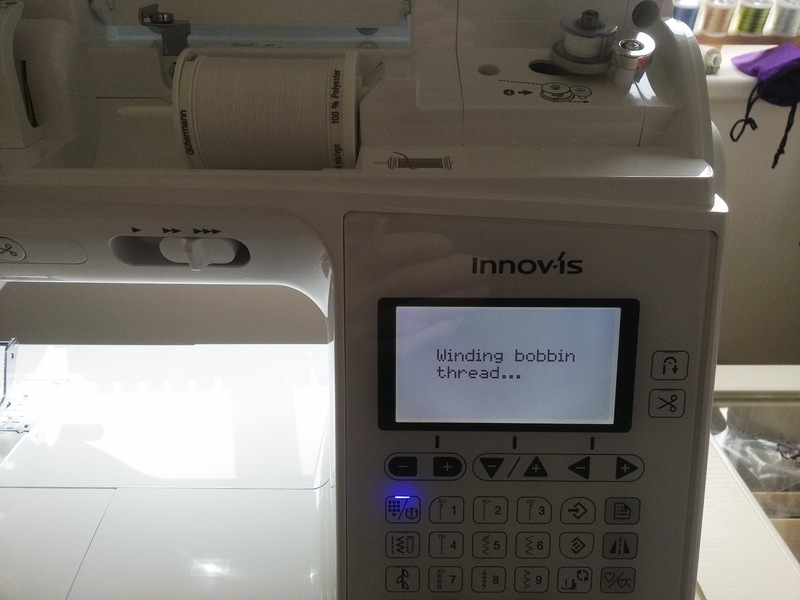 My sewing machine is the amazing Brother Innov-is 1300 and I love it. I wrote a review about it if you would like to read it. 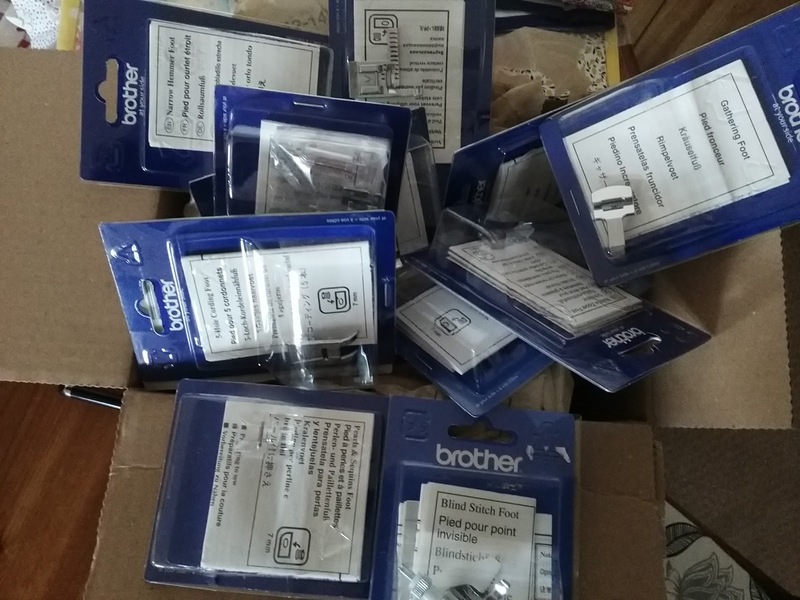 Review of the Brother Innov-is 1300 it isn't machine I would certainly recommend to anybody. If you are interested then give Jaycotts a ring and have a chat about it. The machine is so easy to use. The large LCD touch screen shows the selected stitch, the foot you should use and options for stitch length, width and tension. This is the toile of the bodice. Hmm, in true Angela style it is far too big! The reason I am having a situation with sizing at the moment is that I changed my diet to eating healthy food. 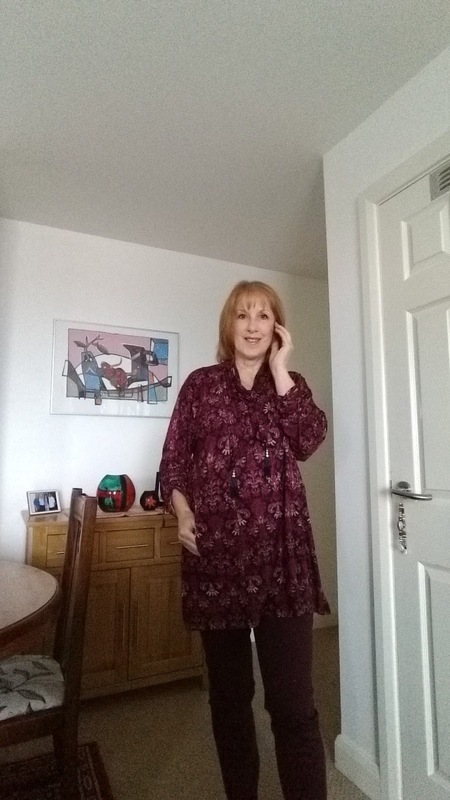 The result of that is that I have dropped two dress sizes. I didn't intend losing weight, it just happened. 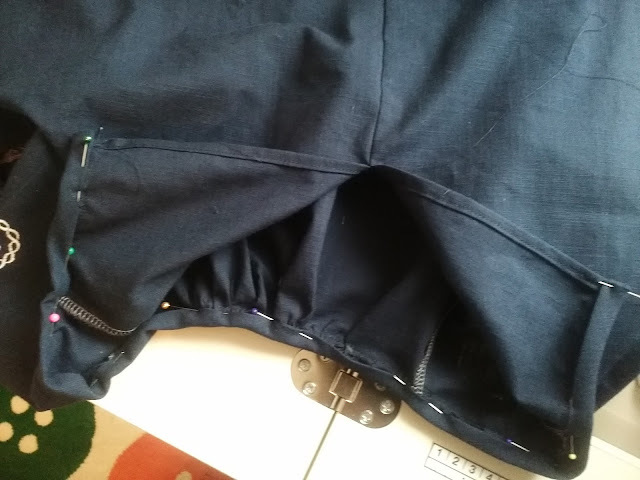 Unfortunately ( or fortunately depending on what I am making) I was trained as a Tailor and it was drummed into me to always cut larger seam allowances, so " just to be on the safe side" I always add extra wriggle room when I am cutting out. I wish I wouldn't! 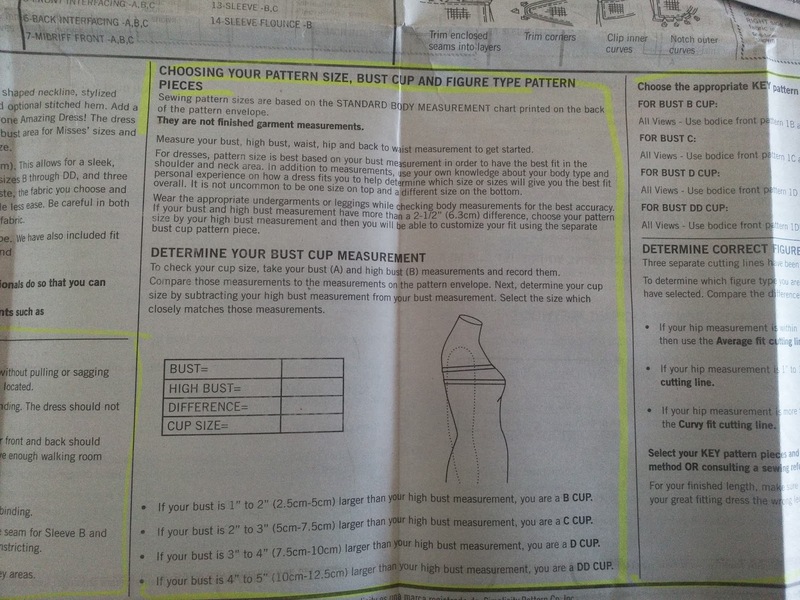 I wish I would trust my measurements! Also this pattern has a large seam allowance in key areas of 1" - almost twice the usual seam allowance of 5/8" . Plus it has a large amount of ease. The result was that it didn't fit me anywhere at all! So, back to the drawing board. I made three test garments in all and ended up with a much smaller size. I remembered to tack each stage and try it on for fit as I went along. 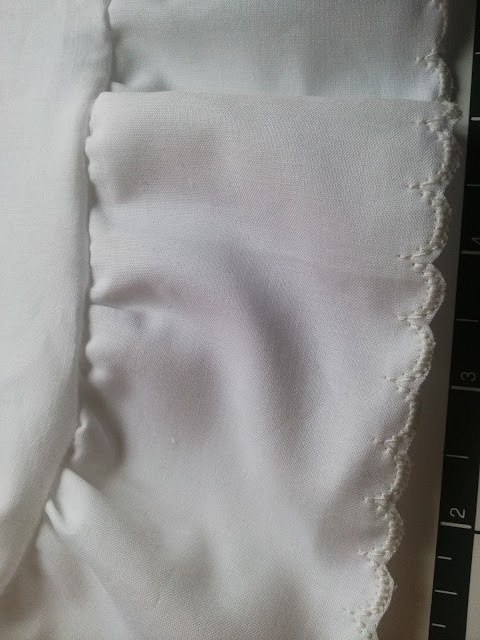 The fabric I chose is a pure linen which frays notoriously and I did not want any strain at the seams or the seam would disintegrate with wear, so I did not make it too close fitting. 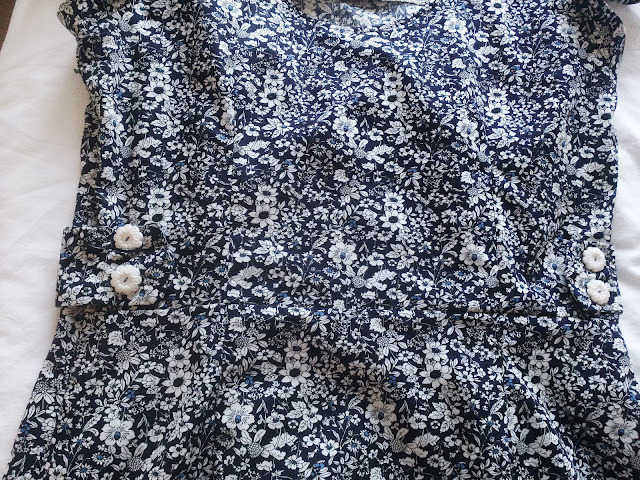 Had I chosen a cotton fabric instead I would have made the skirt closer fitting. 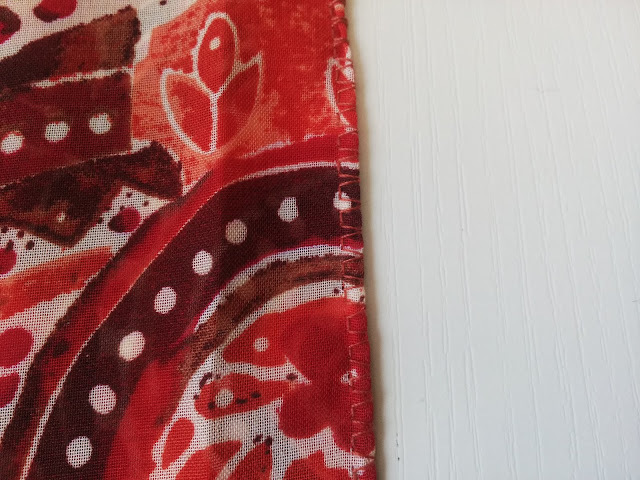 The fabric looks similar on the right and wrong sides so to make sewing the garment easier I used a cross in ordinary Tailors chalk on the wrong side of each piece. 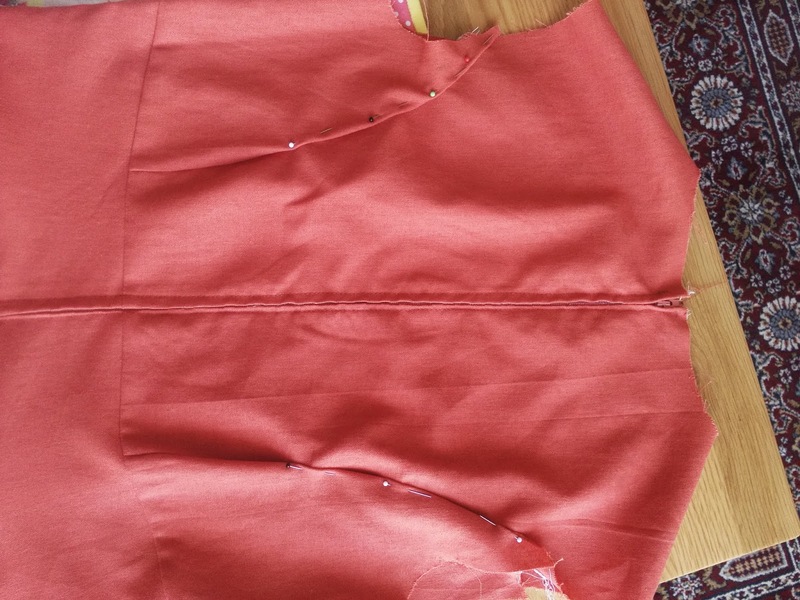 Make the garment in stages, first the front bodice, attach the front skirt then do the same for the back. 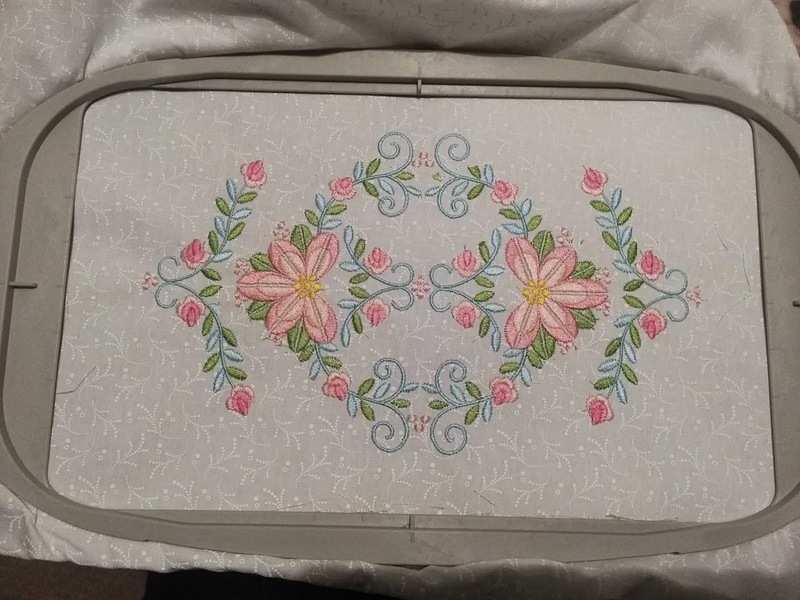 The midriff panel called out for a touch of embroidery - any excuse to use my Brother Innov-is 800e embroidery machine. I chose a very simple design which I have actually used before. The machine has many designs already built in, but there are plenty to download off the internet and many are free. Jaycotts do stock some embroidery designs so please telephone for more details. They also sell a wide range of stabilisers and accessories. The stabiliser I used is Film-O-plast. 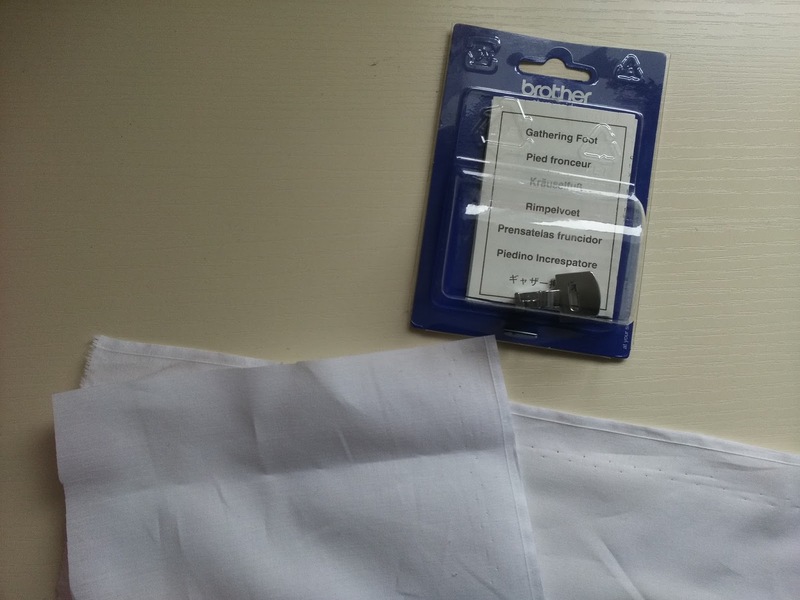 This is a self adhesive stabiliser which is very useful when the fabric you want to embroider is slightly smaller than the hoop you need to use. Do make sure that the fabric is very secure though because if it moves around your design will pucker. 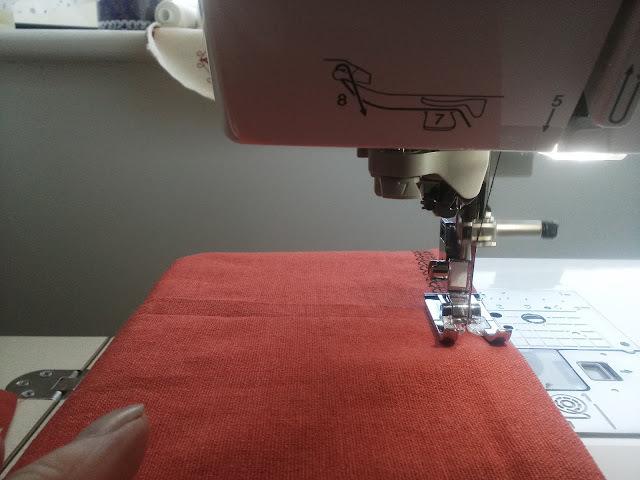 I absolutely love this Multi purpose screwdriver it actually revolutionised my embroidery as it is now very easy to tighten the screw on the hoop which makes for much better embroidery. If you have a Brother machine please seriously consider buying one - they are worth every penny. If you didn't want to embroider the midfriff then consider piping at the top and bottom edge or even using a contrast fabric. 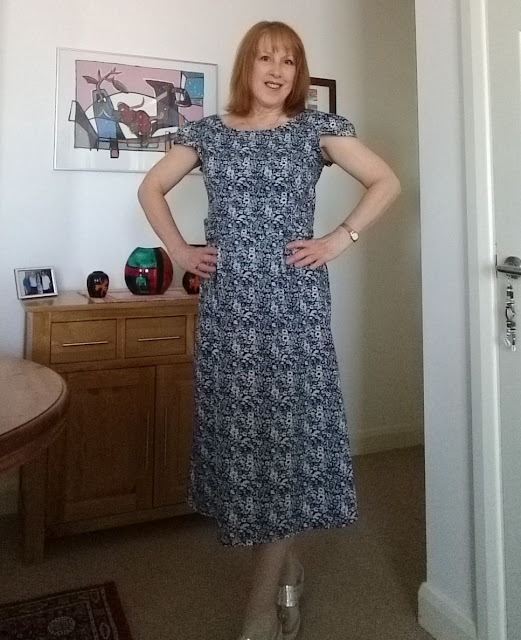 This is my dress front sewn, all seams neatened and pressed. 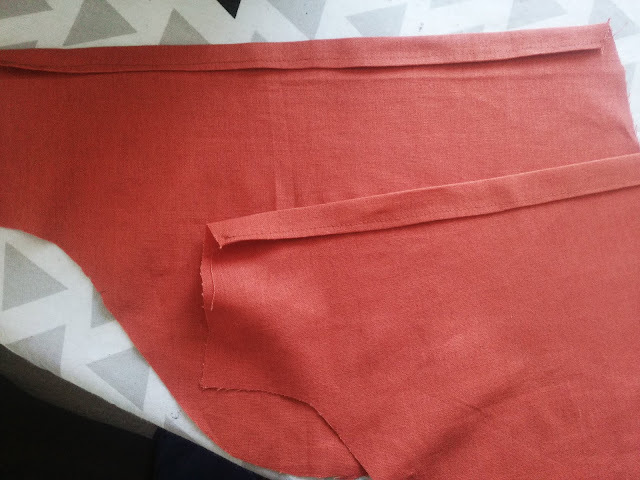 There is a pleat in the back which I neatened with a double folded hem. Tack the back together . 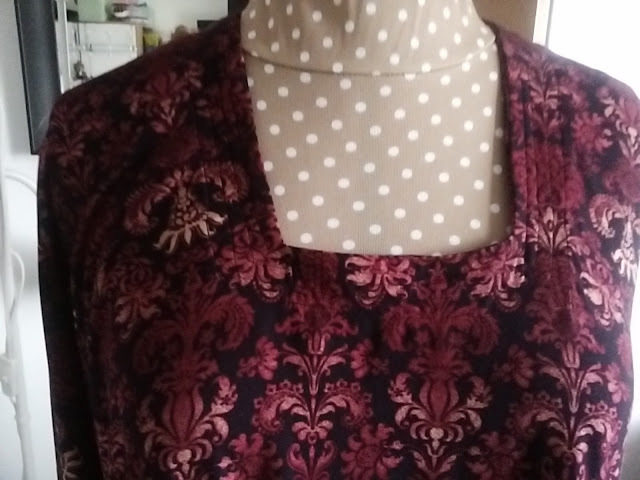 I also found that the back was a bit too loose, but be careful how much you take the dress in on the bodice because you do need wearing ease so that you can move your arms about. Also check that you can sit down comfortably. Slight ( big!) adjustments made, I stitched the back dress together and inserted a zip. Either insert a regular zip or an invisible zipper, Dress Zips which ever is your preference. Jaycotts have the best selection of zips at the best prices I know, so they are my number one choice for any type of zip. I wanted to add the sleeve flounce but thought better of it in the end because my fabric creases so much and it wouldn't look too great if I was wearing a jacket over the top and wanted to take it off. 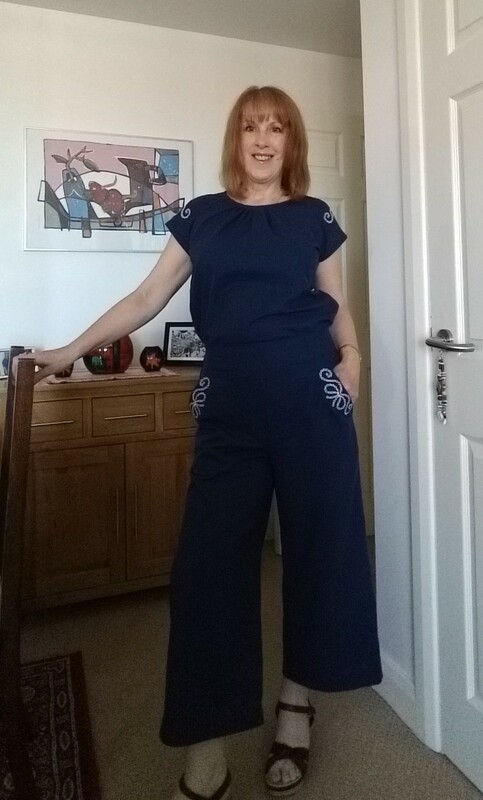 So I thought that I would make a double hem and add an embellishment. 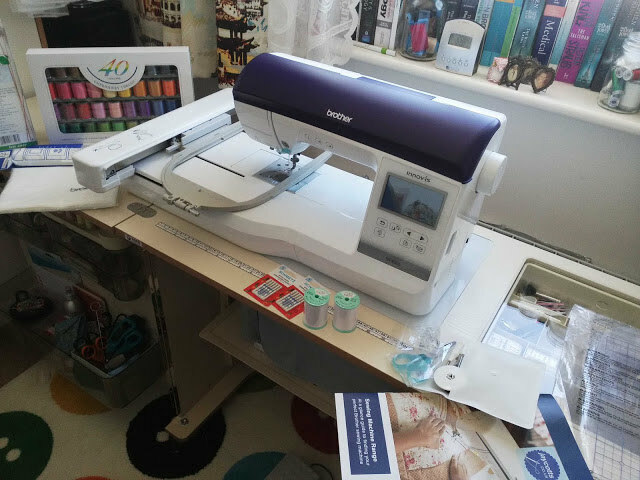 My sewing machine has 182 built in stitches, but don't just take my word for it, read my review and then call in at Jaycotts to try one for yourself, you will be amazed. The square feed drive system means that it can stitch extra wide decorative stitches, and it was one of these I chose to edge my sleeves. You need to change your foot to the ( included) monogram foot . This has extra room to accommodate the needle movement and allows you to see what you are doing easily. It might seem odd at first using one of these extra wide stitches so do practise before putting it on your actual garment. I quickly discovered that the decorative stitch was perfectly placed if I aligned the foot to the edge of the sleeve when the needle was at its furthest point to the right. It does move around a bit. 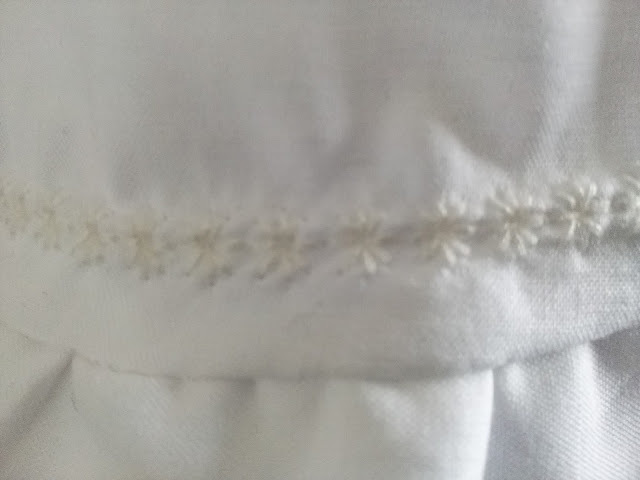 Once you have seen the machine sew this type of stitch you will easily see what I mean. Press the seam open and then press the facing to the inside. The pattern instructions are very clear on what to do. 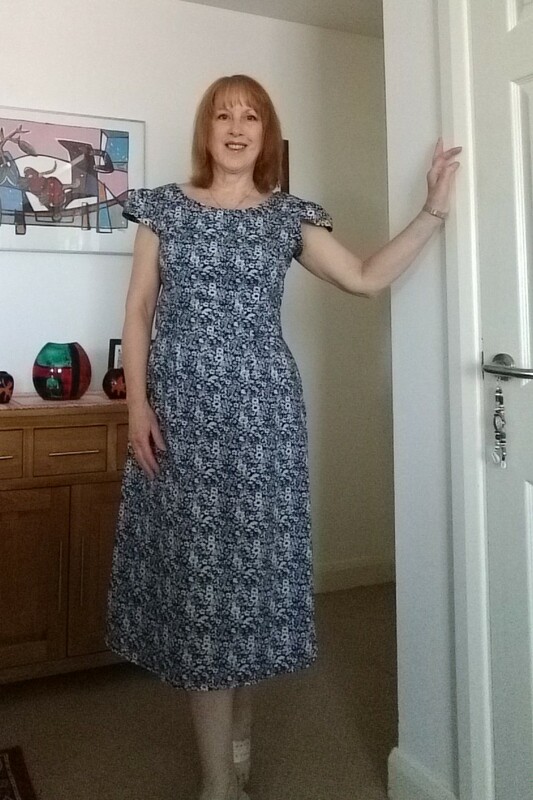 Do keep trying your dress on, it is the only way to get a perfect fit. I wanted to hold the facing in place but I did not want any topstitching to show on the right side. The answer is to understitch the facing to the seam allowance. The arrow on the above picture shows the understitching on the inside but not on the outside. 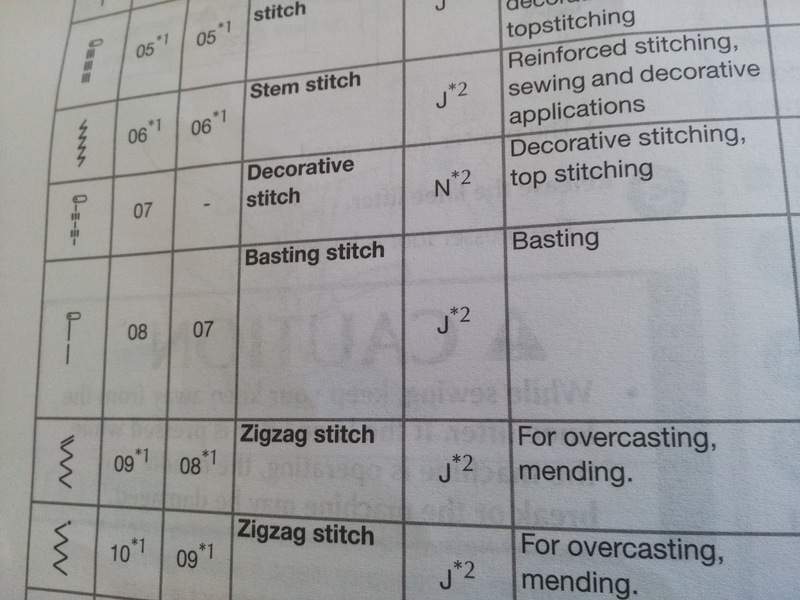 Again, the pattern explains exactly how to understitch. The bodice looks very neat, the seams are all perfectly matched and it fits well. I finished my hem with a double hem just like I finished the sleeve hem. This is a lovely pattern, it teaches you the correct way to achieve a garment which fits perfectly every time. The skills learned can now be used every time you sew something and it will always fit perfectly. Thank you for reading this post, I would appreciate your feedback. 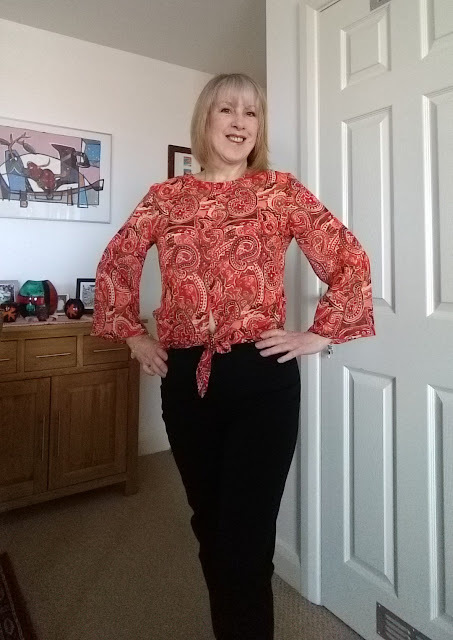 This is a pretty little blouse which I made with Simplicity 8601. Just in case you do not have an overlocker, or don't want to splash out on four bobbins of overlocker thread in a colour you will not use much I'll talk about the Overedge foot too. This is a new pattern and don't you just love it ! 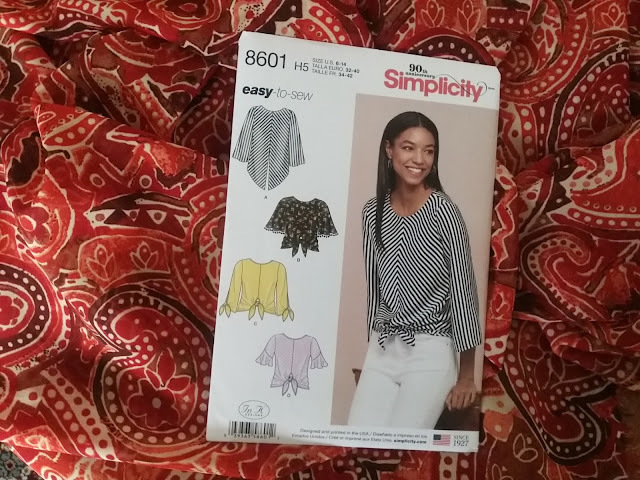 The pattern is Simplicity 8601 which is a collection of easy to sew tops. 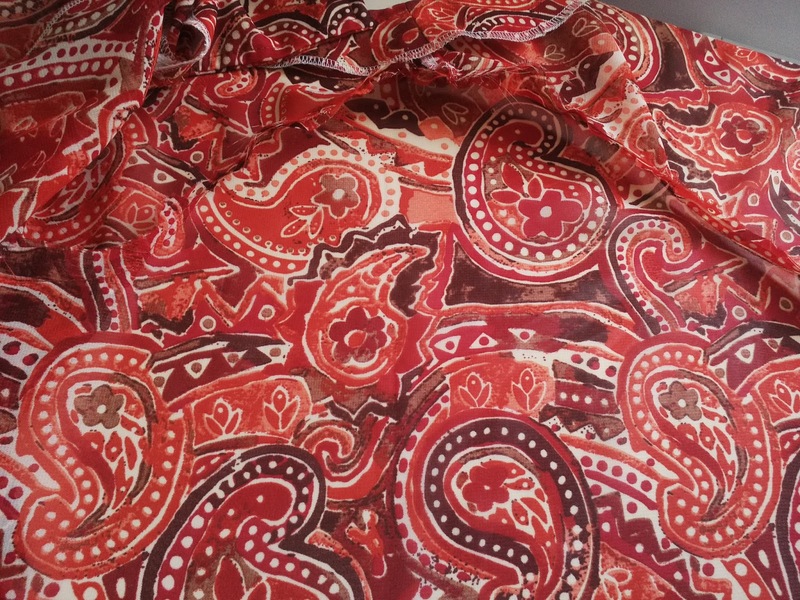 I decided to use this beautiful Chiffon fabric which was given to me - more about that later as it is connected to the wagon I was telling you about. 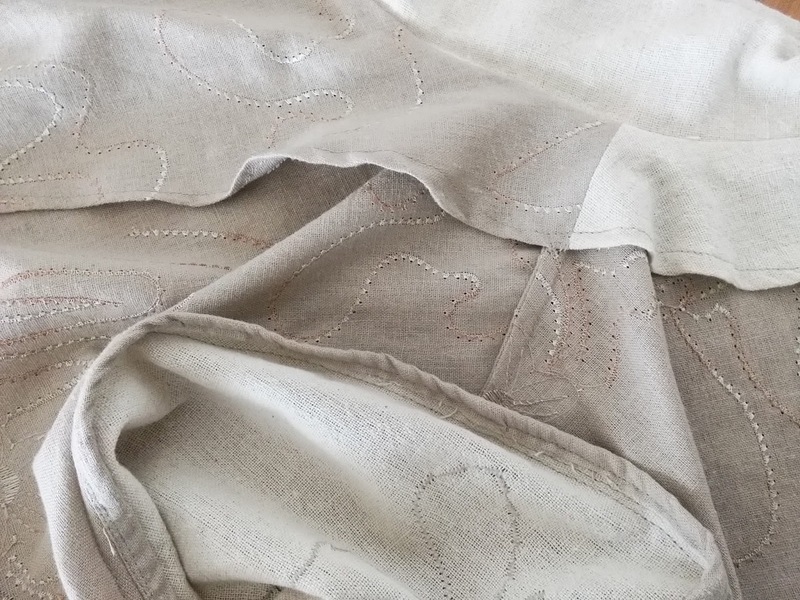 Chiffon is quite slippery and it frays and snags so unless you have some sewing experience with it I recommend using a lightweight cotton, cotton Lawn for example. Cotton is much easier to sew. The pattern ties at the front in all views and there are four sleeve options. I think it looks best with high waisted skirts or pants and depending on the fabric can be smart or casual. The instructions are very easy to follow and each step is given an explanation as to why it is important. 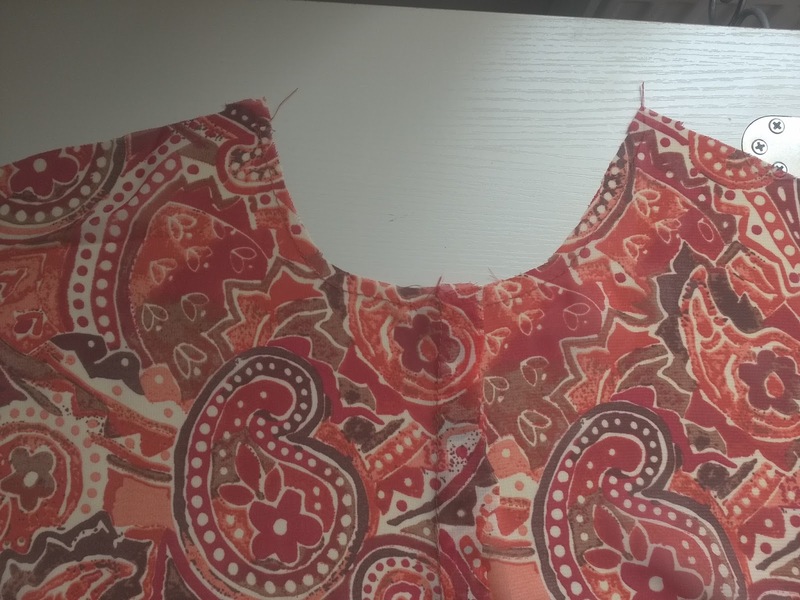 For example we are told to stay stitch the neckline to stop it from pulling out of shape. 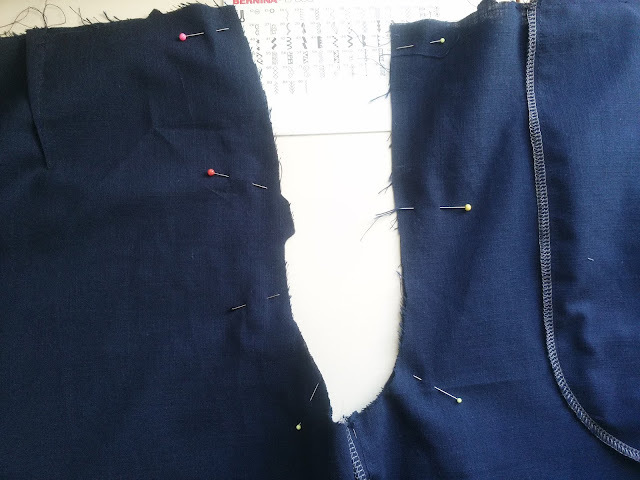 The first steps are to sew the centre fronts together down to the marking for the tie front extentions. Then to sew the centre back down from the neckline opening marking. I find it useful to mark the reverse of each fabric piece so that I do not get confused trying to figure out which is the right and wrong side! Use your favourite Chalk marker for this. I just draw a X on the wrong side of each piece near the bottom. 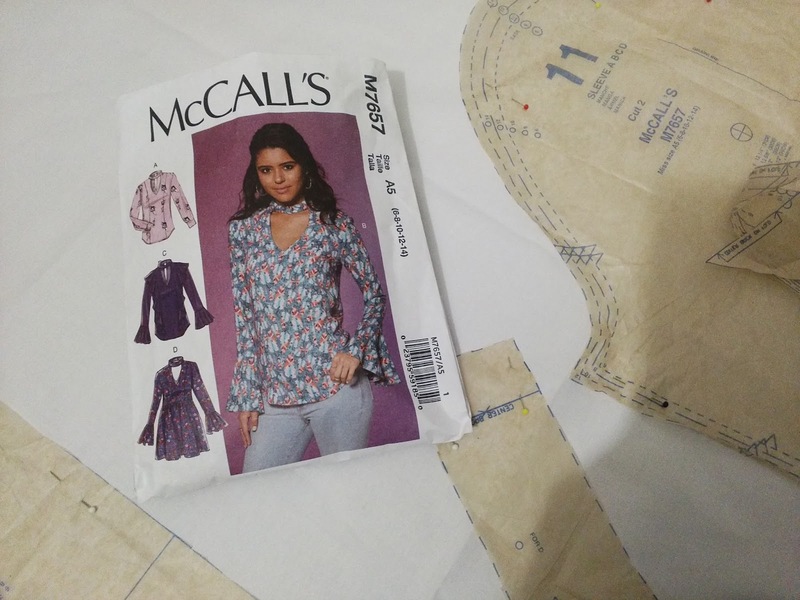 Most patterns advise you to sew the side seams and then to insert the sleeves, but wherever possible I prefer to sew the sleeves in flat before I stitch the side seams. 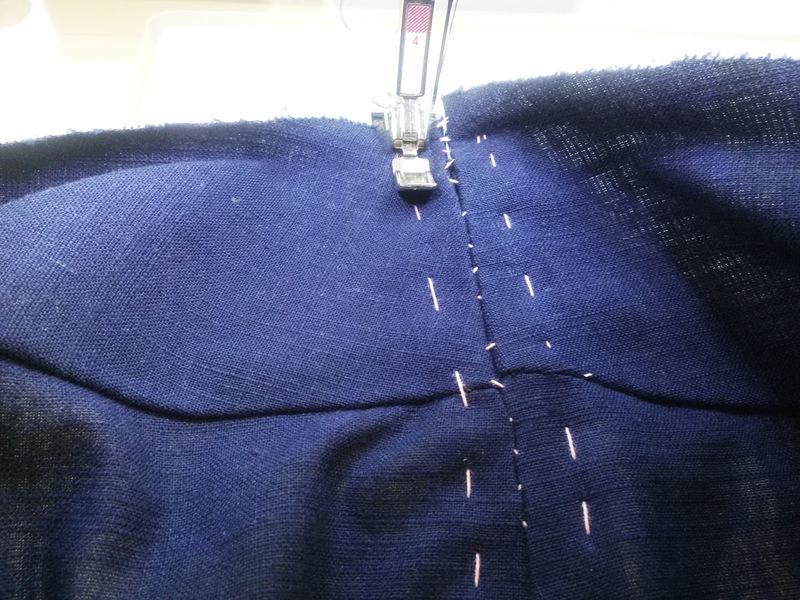 The first step is to run a long basting stitch along the top of the sleeve within the seam allowance. This is used to ease the sleeve head into the armsyce. Never sew over your pins by the way, always remove them as you reach them. You could damage your machine if you don't. 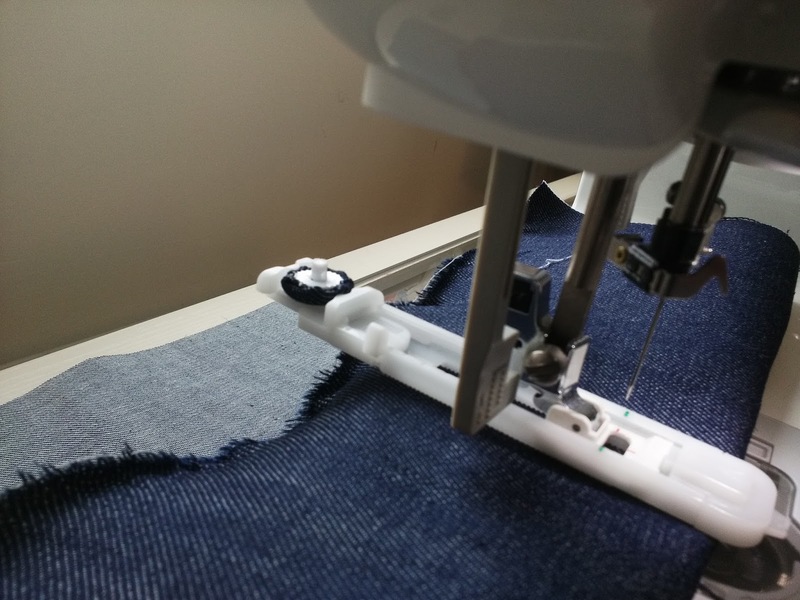 This is an Overlock or Overedge foot Again, different makes are available so contact Jaycotts if one did not come with your machine, they often do so you may already have one. You will notice that it has a "toe", this is the part which the machine needle zigzags over to form an overlocked seam. Overlock feet with side cutters are also available from Jaycotts. 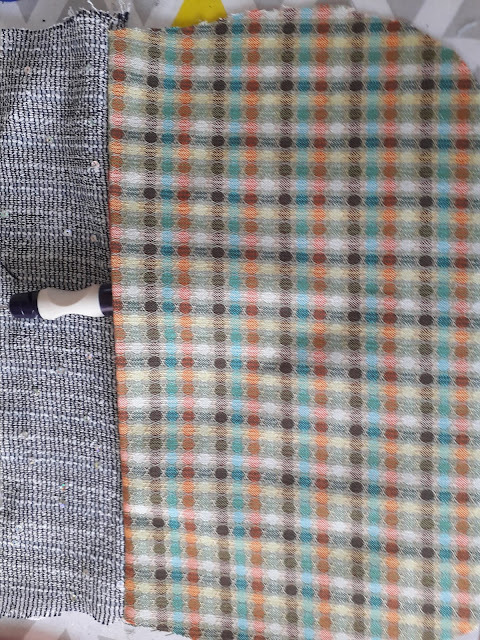 The open space next to the toe is placed right at the edge of the fabric. I do use this foot a lot. 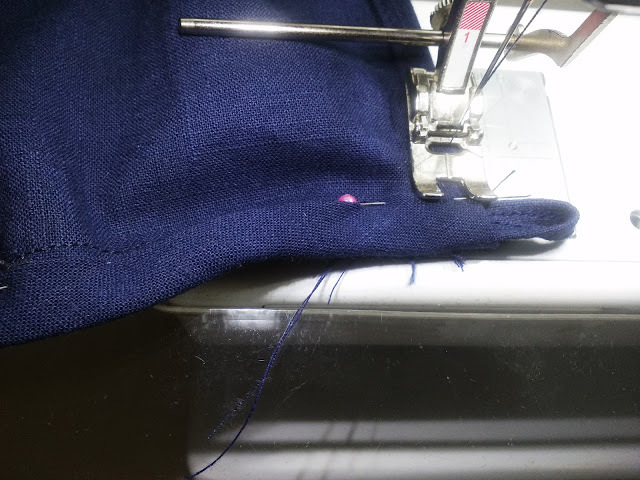 Overlocker thread can work out expensive because you need four bobbins, and it is not practical to keep every single colour in " just in case", so this foot comes into its own when I need to finish the seams on a garment in a colour I do not have the correct colour of overlocker thread for. 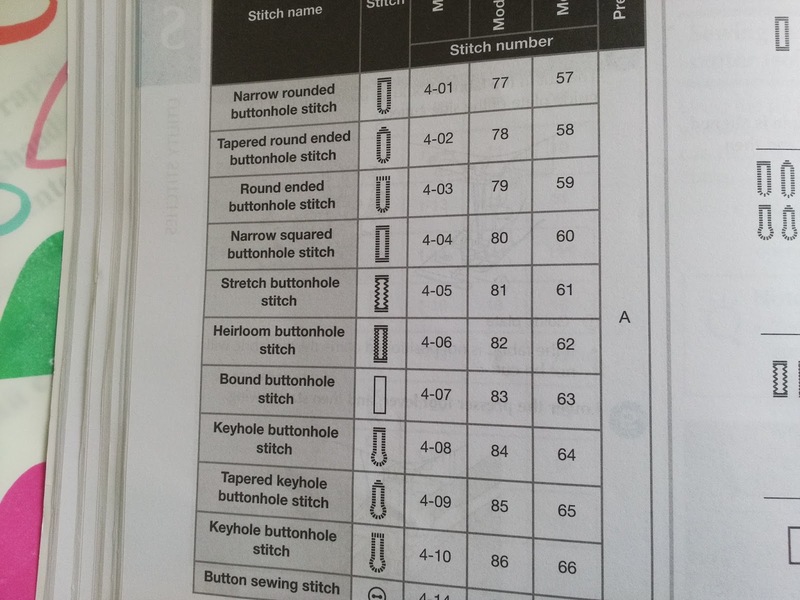 If you look in your sewing machine manual in the utility stitches section you will find at least one option for Overedge stitches. I selected the one especially for fine fabrics. 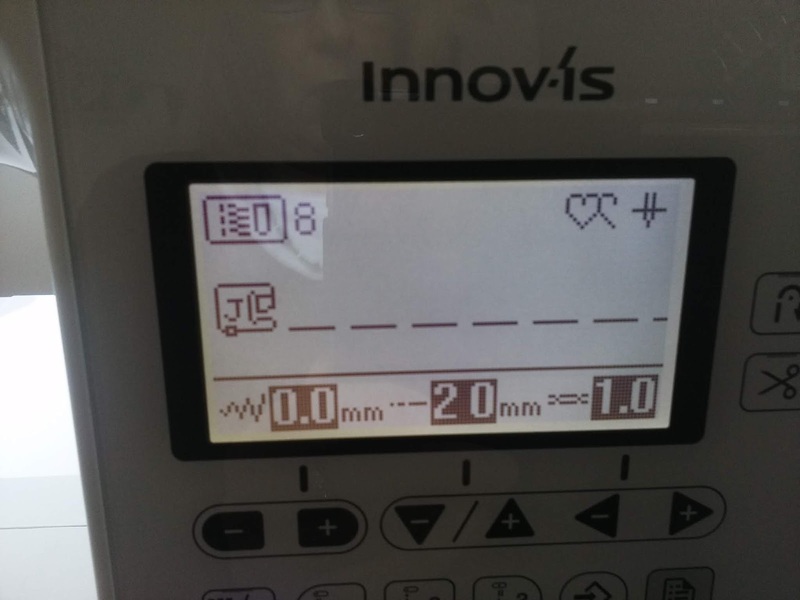 The picture of my LCD screen shows the type of stitch you need. 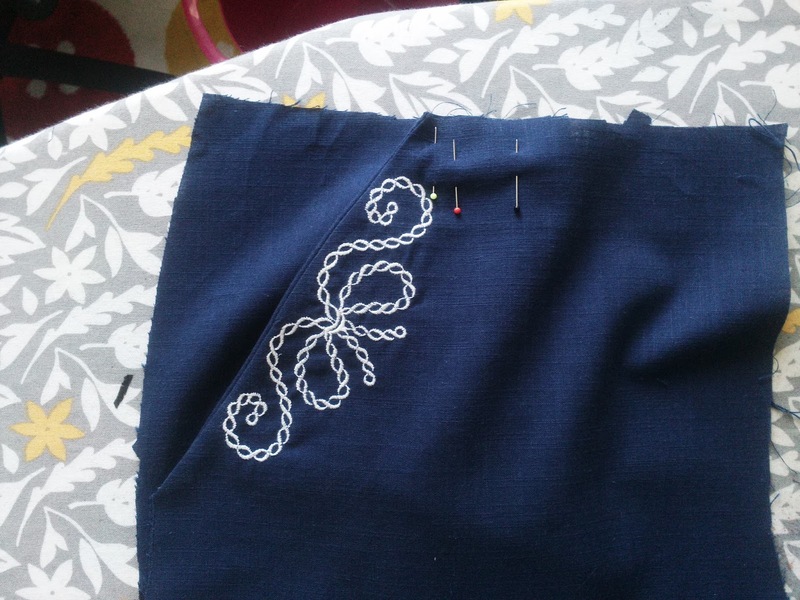 Have a practice run beforehand and adjust the stitch length and width if necessary. Once you are happy with the results you are good to go. 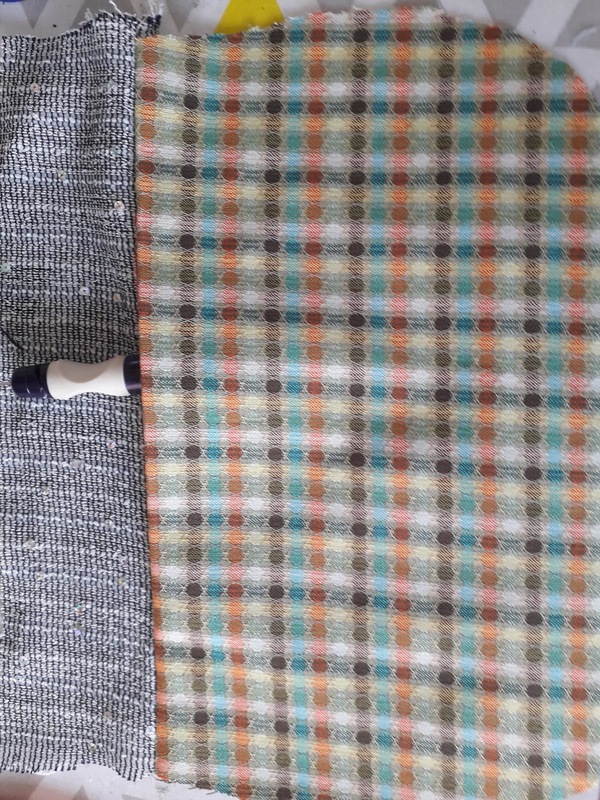 Jot down your settings so that you can finish the rest of the seams as you go without trying to remember them. 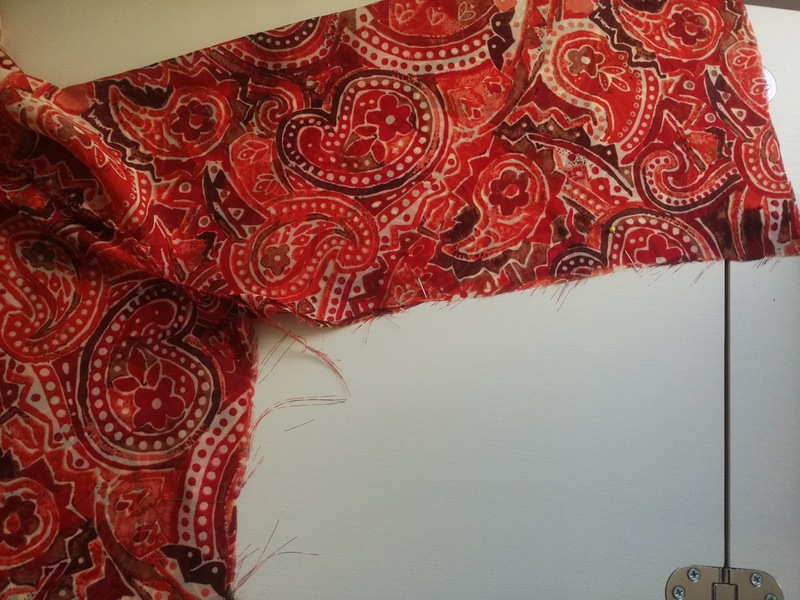 It is now a simple process to join the sleeve and blouse side seams in one process. 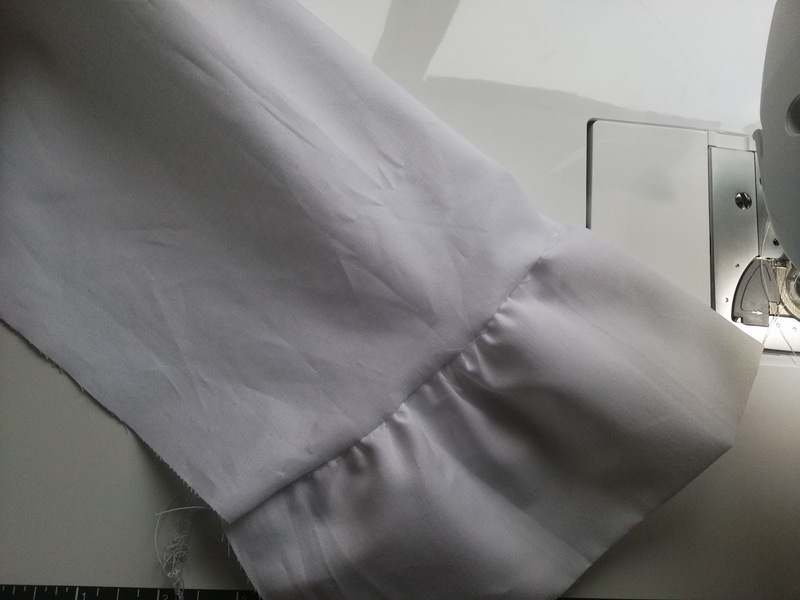 Match the underarm seam carefully ,together with any notches .Once the seam is sewn finish the seam as before. 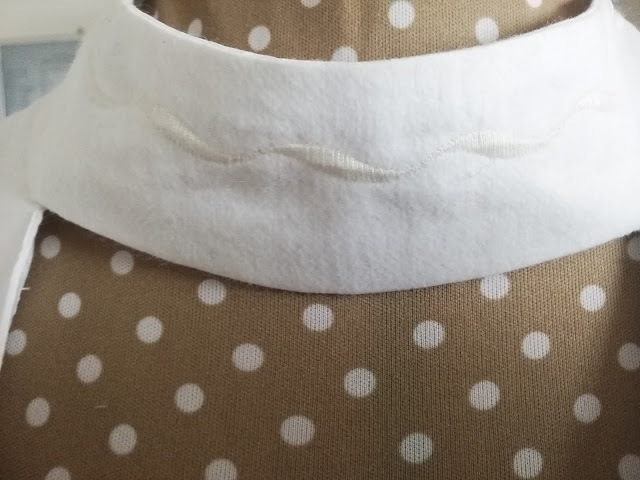 I debated about just understitching the facing in place, but as my fabric is very slippery I decided to top stitch to keep it firmly in place. This is personal preference. 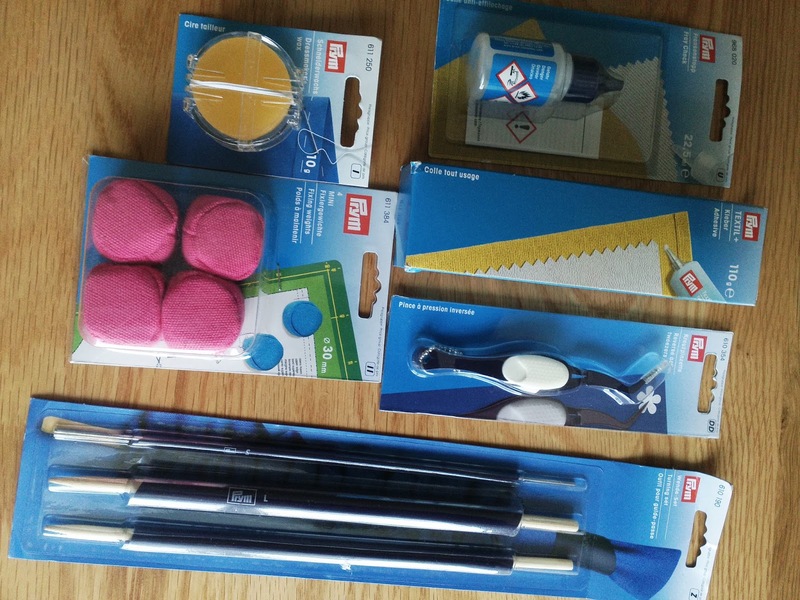 I use both depending on the fabric or on the look I want to achieve. 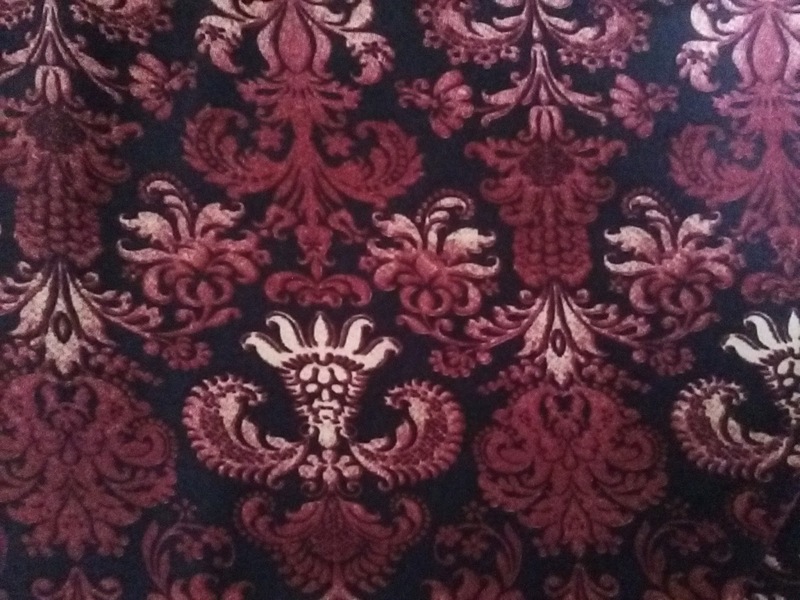 On this fabric I felt that the facing needed holding firmly in place. This is my button loop which I made with embroidery thread. You could use top stitching thread instead. Thank you for reading this post. 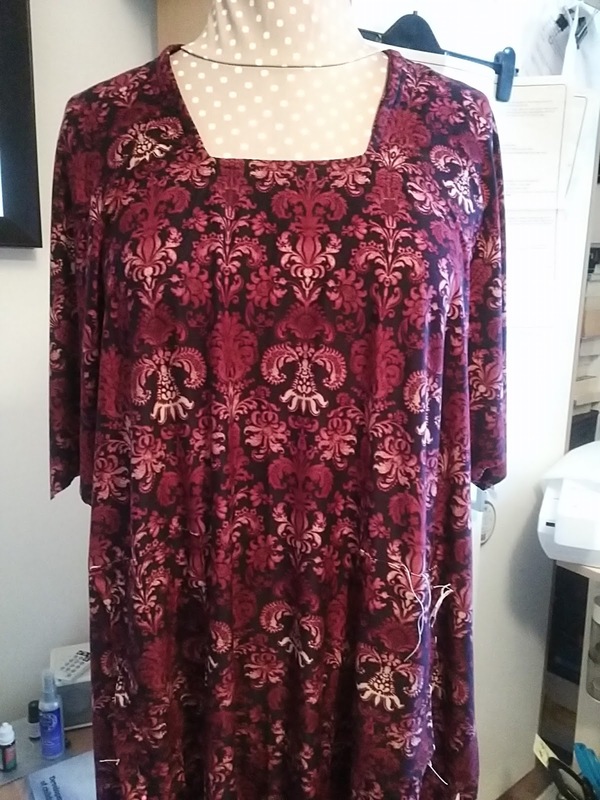 I do hope that you make this Simplicity top. You can have it made in an afternoon and it will soon become a firm favourite. 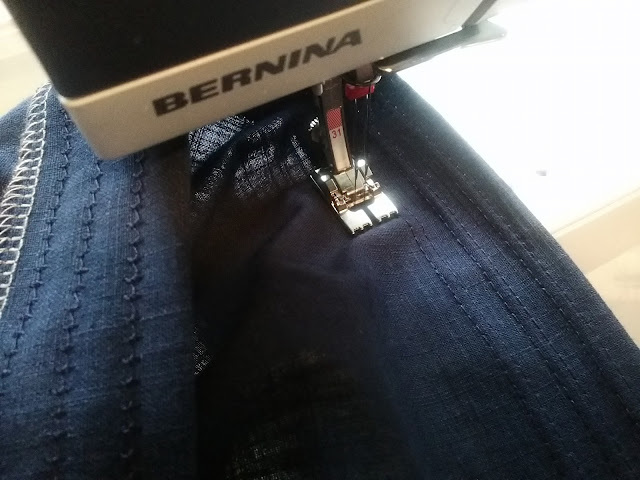 I do have rather a lot of Brother machine feet to get through so I am going to go through them all for you one or two at a time, showing them being used on a garment or other project. 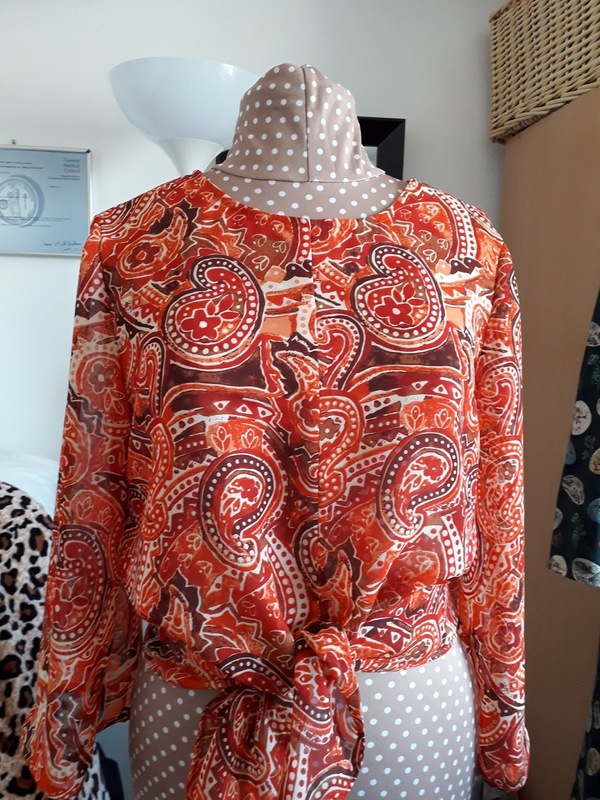 This top is tunic style which pulls over your head. 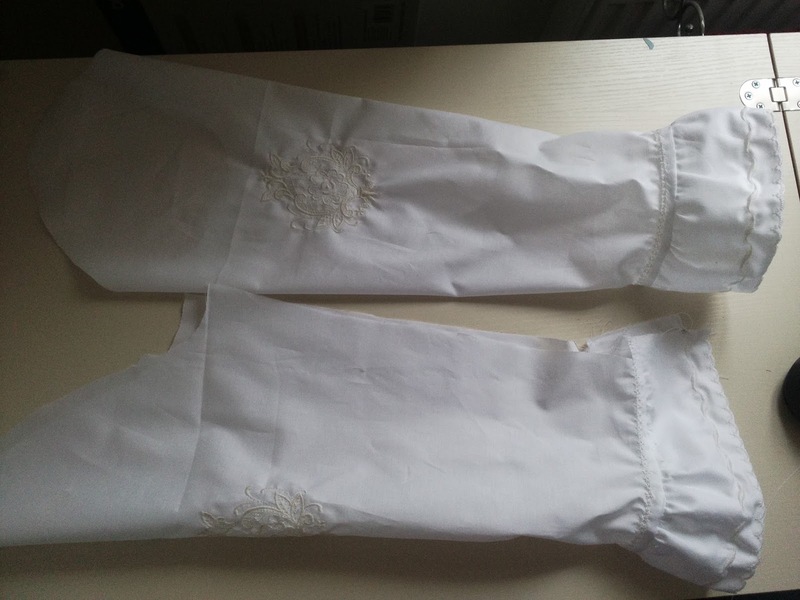 There are two sleeve options but I adapted the pattern to make the sleeves in a different style. You also need a new Sewing machine needle For Lawn I would choose a Fine one. 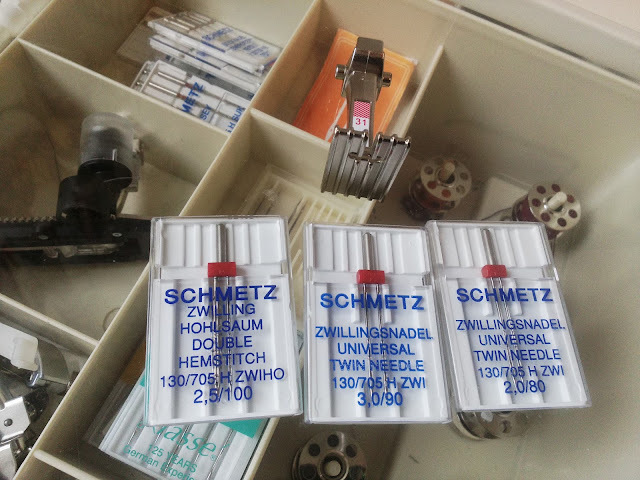 This link is to a large box of machine needles which is great value but they are also sold in smaller packs. I must tell you that I have just had to opt out of a discussion on a social media site because a group of people were insisting that machine needles do not need to be changed frequently. No matter what argument I put forward they were not listening and in the end I left the conversation. Let me tell you that it is absolutely vital that you change your machine needle with every project. It is most certainly not a " waste of money" you have paid a lot for your pattern and fabric, why risk your project failing or your machine becoming damaged because you didn't spend a small amount of money on a new needle? 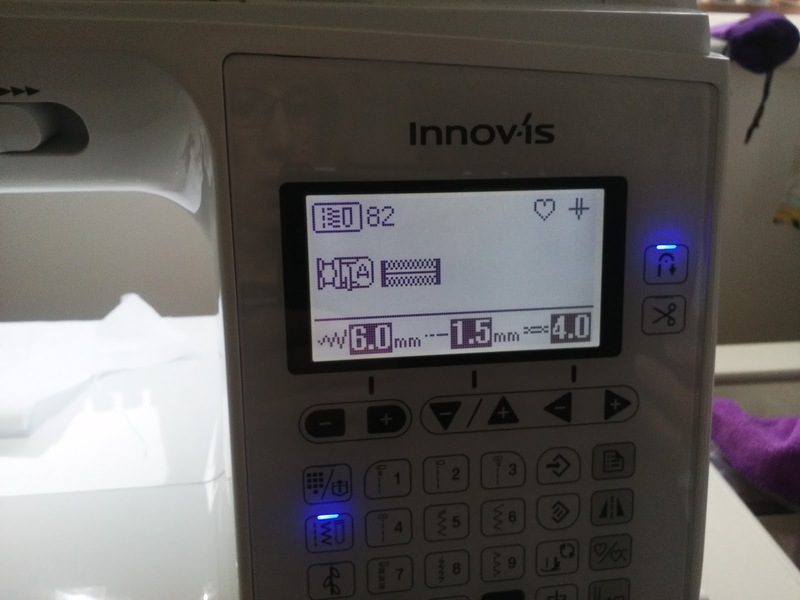 My embroidery machine is the Brother Innov-is 800e and there are plenty of reviews and tutorials about this machine on my blog. 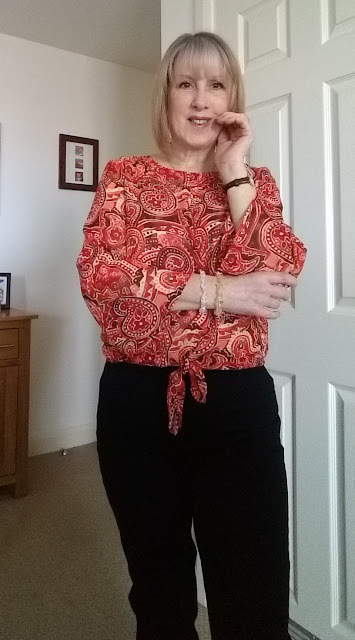 I chose a lace design which I placed centrally on the front and on the sleeves. There are many designs to choose from so pick what you like best. When you first get a new sewing machine it can seem daunting at first, but just get your machine manual out and follow the instructions to the letter. The LCD screen displays the stitch or function which you are using at the time, making it so simple to use. 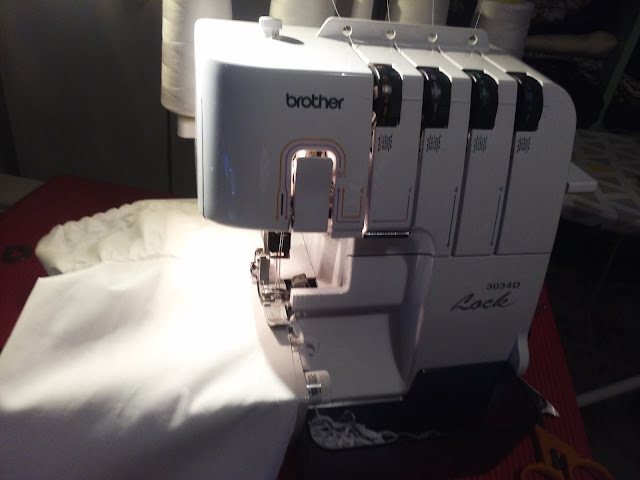 All of my machines are by Brother and it makes life simpler because they share many of the same functions, for example threading is the same, the automatic needle threader is the same and so on. 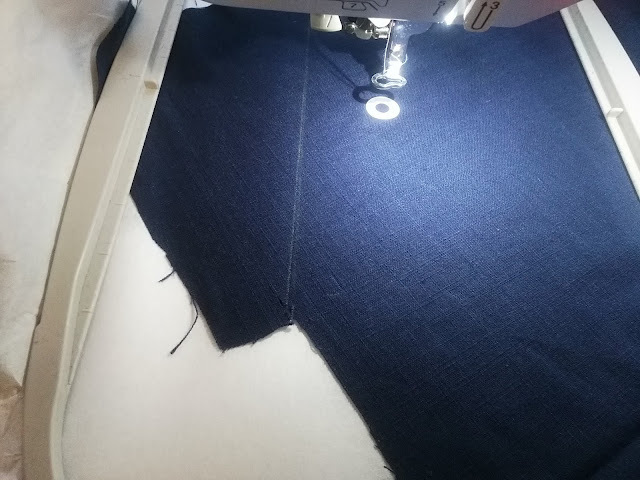 When threading the machine and winding the bobbin for the first time take particular attention to the manual so that you are perfectly satisfied that you have the bobbin of thread the correct way round and that the threading process is followed correctly. 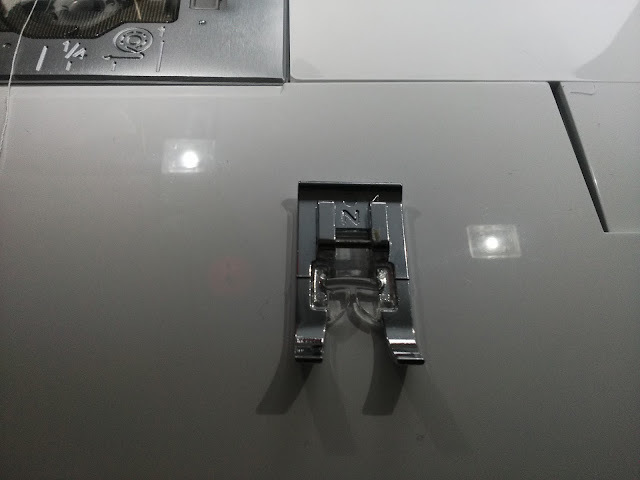 Similarly when putting the bobbin thread into the bobbin thread case you need to look at the machine itself as it clearly indicates which way the bobbin needs to be inserted. If you do not thread the bobbin or the top thread correctly you are very likely to get tension problems. The first foot we are going to try is the Gathering foot. 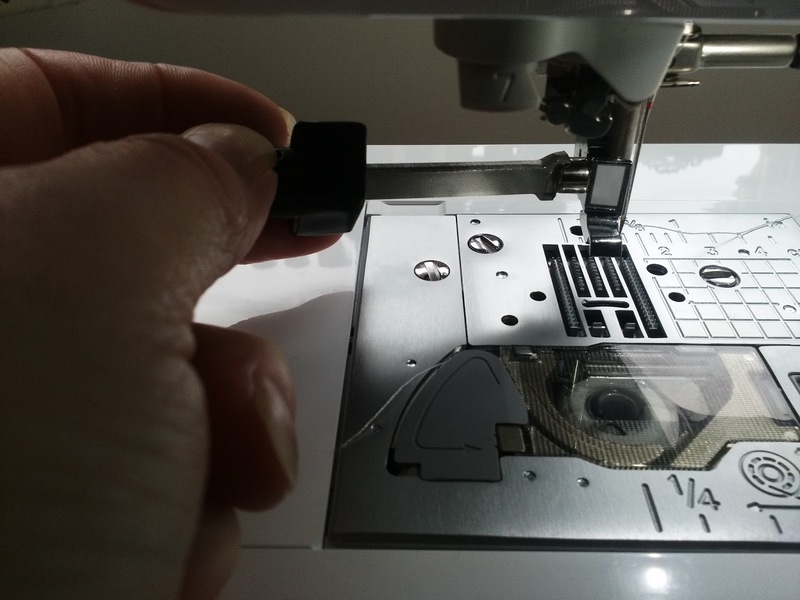 I like Brother sewing machine feet because they are inexpensive to purchase so you can soon build up a selection. Not only that each foot comes with an instruction leaflet which is totally invaluable. Once you have done that then you attach the gathering foot in its place. To use the gathering foot take some spare fabric and practice. 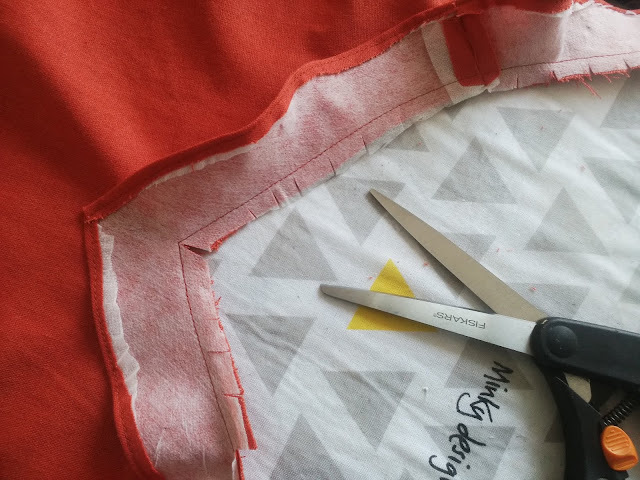 You need a longer piece of fabric to gather onto a smaller piece. The fabric which needs to be gathered goes under the pressure foot and the fabric which does not need gathering goes on top taking it through the gap in the foot. 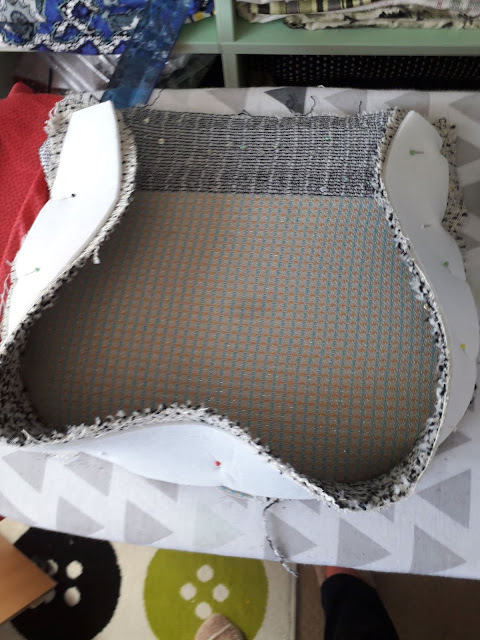 The bottom fabric gathers according to how much tension you put on the top fabric, so for more gathers put more tension on the top fabric, for less gathers don't put any tension. Have a practice and see what works best for your project. This is a sample I did using twice the length of gathered fabric to top fabric . 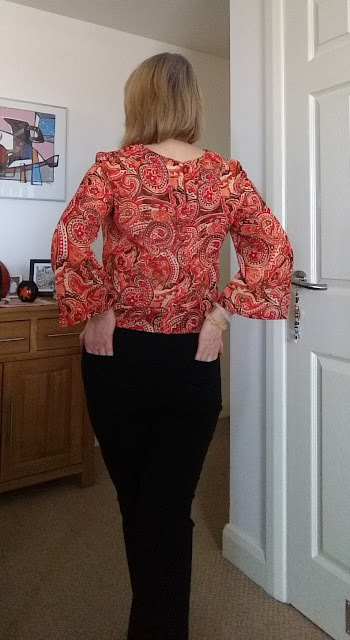 This blouse pattern is lovely but I didn't want a cuffed sleeve and the full sleeve is too fussy for me. 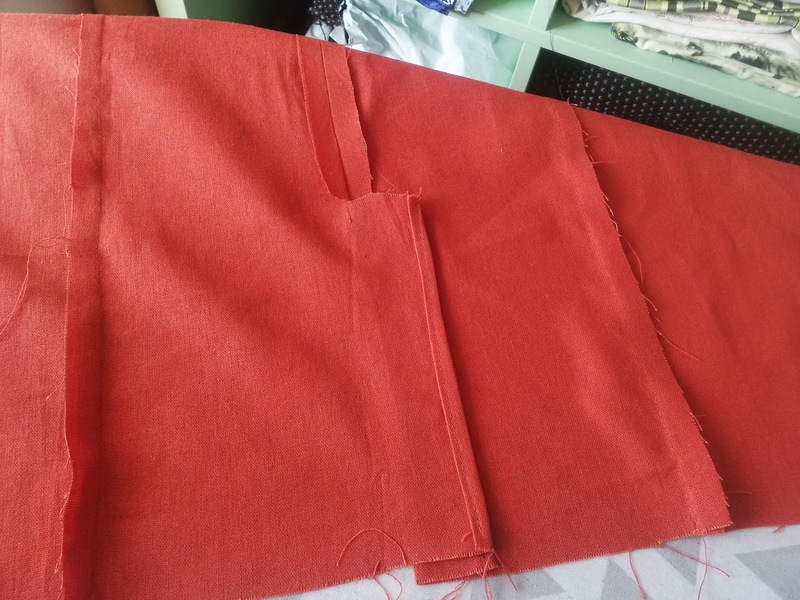 I cut the sleeve pattern out to the shorter length and then cut two lengths of fabric one and a half times the width of the lower sleeve and pressed them in half lengthwise. To decorate the edge of the sleeve we now need to attach the monogram foot. This comes with most Brother machines. 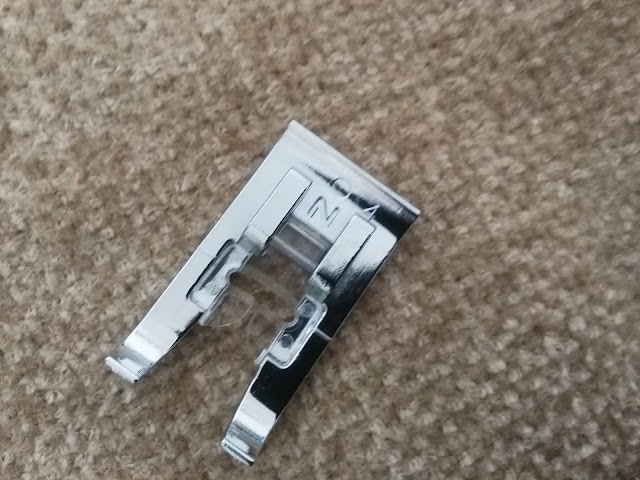 The presser foot holder needs to be reattached and then the monogram foot simply clips onto it. The monogram foot is wider and enables you to see the pattern you are stitching clearly. I wanted to stitch a scallop edge to my sleeve. using my stitch guide I selected the scallop I wanted. 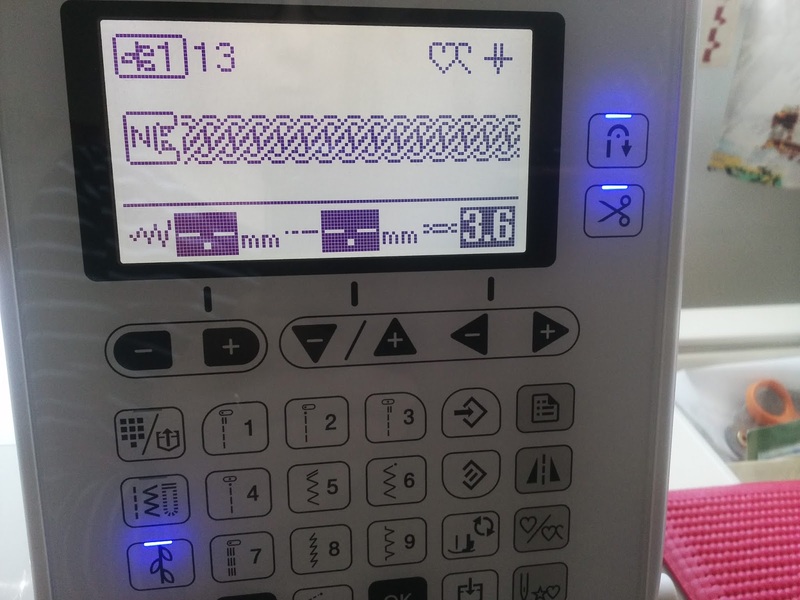 The LCD display shows a diagram of the pattern, the foot needed and the stitch length and width. These can easily be adjusted as necessary. I test stitched a few stitches before deciding on which one I wanted to use. 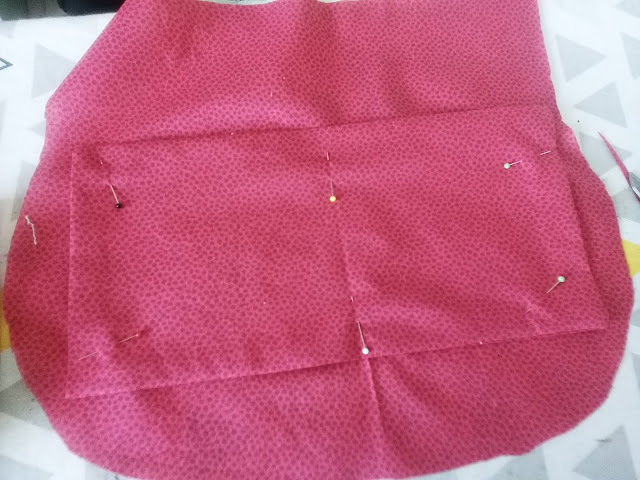 After completing the scallop edge I trimmed away the excess fabric very carefully so as not to cut the stitches. This makes a really pretty finish to any hem. You may find it easier to stitch if you use some spray on starch first. Using the same monogram foot I selected a decorative pattern to stitch above the scalloped edge. I also used this same stitch around the centre of the neckband. I chose yet another design to add just above the seam. These are the finished sleeves. I have not stitched the seam yet as I find it much easier to attach sleeves flat before I stitch the side seams of the body. I ran a gathering stitch around the top edge of the sleeves to make it easier to attach the sleeves later. The facings need to be interfaced . 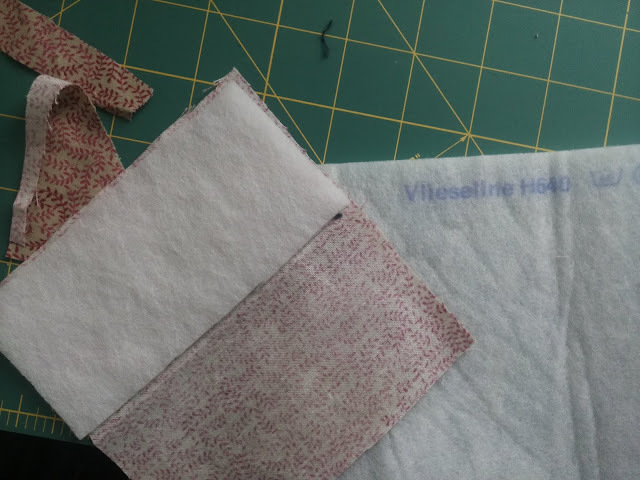 I used Vilene Ultra soft interfacing . 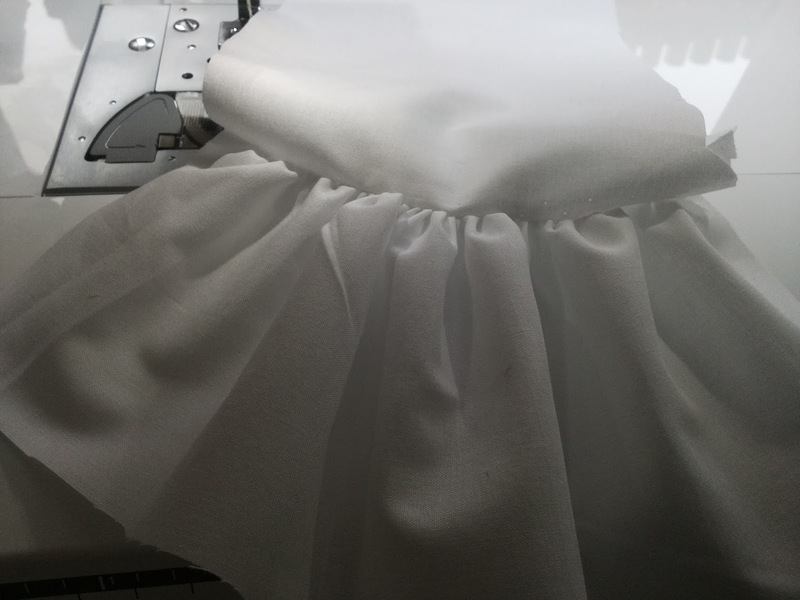 Always use a good quality interfacing on garments . This is the front of the neckband. Pin the side seams matching the sleeve edge, the underarm seam and the hem very carefully before stitching the seam in one long operation. Please note that it is not a good idea to stitch over pins, they can damage your needle and even your machine, so remove them as you approach each one. 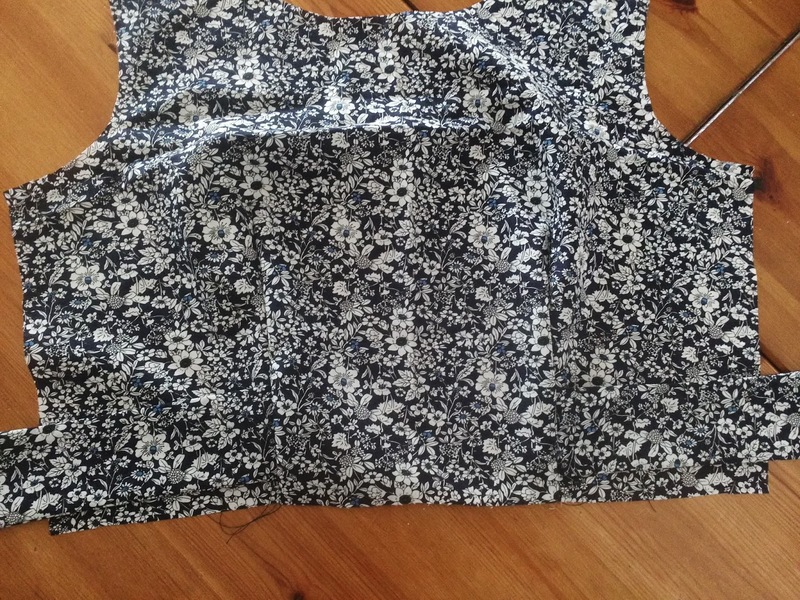 I could have used a French seam on this top, but instead I chose to overlock the edges. 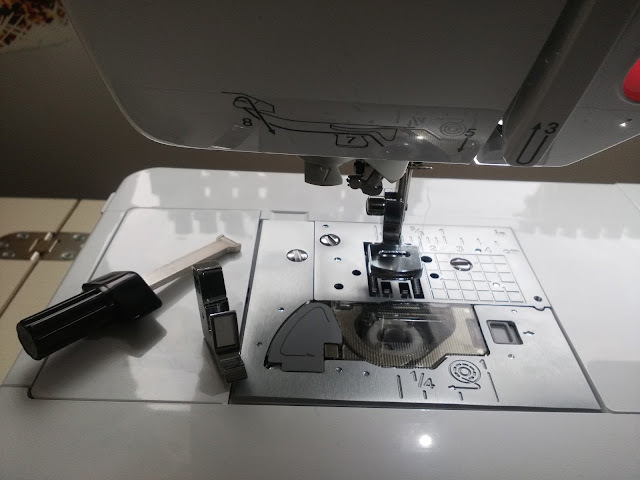 The new upgraded model of my Brother 3034D overlocker has a few more functions and is a fabulous,easy to use machine. There is a compartment on the sewing machine itself which contains spare machine feet and bobbins etc. 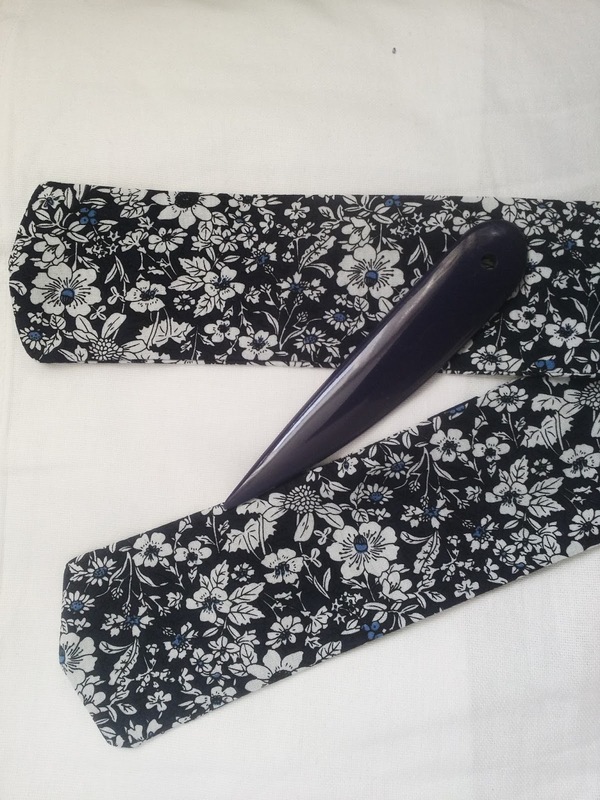 Take out the buttonhole foot - the long one at the back. Don't be daunted by sewing buttonholes, modern sewing machines make it so easy. I have got my manual out together with the buttonhole foot and a button. Always keep your manual handy to refer to. This machine has a large selection of buttonholes but even basic machines have at least a couple to choose from. 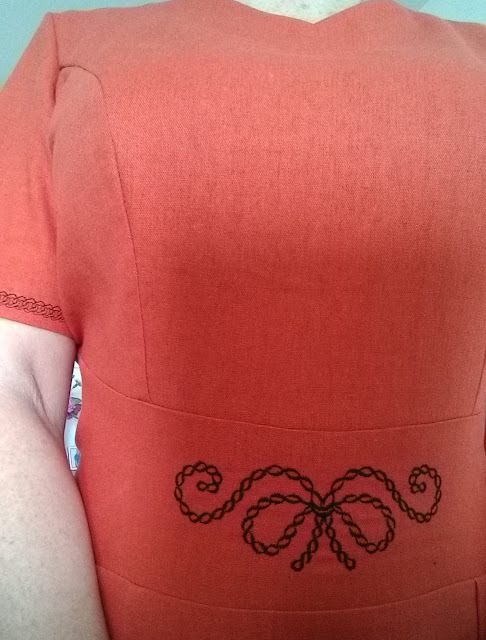 I chose the Heirloom buttonhole stitch for my top. The buttonhole foot has a button guide into which you place your button. 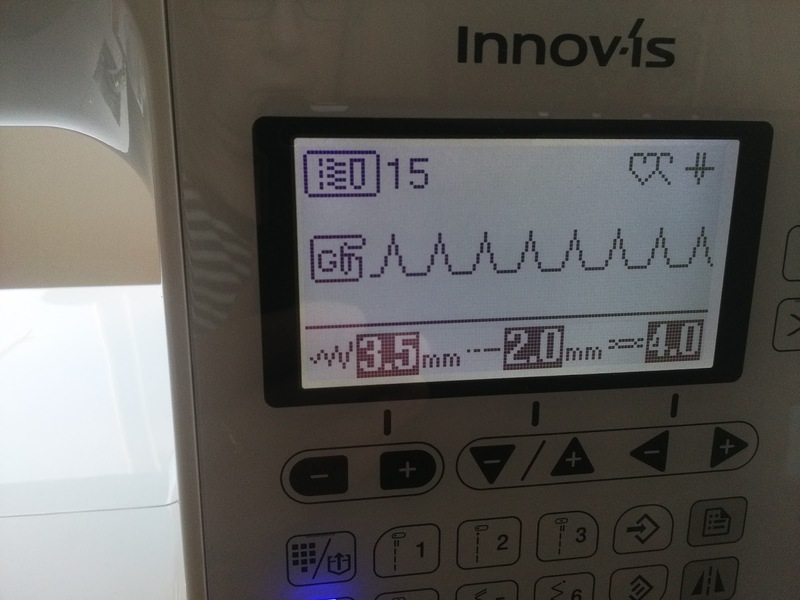 The machine measures this and sews a buttonhole to match it exactly. However it is still very good practice to try it out first! Clip the buttonhole foot onto the presser foot holder with the button at the back. Pull the buttonhole lever down as far as it will go and position it behind the bracket on the buttonhole foot. Select the buttonhole appropriate for your garment. The LCD screen displays the chosen buttonhole, and the stitch lengths and widths, and reminds you to attach the correct foot. 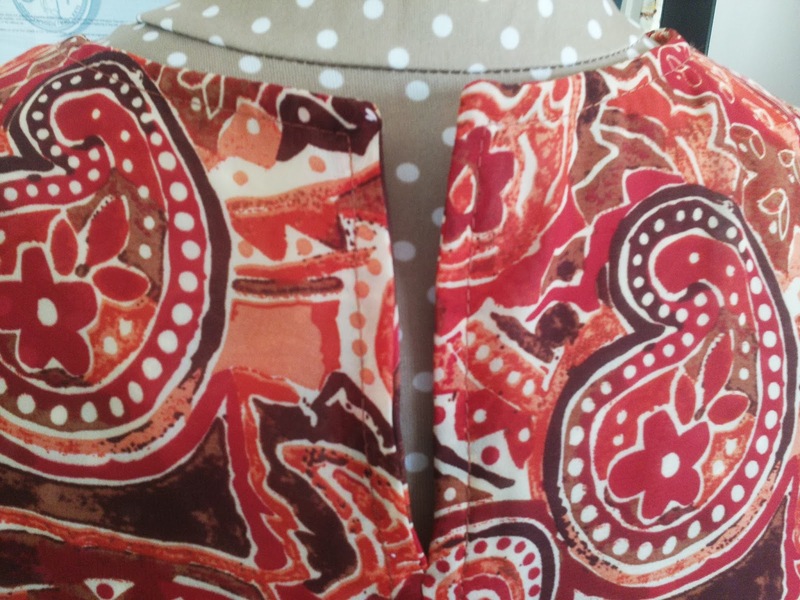 Take two pieces of spare fabric and place interfacing between them to mimic your actual garment. 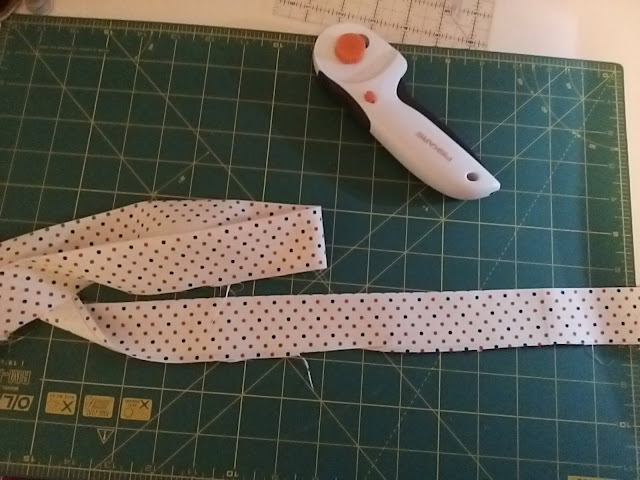 Stitch the buttonhole and carefully cut between the sides using sharp pointed scissors. Please take great care not to cut the stitches. 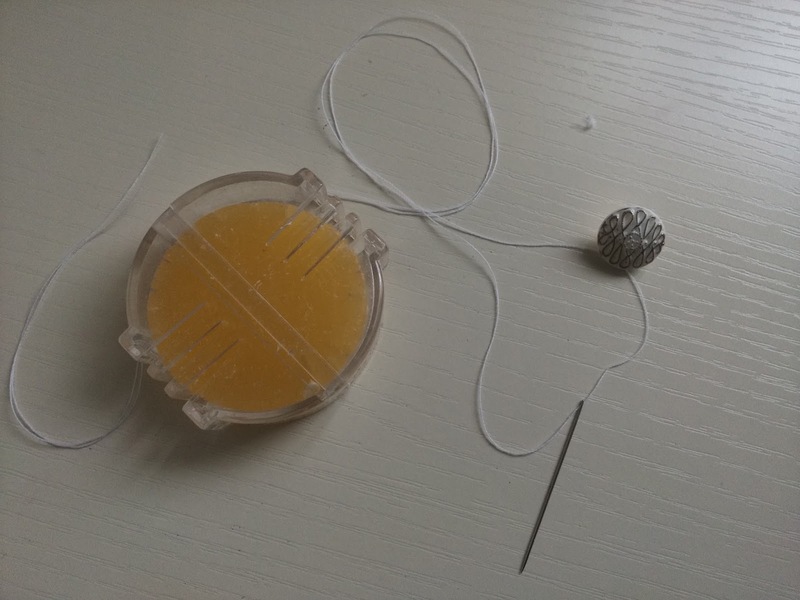 It is a very good idea to use Beeswax on your thread to strengthen it when sewing your button on. There is nothing worse than buttons falling off is there. 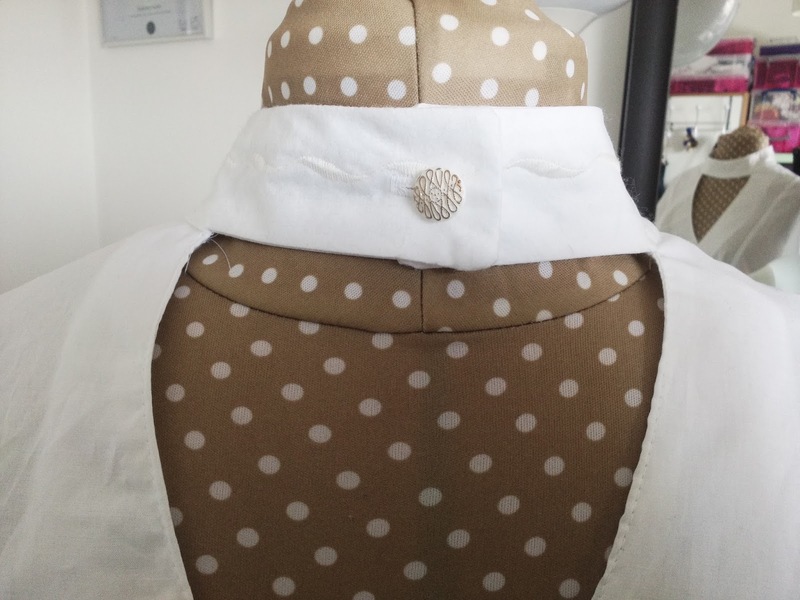 This is the finished back neck, with the button and buttonhole finished. This is a very unusual tunic top, the neckline is very elegant but the shape of the body makes it very easy to wear. These sleeves are not so bulky that they cannot be worn under a jacket. The top has no shaping and I think that if I made it again I would alter the pattern to give it a bit more shape. The fabric I chose though will soften a lot when I wash it again and give it a more floaty look. All the notions and machines are from Jaycotts so give them a call to place your order or do it online. Finally sign up for the Jaycotts Newsletter and be the first to hear about new products, sales and much more. Thank you for reading this post, as always your feedback is appreciated. 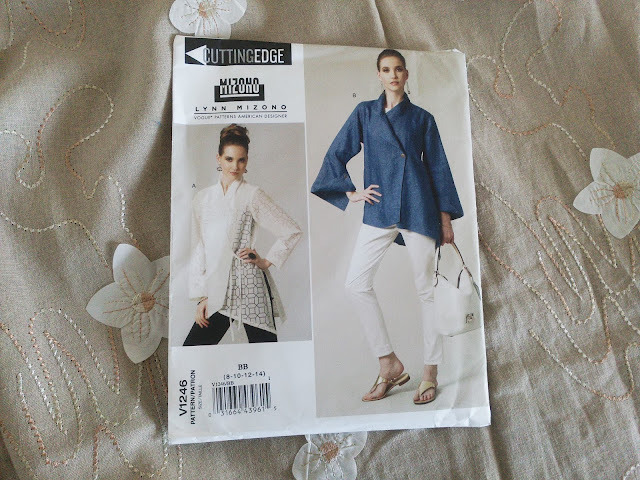 Pattern review for this fabulous designer shirt/ jacket by the American designer Lynn Mizono. The pattern is can be purchased here Vogue 1246. 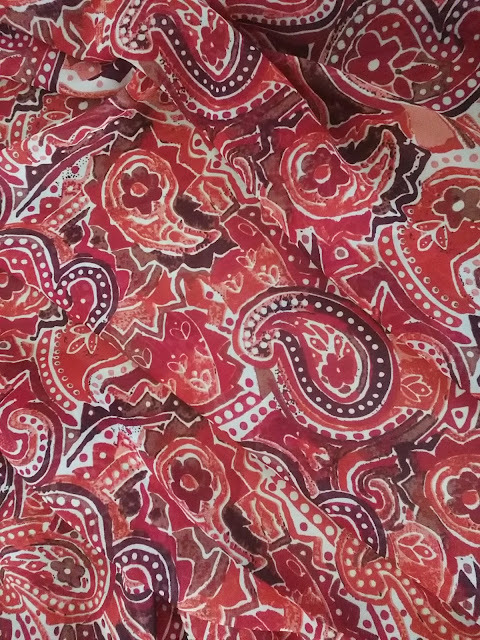 The fabric is quite old and I have been longing to use it for ages but never could decide what to do with it. 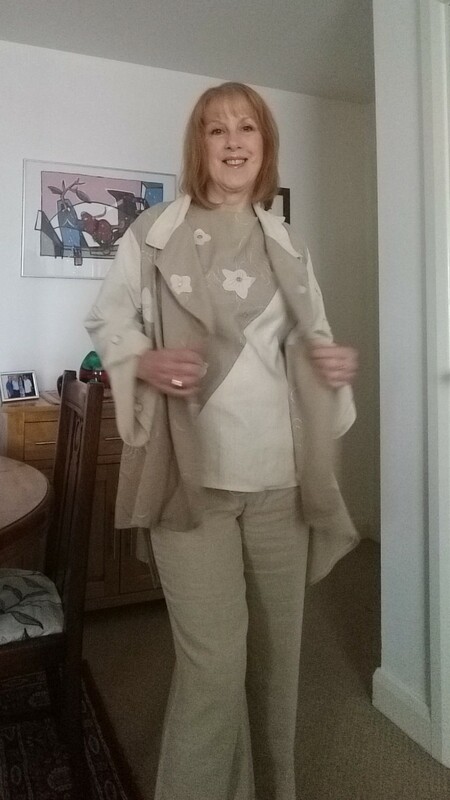 I thought it perfect for this jacket though, and even though there wasn't enough fabric for the entire garment I decided to go ahead anyway. 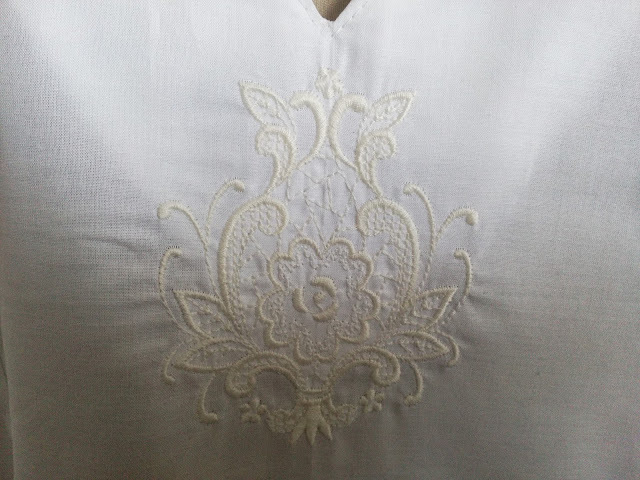 It is an embroidered linen with flower applique on it, purchased as I said several years ago.There was just enough to cut out the main body of the jacket and a small piece was left over for the contrast panel on the top. I had another piece of linen in the same weight but plain. This went into making the sleeves and collar and the trousers. My final piece of linen went into making the bulk of the top. It was a bit of trial and error with pattern placement bit in the end the fabrics go together very well. In case you missed my last post I am trying very hard to reduce my stock of fabrics rather than just have them sat there gathering dust. After all I chose them because I wanted to wear them! I am enjoying working with Vogue patterns immensely, they are challenging with plenty of pattern pieces but very satisfying to work on. 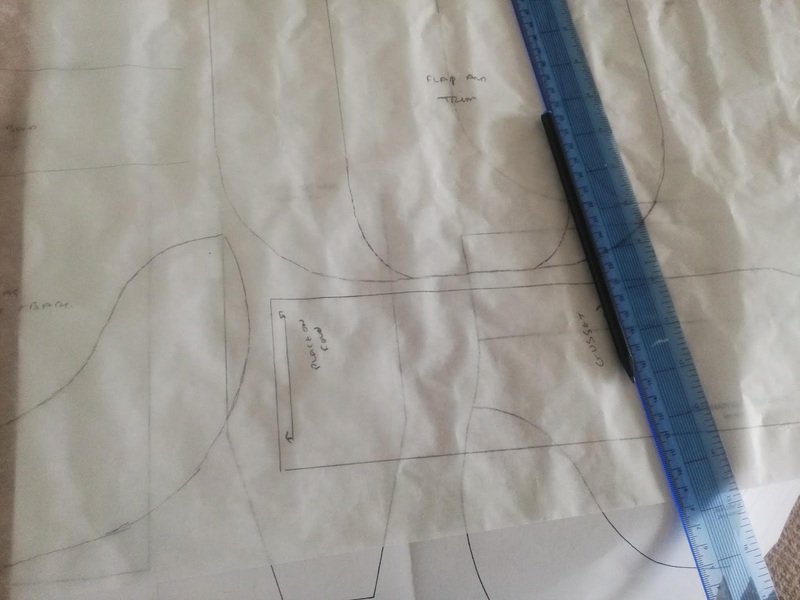 When working with a pattern which has little or no symetry you are most likely working on a single layer of fabric so you need to find somewhere large enough to cut out. I did manage to use my dining table with a bit of judicous folding! 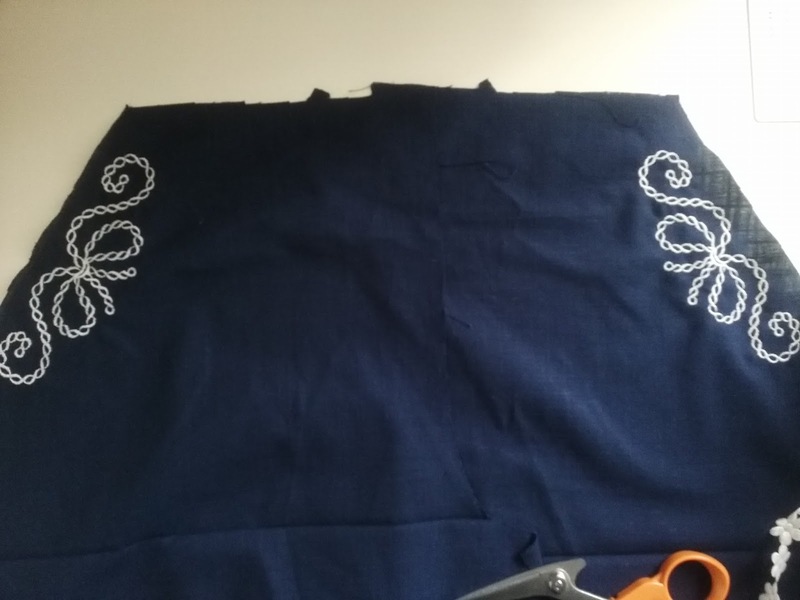 The other thing you need to be aware of is that you must be meticulous about transferring every single pattern marking onto your fabric or you will become muddled and it will be an unpleasant experience. 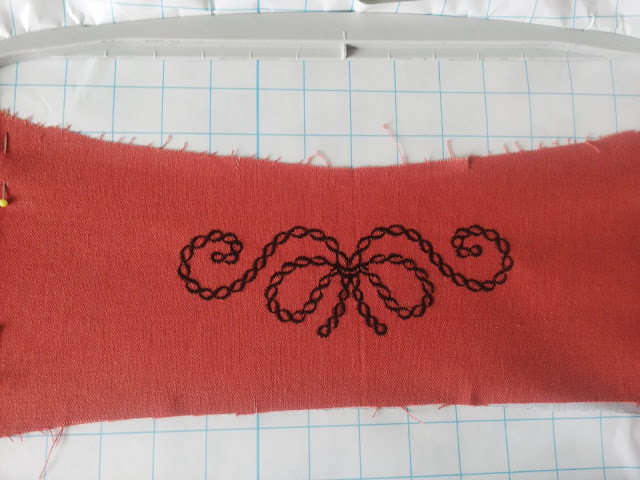 If your fabric has no obvious right or wrong side then you need to mark the back of each piece too. 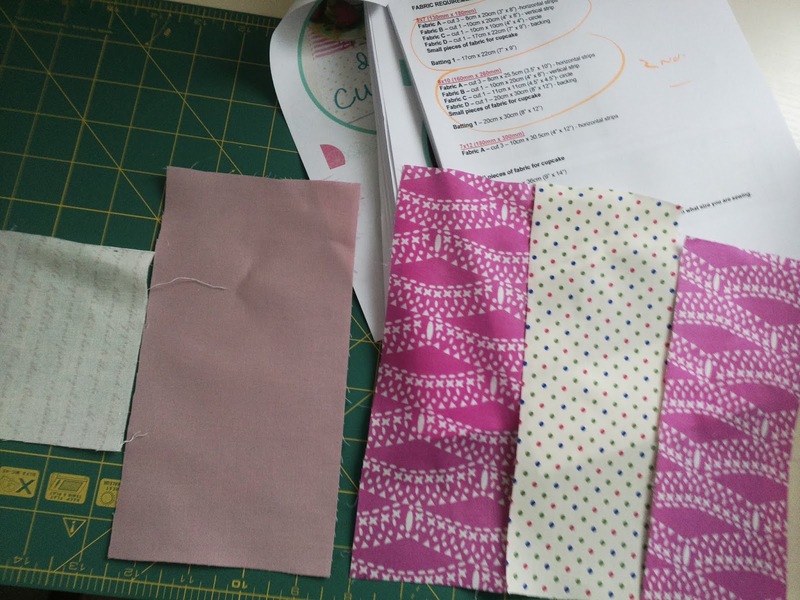 Preparation is key to stress free sewing no matter what pattern you are using. The top is exactly the same as in my previous blog post, so for instructions and link to order the pattern and supplies from Jaycotts go to this link Vogue fitted linen tops. On this post you will also find details of tacking thread and other methods of transferring pattern markings onto your fabric. 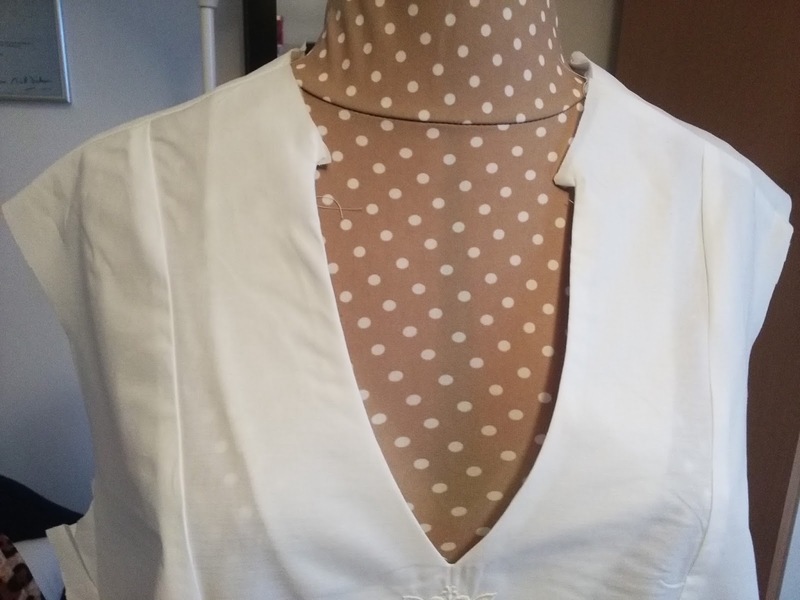 There are quite a few corners on this garment and the points need to be sharp. So this is how I do it. I trim the corner on the inside, bearing in mind that linen frays so I don't want to trim right up to the stitching, I want to cut away just enough to remove the bulk. 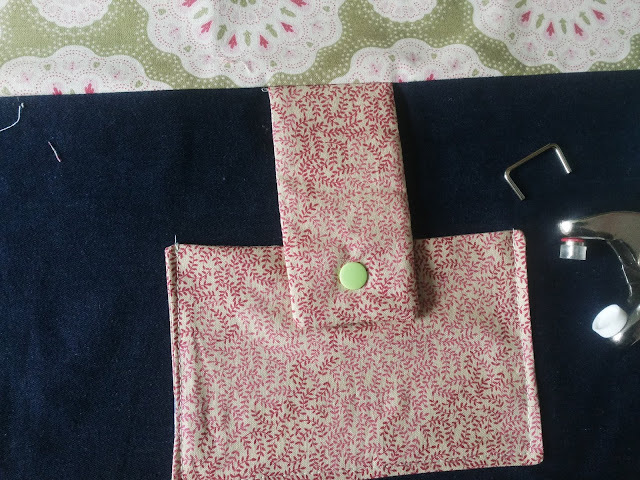 I pressed the seams open as far as I could, A sleeve pressing roll is so useful for this, Jaycotts have a fabulous range of pressing tools so take a look, Pressing tools If you do not have any yet I would definitely start with a sleeve roll ,a sleeve board and a pressing cloth. You will be using them for years to come so the initial expense is money well spent. I also love the pressing Mitt and the finger guards. You also need a point turner in your basic sewing kit, Point turner again this is an item which you will be using in many years to come. 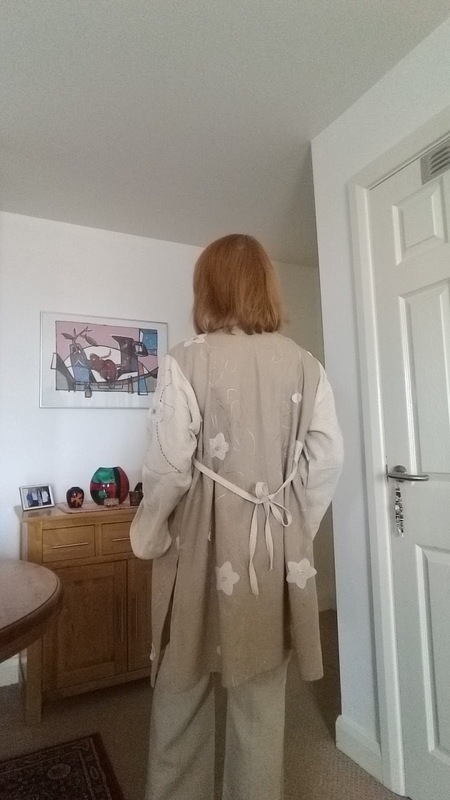 The back of the jacket has ties which can be fiddly to make. Not with this nifty gadget though! 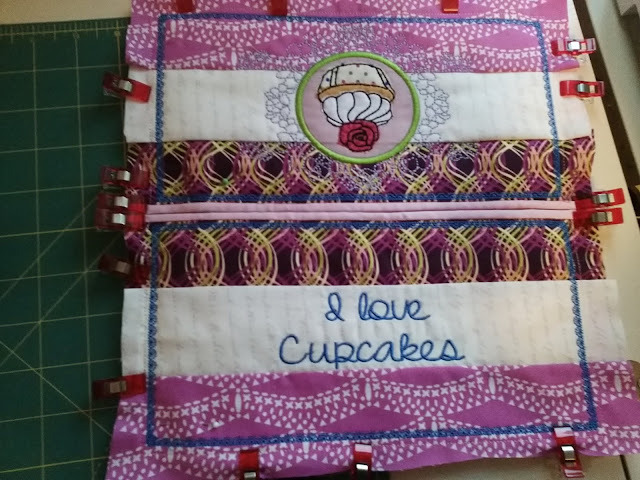 The Prym Turning Set makes strap making so easy, you will be thinking of lots of ways to use it! 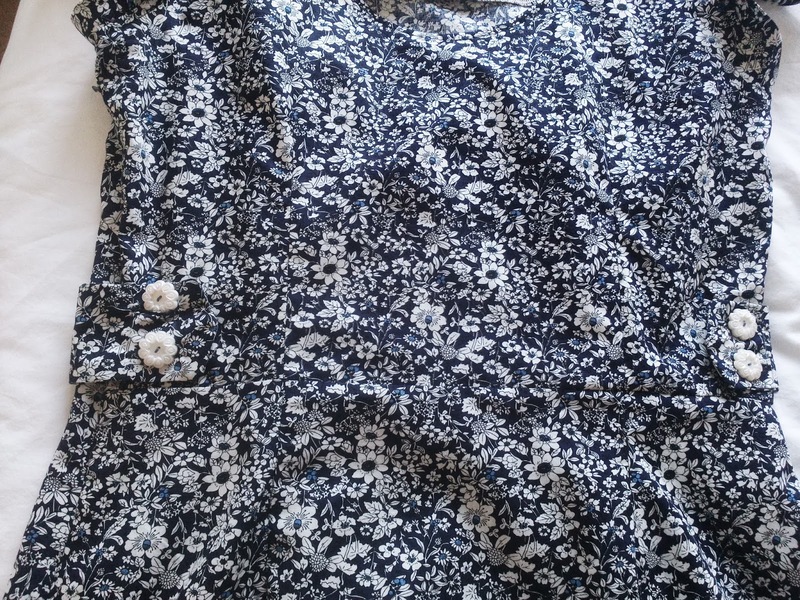 The sleeves are folded and held in place with buttons. I chose some cream ones with a gold border but you choose some really special ones to match your fabric . Jaycotts have some very pretty buttons, I particularly like the ones on the first row of this page, but they have others equally as nice. Buttons. My buttons are small so I put two on the front, one buttoning to the inside and two on each sleeve. I know that you are interested in what sewing machines I use. 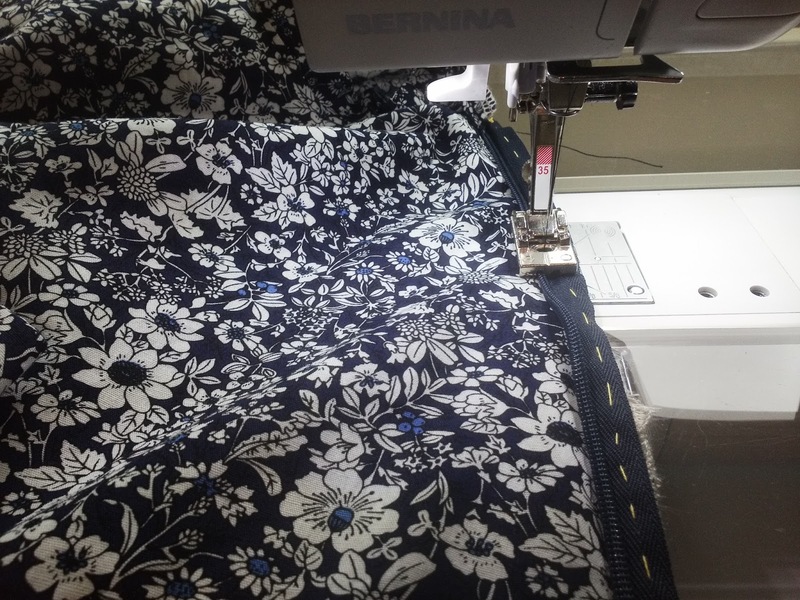 My main machine is the Bernina 350PE Bernina 350 PE and it is a fabulous machine. It is robust, reliable and has a wide choice of stitches including decorative stitches and Fonts. I really love and appreciate this machine. 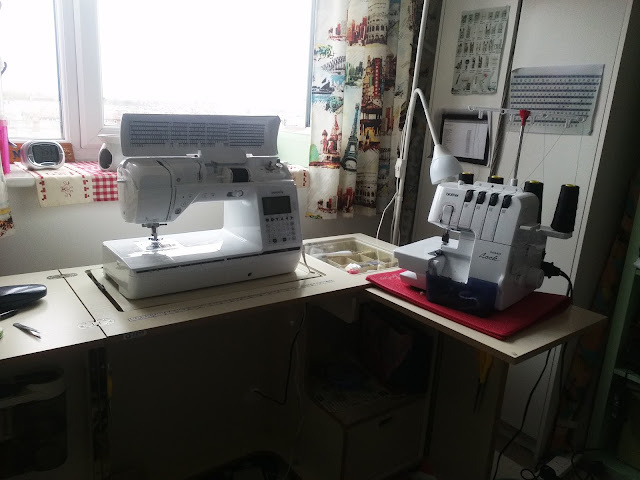 I also have a Brother sewing machine , which is the machine I carry around if I am giving a sewing lesson, or if I want to sit at the dining table for a change. Both of these are great machines and come in at different prices. 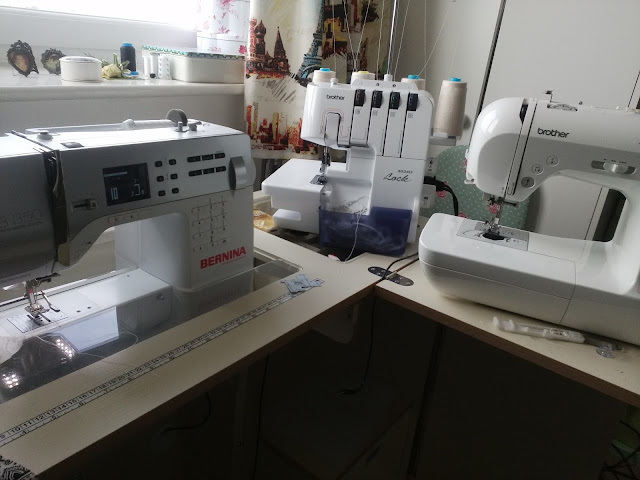 Choosing a sewing machine is something that should be given thought. My only bit of advice would be to choose something you can grow into as you become more proficient - and you will! Although I did not use my overlocker except for the trousers seams it is by Brother and I find it a dream to use. It copes with all fabrics and is easy to thread. It is the Brother 3034D overlocker. Again though there is plenty of choice at Jaycotts. All of my seams are French seams. 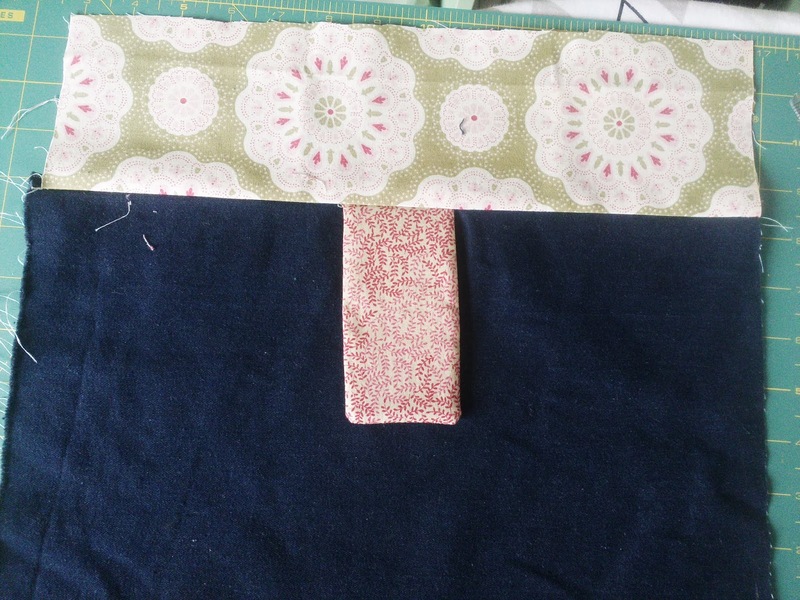 I have a tutorial all about seams so take a look, it really is a useful seam to be able to do. All about seams. 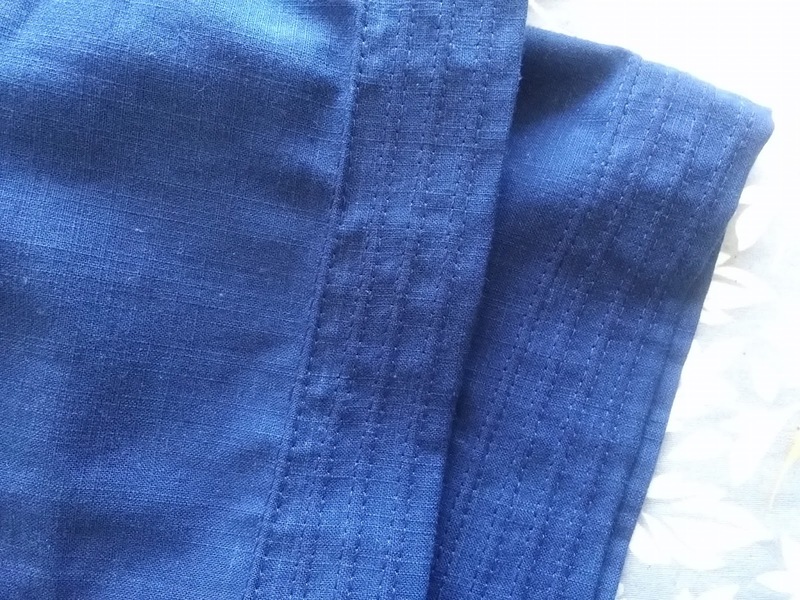 The sleeve head is neatened with a strip of fabric rather like a Hong Kong seam - details of how to do it is also on the post. There are no raw edges anywhere. 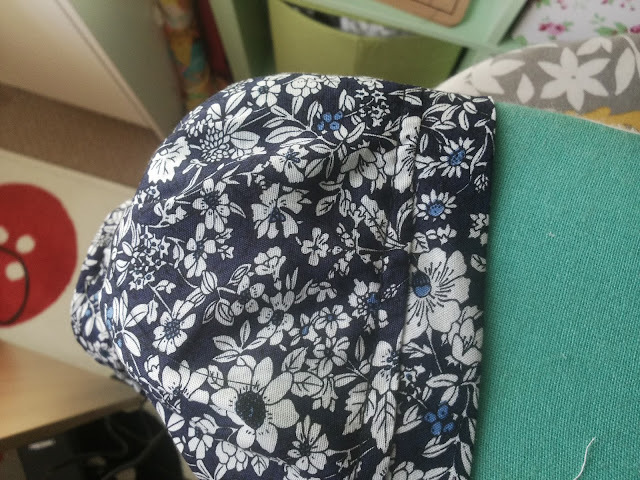 The sleeve was only meant to have one button folding the upper edge upwards, but I didn't like having the other corner flapping loosely so I folded that inwards and added a button to hold it in place. 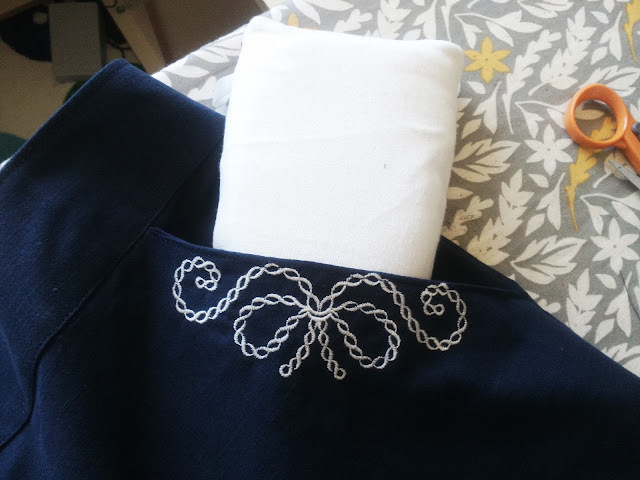 The sleeve fabric was plain so I did some random freestyle embroidery on my Bernina sewing machine purely to echo the design on the main fabric. I cut out a couple of flowers too and appliqued them onto the sleeves. It just tied the fabrics together nicely. This is a short video clip of the jacket. If you receive my posts by email it may not appear in which case just visit the post on my blog and you will be able to view it there. I am really pleased with this outfit. 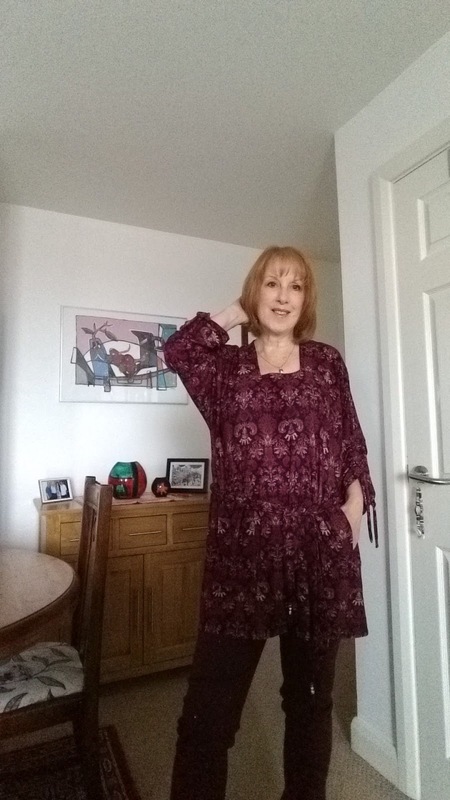 It is very different but extremely wearable, it's a great addition to my holiday wardrobe. Thank you for reading this post. 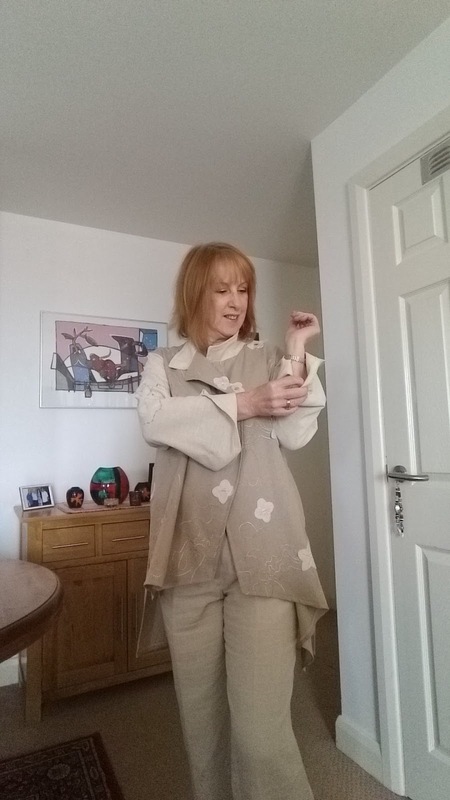 Have a look at your fabrics and see what you could combine to make an outfit. 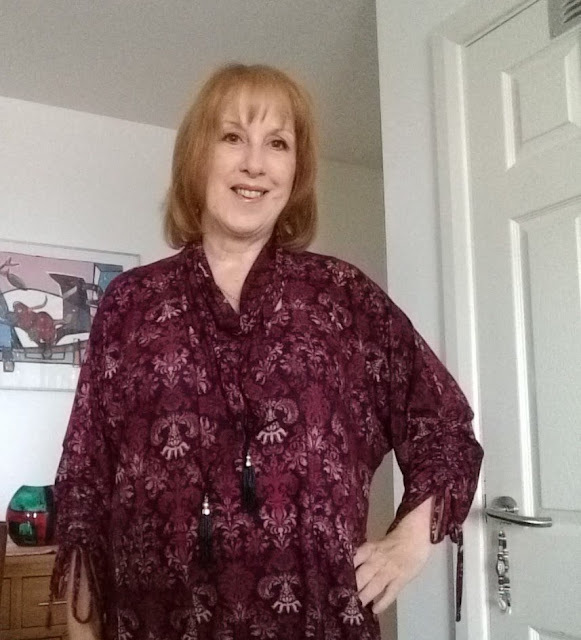 The weather is cooler and Autumn colours are starting to appear so I wanted something in rich Autumnal colours to wear. 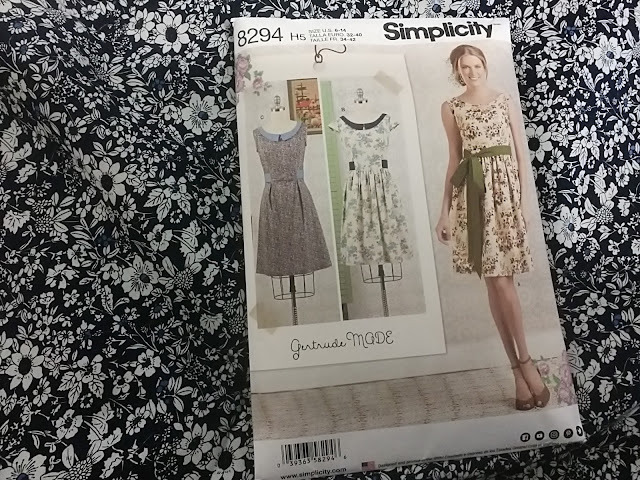 I chose this pattern by Simplicity. 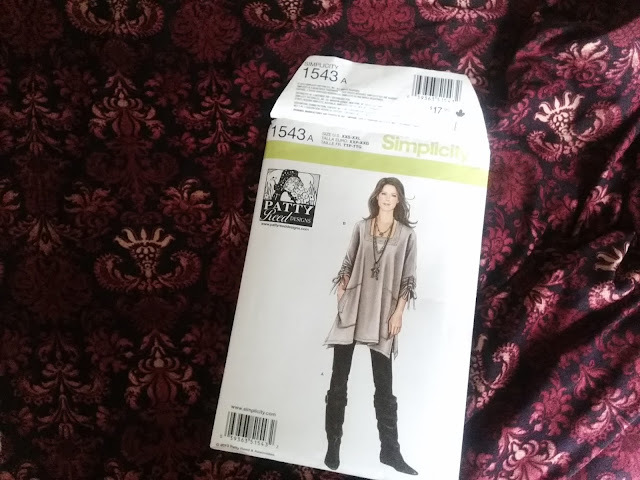 The pattern requires a stretch fabric which has a lot of drape. I chose this beautiful jersey from MinervaCrafts. The construction is simple , I especially like the sleeves which have rouleaux ties to gather them. There is a simple little tool which I absolutely adore from Jaycotts which makes rouleaux in seconds - seriously, there's no messing about! 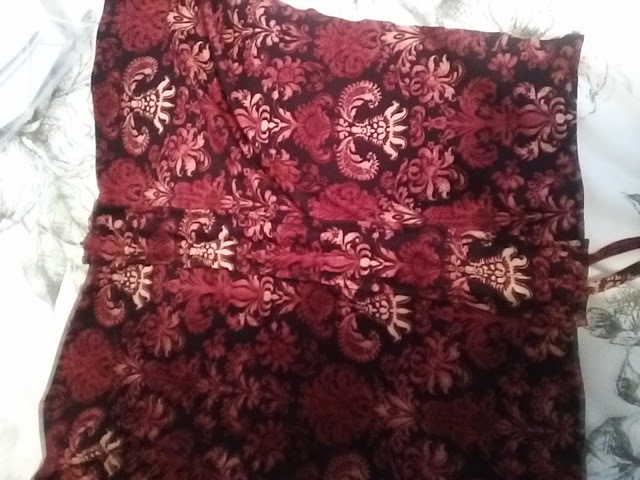 I made a scarf from a length of the fabric, rounding the ends and sewing right sides together before turning right sides out. 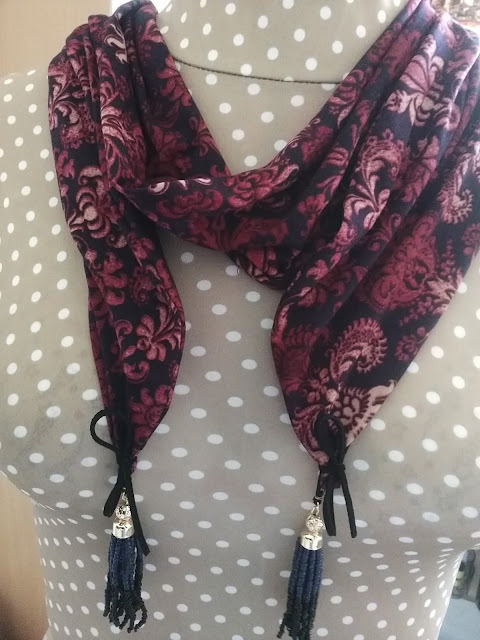 This is a very unusual make, the top is extremely comfortable and forgiving! To make it easier choose a plain fabric so that there is no pattern matching. This is such an easy outfit to make, with or without embroidery. It is suitable for beginners upwards. When I first saw this pattern I wasn't sure if it would suit me or not. Wrong! 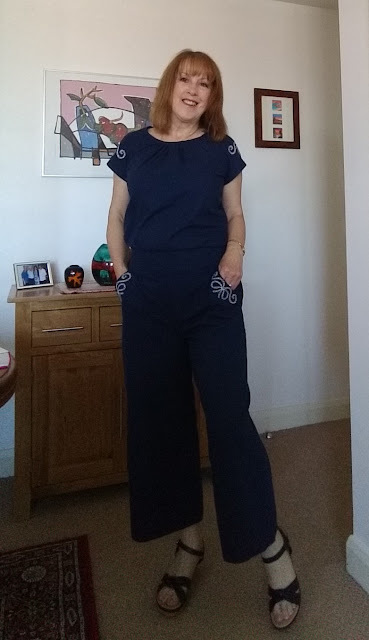 I decided as soon as I tried it on that I love this outfit.It is perfect for holidays, flattering and easy to sew. I like the 3/4 length wide trousers, they are cool to wear in the sun - I like to cover up mostly and I want garments which are easy to wear and light to pack. 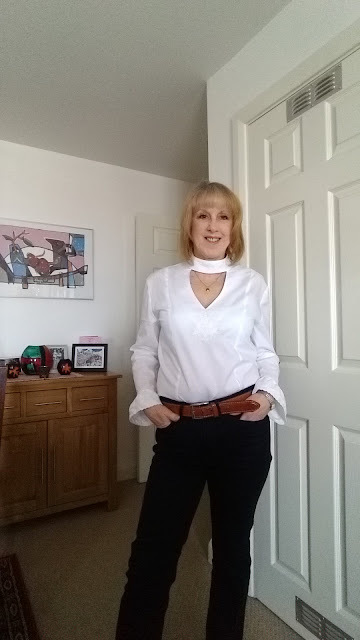 I have paired the outfit with a pair of navy wedges. 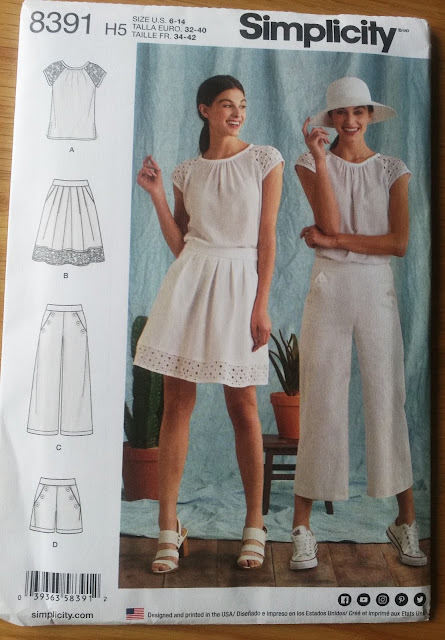 The pattern is by Simplicity and is available to purchase from Jaycotts Simplicity 8391 In the envelope are patterns for a top, skirt, pants and shorts, everything you need for your holiday in fact. 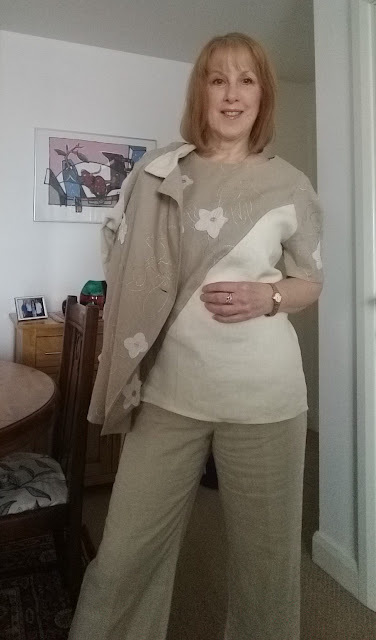 The fabric is from Minerva Crafts and is a linen look Cotton, Linen look Cotton fabric This fabric is cool to wear and very easy to sew. 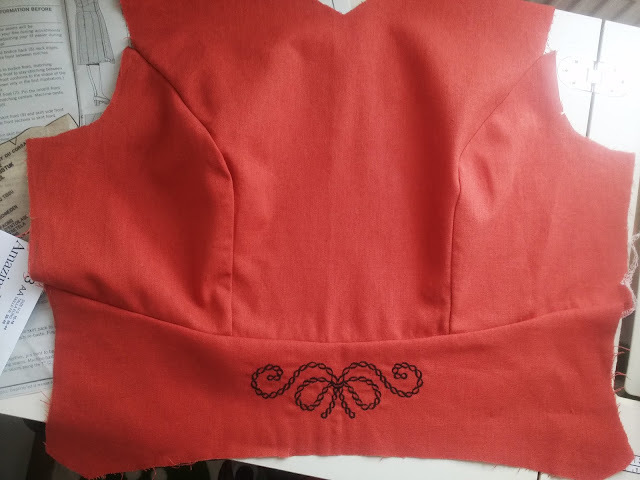 The pattern shows the garments made up in cotton trimmed with eyelet fabric or lace, but I wanted to use embroidery on mine - of course! 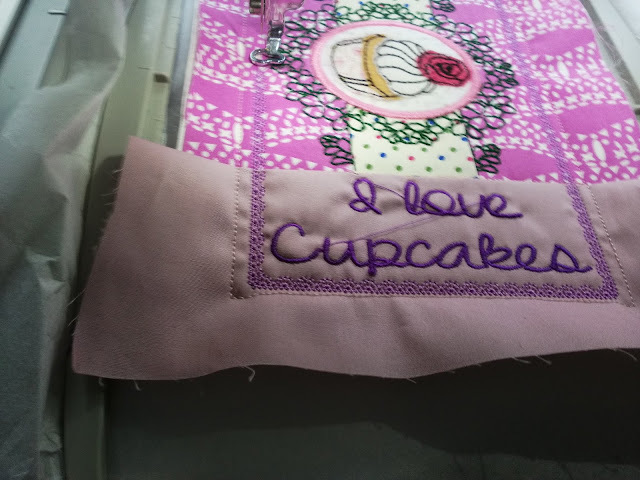 If you are adding embroidery by hand or machine, or applique, you need to position it correctly onto your garment. I chose a rope design which I wanted to add to the top and the trouser pockets. This is a very simple design from Ann the Gran.com some of the designs are free, others you need to pay for. 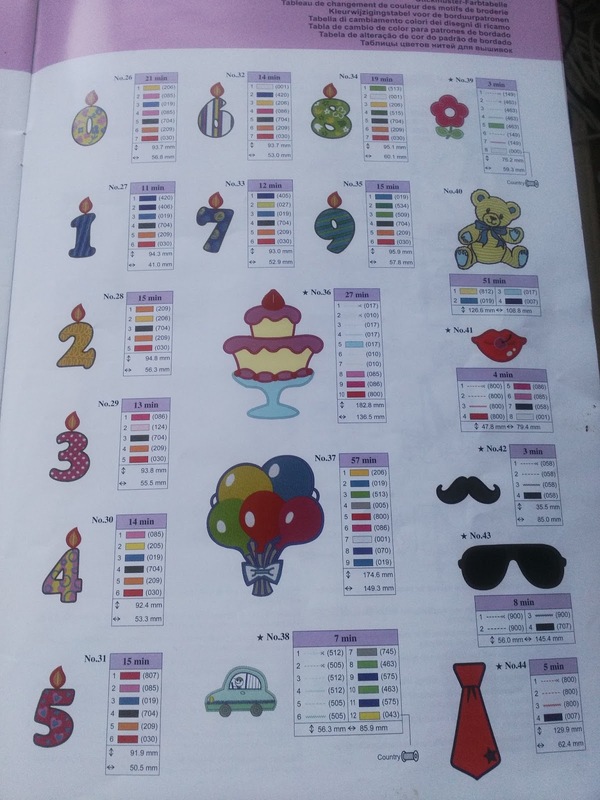 Those of you with a brother embroidery machine will know that brother have designs to download in addition to those stored on the machine itself. 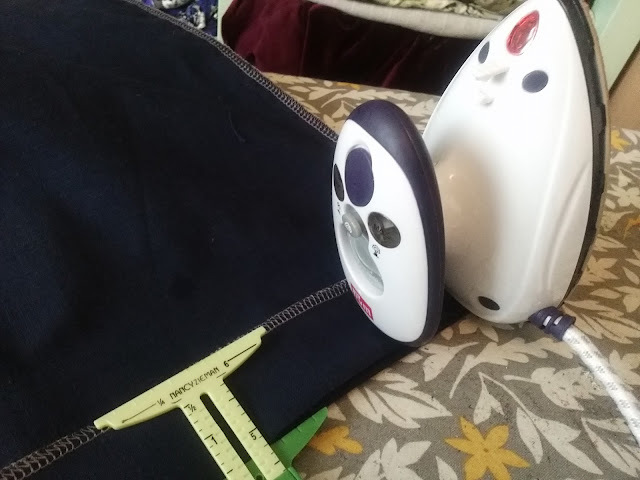 I want to have a design running the length of the pocket so my first step was to measure the length needed and choose my design to fit ,tweaking the actual size on my machine settings. you will notice that I have marked the cutting line but not finished cutting out.This just makes it easier to hoop. mark the centre of the pocket and then mark where you want the centre of the embroidery to sit. I use a hole strengthener for this as they are easy to see and easy to remove. 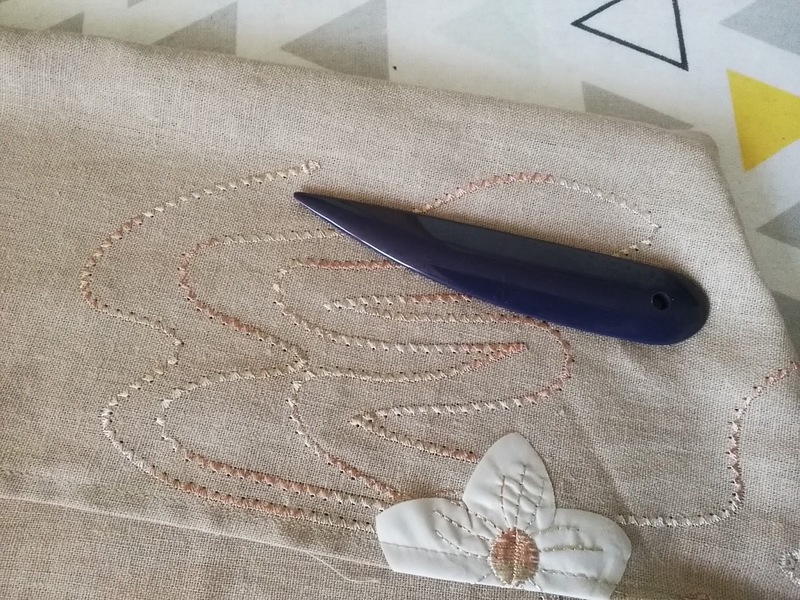 I also take my tailors chalk and a ruler and gently mark a line parallel to the edge so that I could position the embroidery in line with the edge. There are a lot of stabilisers to choose from. For this project I used GUNOLD Gunold easy tear stabiliser with a temporary spray adhesive. The area to be embroidered is to small to fill the hoop so I took great care to ensure that it was firmly attached to the stabiliser. I used a few links at the very edge in addition to the spray glue. 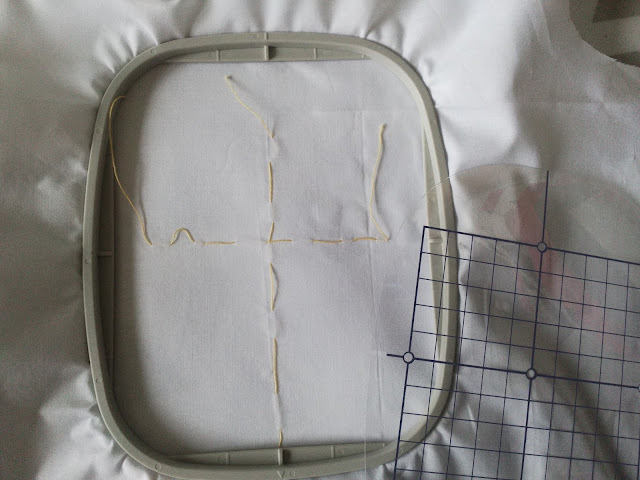 I used the embroidery hoop guide to position my fabric in exactly the right position, with my fabric markings matching the lines on the guide exactly. The circle is placed exact centre. 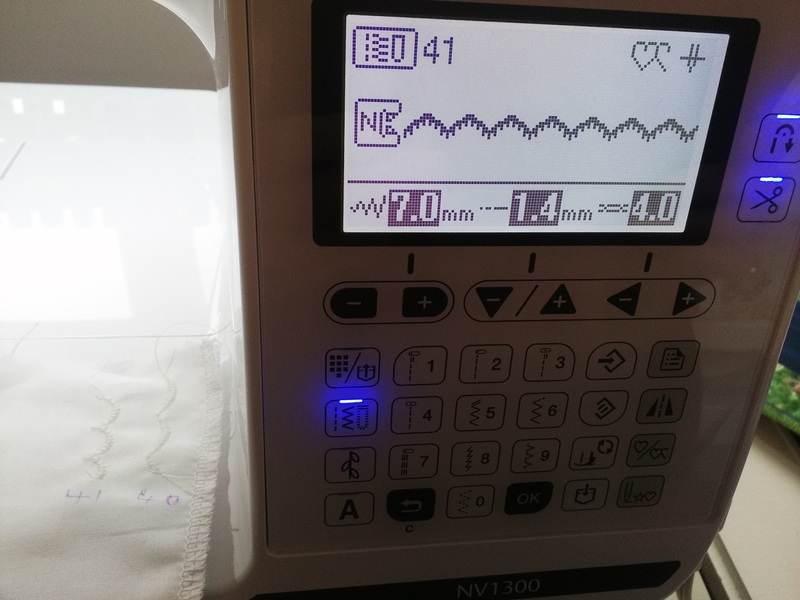 Once my machine is set up I can check that the needle is in the correct position and if it is the circle can be removed and the embroidery done. If not then the fabric or needle position needs moving a bit until you are satisfied that the embroidery will be in the correct position. I chose a Brother Country thread 000 which is an off-white. Brother EmbroideryThreads There are many more colours in stock than there are on the web site so do ask if you have a particular shade in mind. Or better still call in for a visit! I made sure that I altered the direction of my design so that it faced in the correct direction on both pockets. 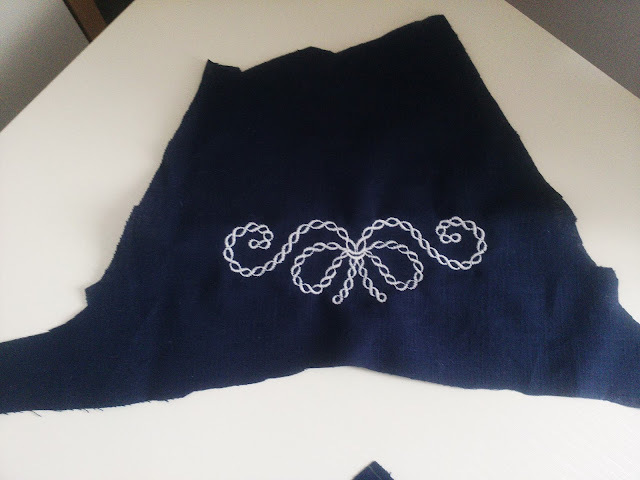 I then did the whole procedure again and embroidered the sleeves. Remove the stabiliser from all the pieces when the designs are done. 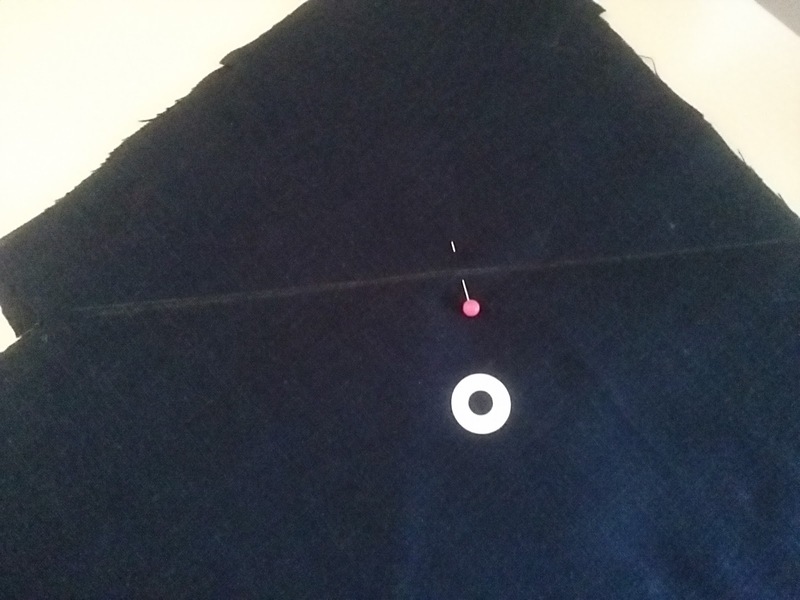 This photograph is showing the neck band being pinned in place before sewing. 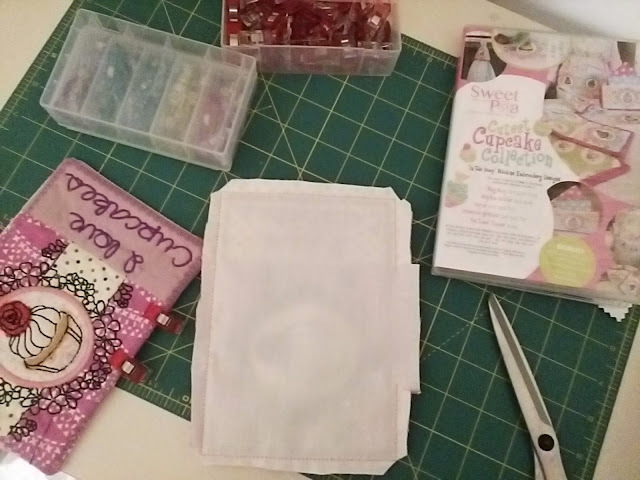 To make the little loop which closes the back I used this fabulous product, it makes turning looks so easy. 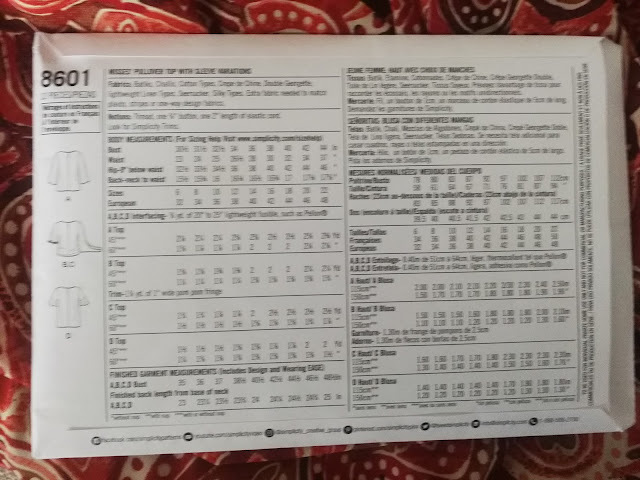 It is the Prym Turning set and I promise you that you will love it and will be looking for excuses to add loops to lots of garments. Finish the top according to the instructions, but if you get stuck let me know and I will help you. I want to concentrate on trousers because so many people are scared of them. 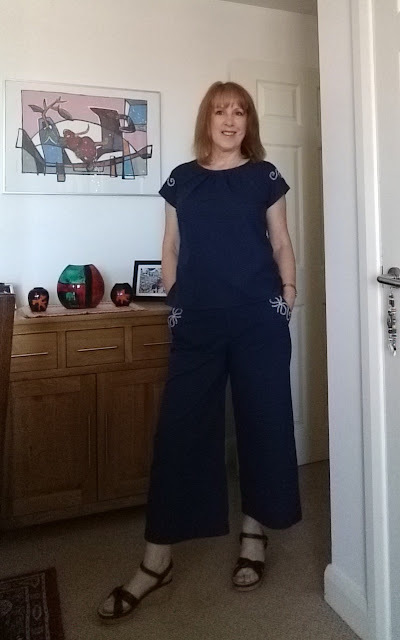 I chose this pattern because the trousers are loose fitting and easy to construct. 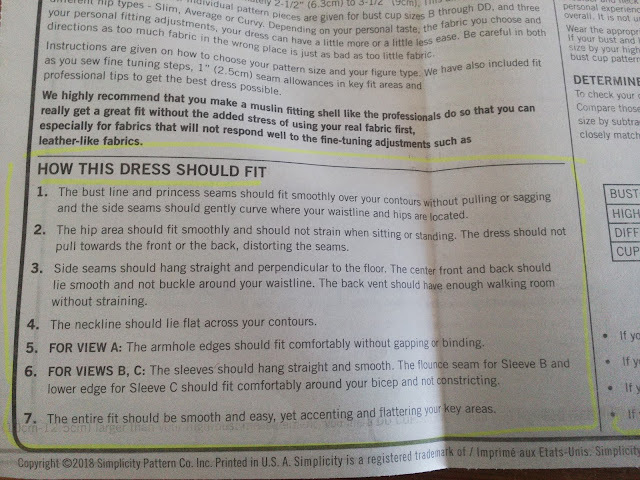 You may need to merge the pattern sizes from one size to another if for example you have size 14 waist and 16 hips etc. This is perfectly permissable and will ensure a great fit. 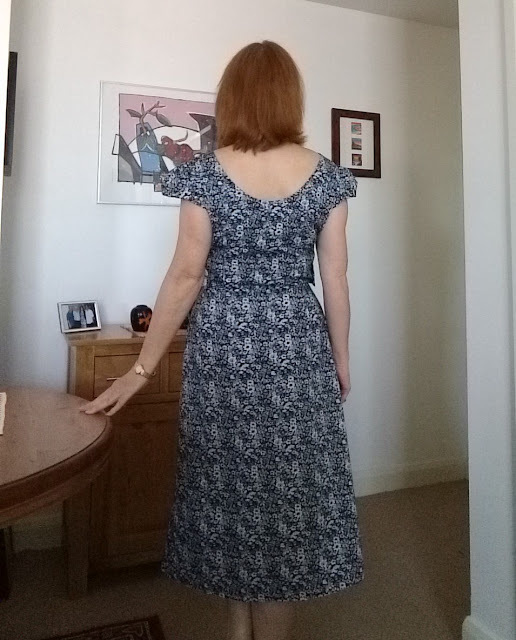 I like my waist band to have a bit of room in it but I like a close fit over the hips. 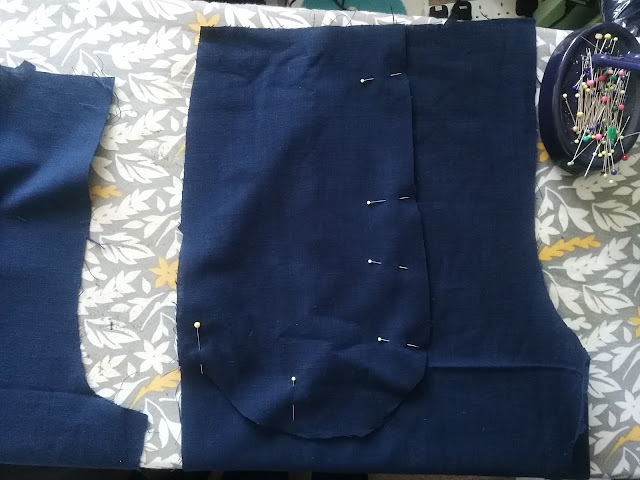 Luckily my pattern fit me with no adjustments but I feel that a lot of people may want to extend the waist line a bit, so do cut out a size bigger than you think and when it comes to fitting just take the pants in at the hips which is easy to do. The first stage is to attach the front yokes to the trousers and press and turn them to the inside. This forms the front of the pocket. 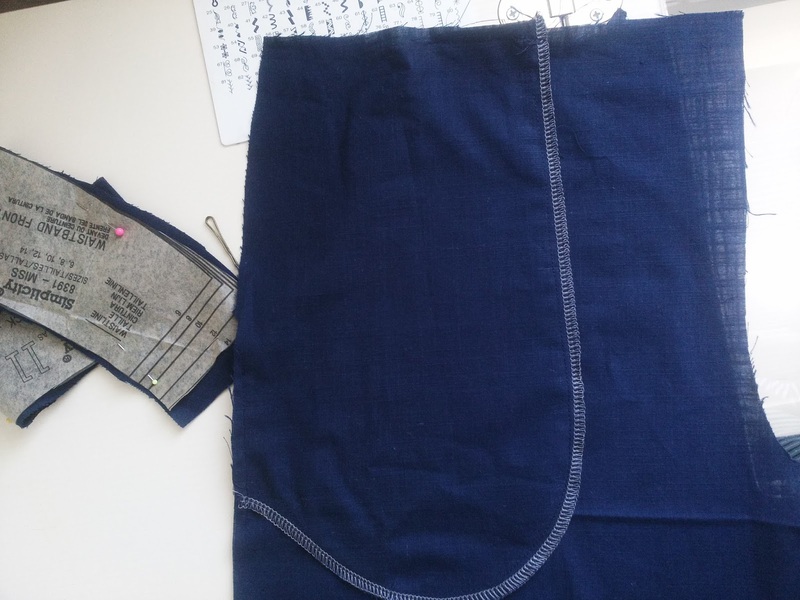 Then the pocket lining is stitched in place. I used my overlocker on all seams. The pocket is now finished, it just needs a final press to turn the facing properly to the inside. 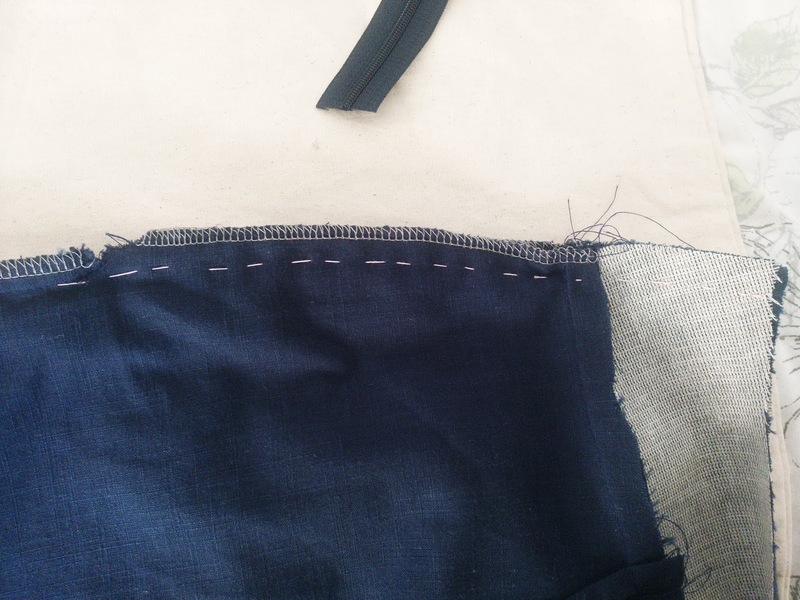 Any top stitching should be done before the pocket facing is stitched in place. The pocket bag has been sewn and overlocked. This strengthens the pocket and helps to ensure holes do not appear. If you do not have an overlocker then stich twice around the pocket bag and then zigzag around the edge. Stitch the front leg to the back leg and then stitch the centre front and back seam. For strength once again double stitch the seam and then overlock or zigzag. 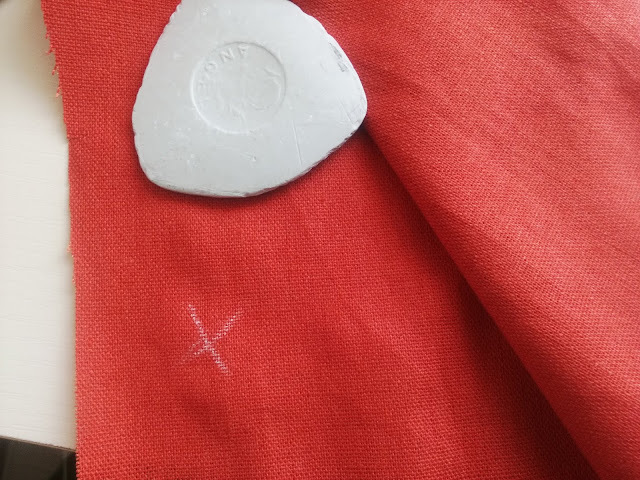 The facing has been interfaced with a medium to heavy weight iron-on cotton interfacing.Vilene cotton interfacing. It is important that you use the correct interfacing. 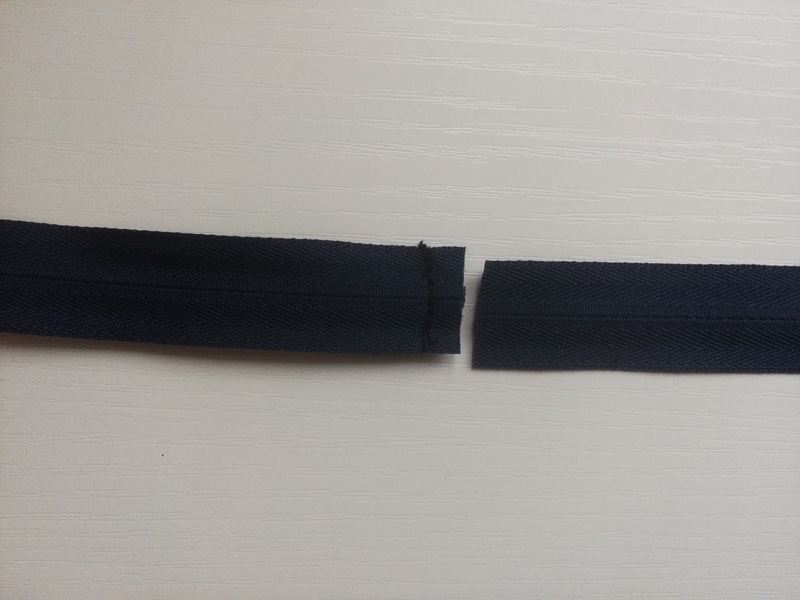 A waistband needs to be firm enough not to crumple during wear. I prefer to use a cotton or a woven interfacing as they move with the fabric and give a good result. If you use a very cheap interfacing the result will not be so good and you will not be happy with how it wears. 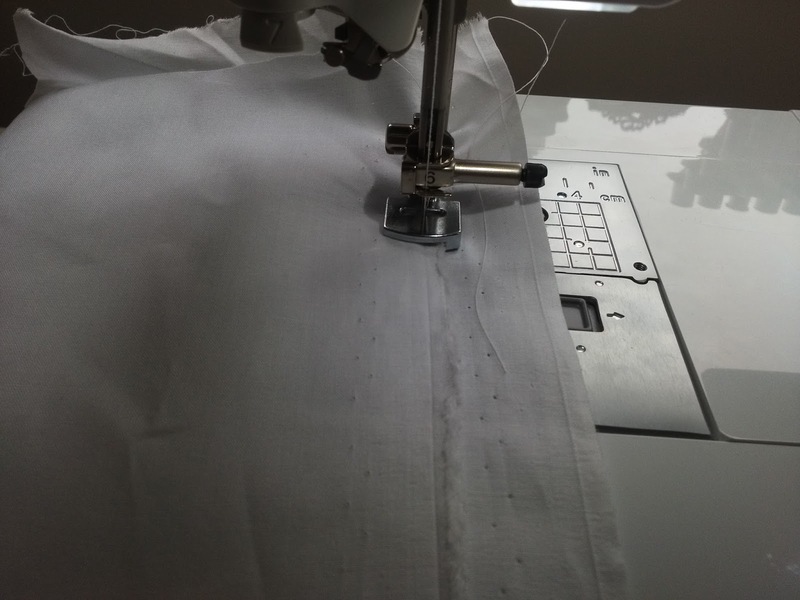 It is false economy to use a cheap interfacing for garments. See the whole range here Interfacings. 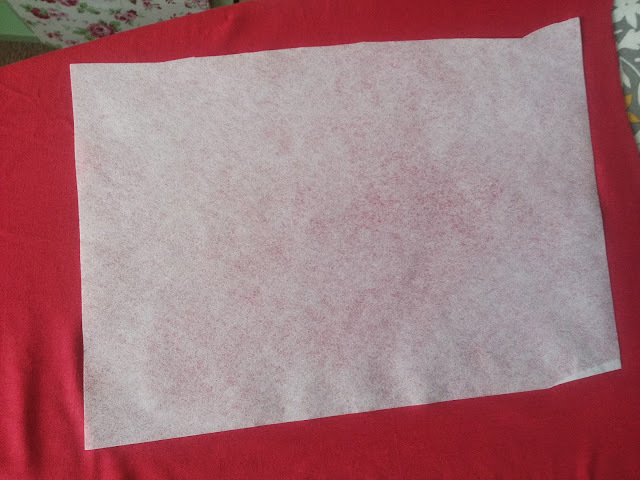 When attaching interfacing use a damp pressing cloth with your iron and press the iron on one place, lift and move it to the next until you have attached all the interfacing. Don't slide your iron over the fabric. 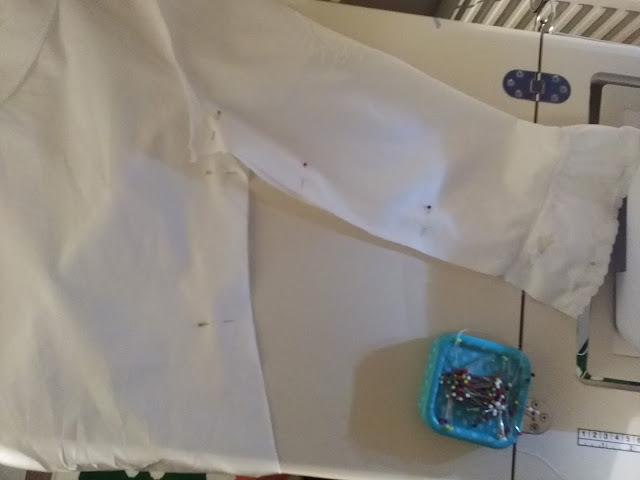 One of the things I am told people hate sewing are invisible zips. They do require a bit of practice but once you master them you will be delighted with the result. There are alternatives though and for this garment I am using an ordinary zip. 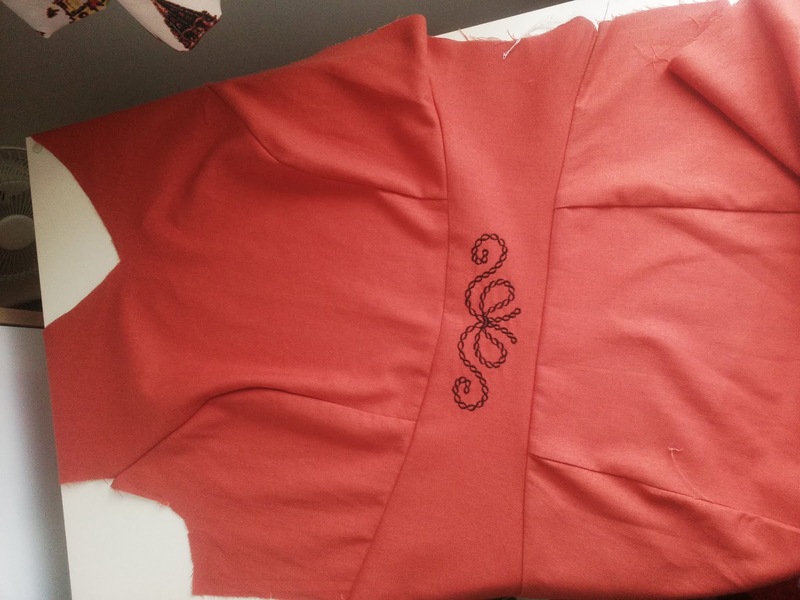 There are different ways of inserting it and I am going to show you how to insert a centred zip. This is easy! First of all choose a good quality zip in a colour close to your fabric YKK zips. Suppose you cannot find the correct length? Did you know that they can be shortened very easily? Measure the length you need and go over that point a few times with several rows of machine stitching on top of each other. 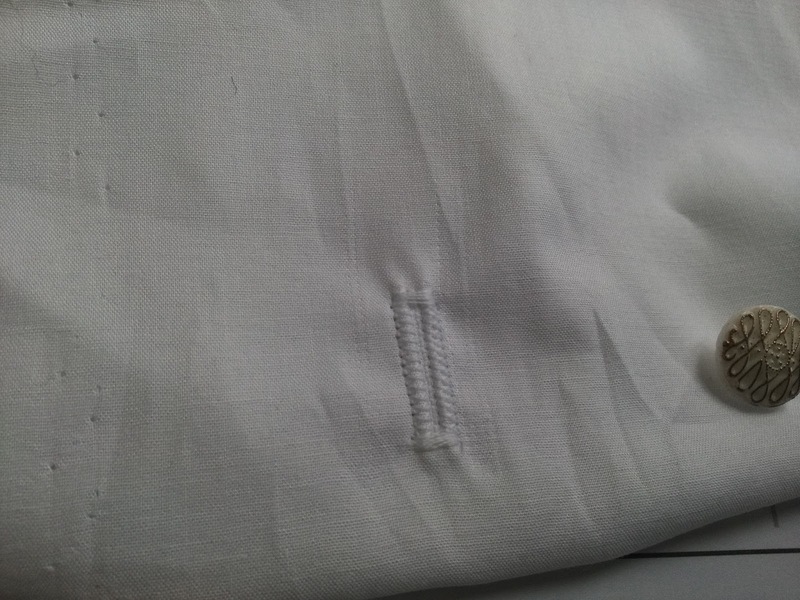 Then cut the end off below the stitching . And that's it. 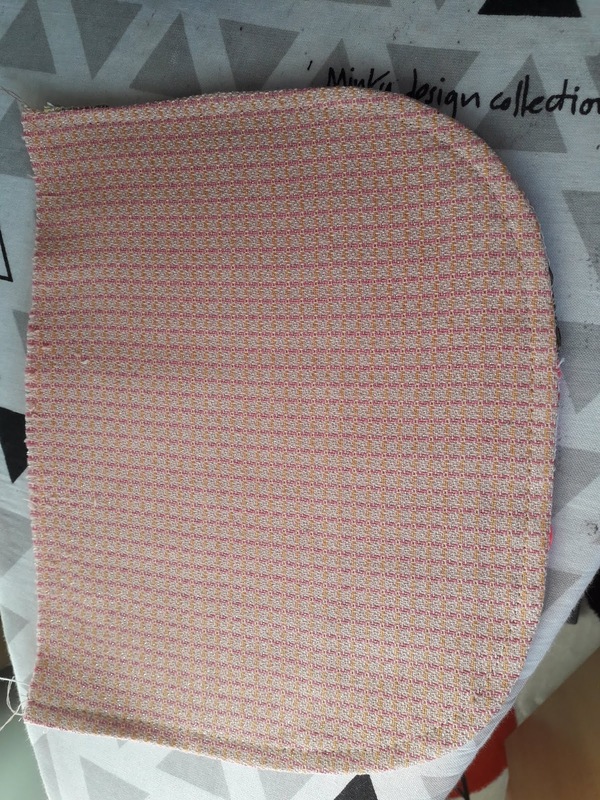 Once tacked press the seam open. On the wrong side pin and tack the zip over the seam. 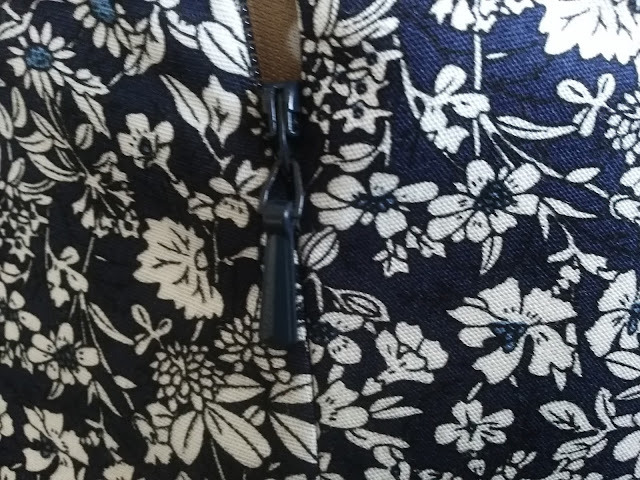 The zip should be face down and the teeth centred over the seam opening. 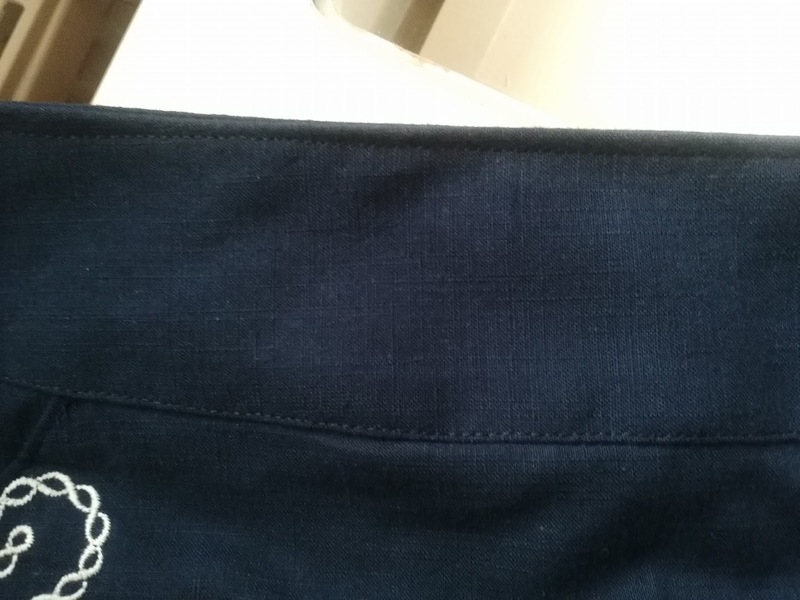 Make sure that the waistband seam matches on both sides. 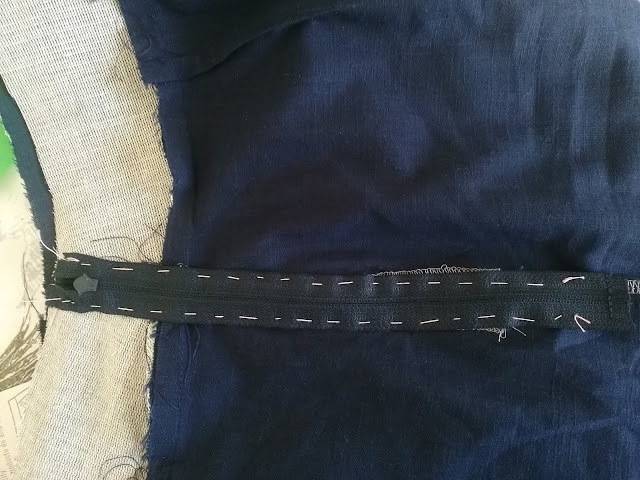 Using a normal zipper foot, which should have come with your machine, stitch in a rectangle from the top of the zip, across the bottom and up the other side. 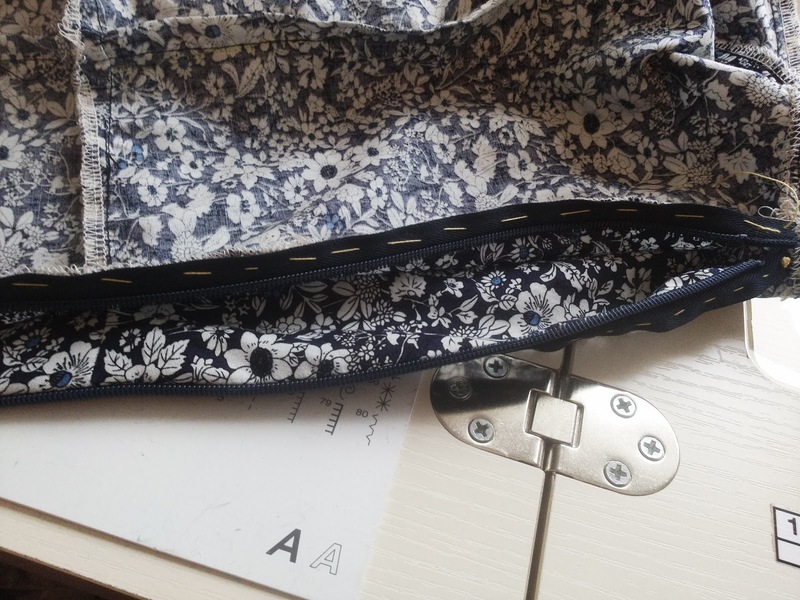 You will probably need to release the tacking in the seam at the top to be able to stitch past the zip pull. If you have not got a zip foot, Jaycotts have them. 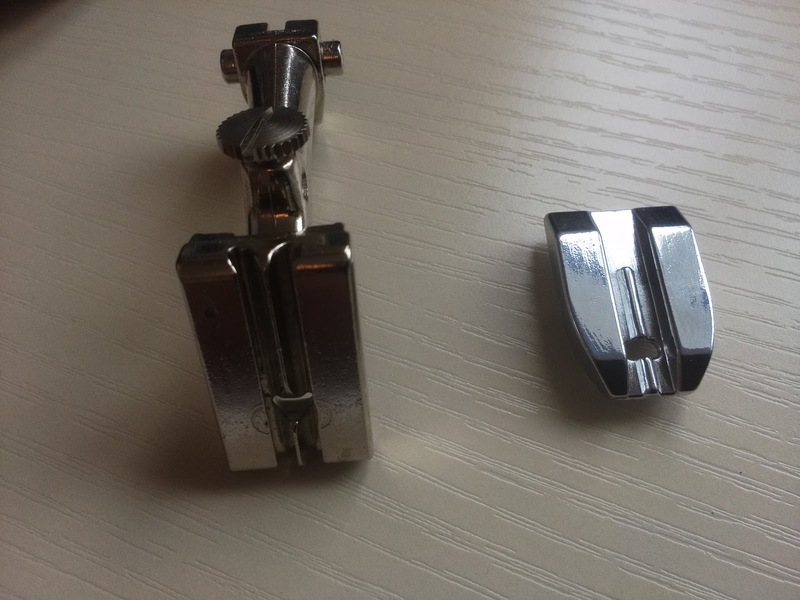 This is the foot for the Brother range of machines Brother adjustable zipper and piping foot if you need another brand then contact Jaycotts who will help you to choose the right one for your machine Contact details below. That's my zip in place. Press it using a pressing cloth taking care not to melt the plastic teeth. If your zip does not finish exactly at the top of your trousers, or if your zip opens easily (YKK zips stay closed until you open them) you will need to add a hook and eye to close the very top. Then attach the waistband facing. And press. 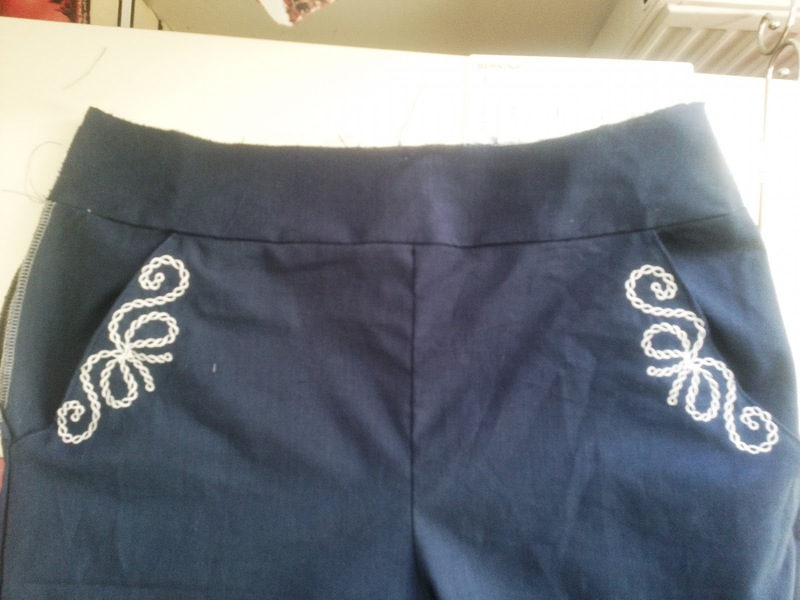 I top stitched both the top and the bottom of the waistband for extra strength and to hold it in place. All there is left to do now is to finish the hem. Try the pants on and decide how long they need to be. 3/4 length trousers like these should be slightly above the ankle. I used my overlocker ( Overlockers ) to finish the edge of the trousers. 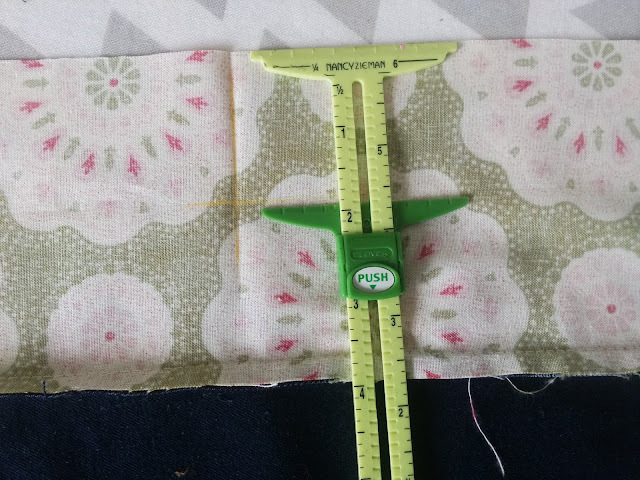 Using a seam measure, this is the one I use, Clover seam gauge measure the depth of the hem all the way round and press the edge taking care not to scotch the fabric. I use the fabulous little iron from Prym. Prym mini Steam iron. Don't let it's size fool you, this has everything you need in an iron and performs every bit as well as your large iron! If you are a person who takes a travel iron on holiday, then this iron is definitely for you. You also need a pressing cloth. This is essential if you are to avoid scorching or otherwise marking your fabric. Prym pressing cloth I do like this one as it is transparent and makes it so easy to see what is going on underneath. 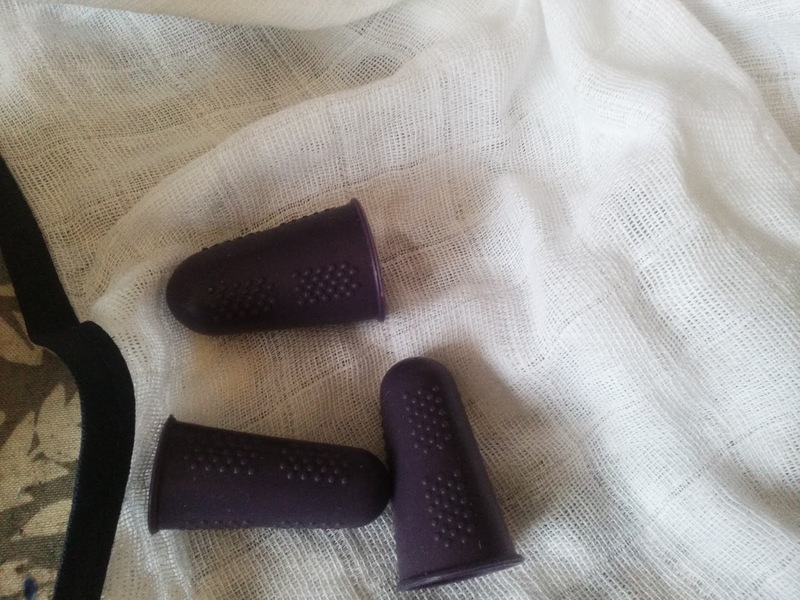 Another essential are these finger guards Finger guards which help you to hold the fabric close to the iron without burning your fingers. 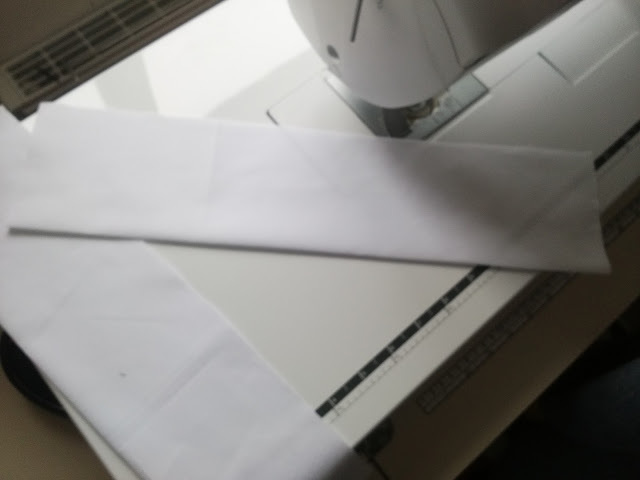 To finish the hem I decided to do a few rows of pintucks. I am always looking for nice finishing touches, it makes any garment look more original. If you do not have a pintuck foot then you can obtain a similar result using just a twin needle, but take care to align your stitches up. The pintuck foot does make it easier. 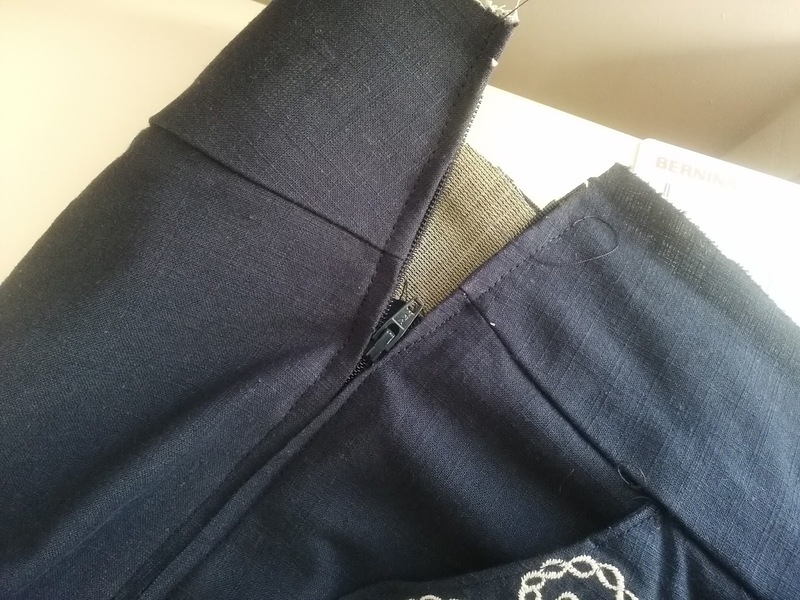 After completing the first row along the bottom of each trouser leg continue with as many rows of pintucks as you want, it is better to have pintucks along the whole depth of the hem to hold it neatly in place. You can see the slightly raised effect of the pintucks on the photo above. Have you ever wanted to press a tiny part of a garment easily? I wanted to give the pocket a final press but did not want to leave an imprint on the fabric behind. 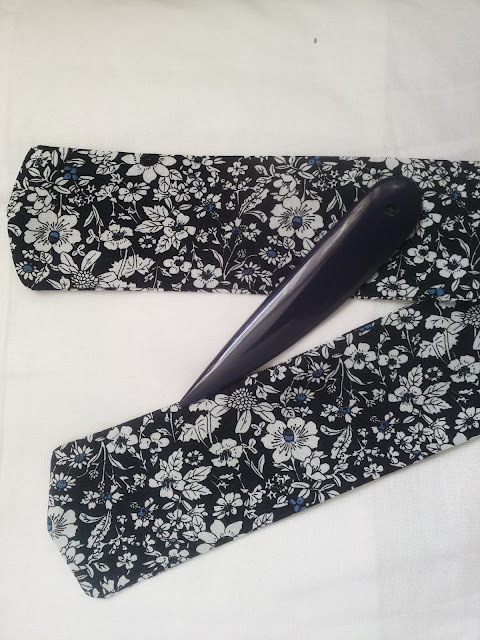 To solve this I used this pressing glove Pressing glove which is so useful for this purpose and is also invaluable for pressing collars and cuffs and other small areas when you don't want to get your ironing board out. This is my finished outfit. It looks equally great with the top tucked in or left out. The neutral embroidery means that each piece can be worn with other items. It can be worn as a casual outfit for sightseeing with flat sandals or dressed up with heels for lunch. It is extremely comfortable to wear and the fabric being cotton is cool for warmer climates. 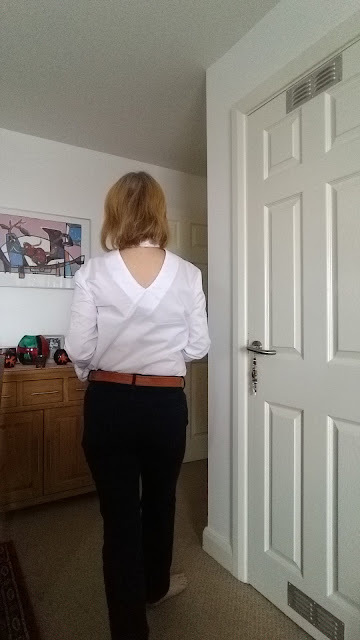 I did a slightly tongue in cheek video which shows you the outfit being worn. It reminds me of my much younger days when I did a spot of modelling, but that's another story! Don't forget too that you can visit the showroom and test run the machines before you buy. Thank you for reading this post. Please contact me if there is anything you would like me to clarify and don't forget to contact Jaycotts with any product enquiries and to place your order. 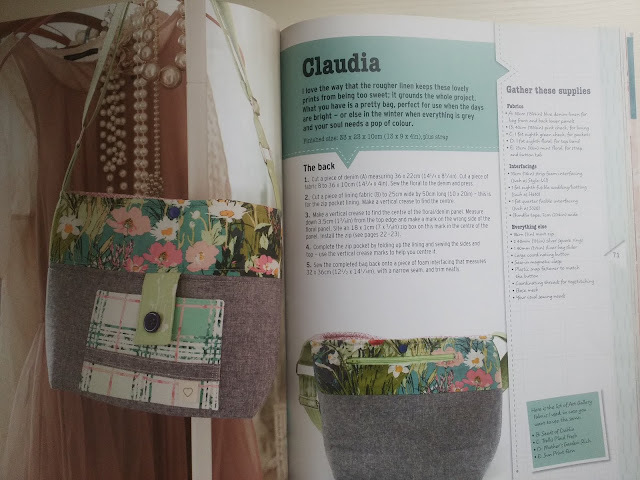 Have you sent for your free catalogue yet? It's my favourite catalogue to browse through when having my morning coffee. 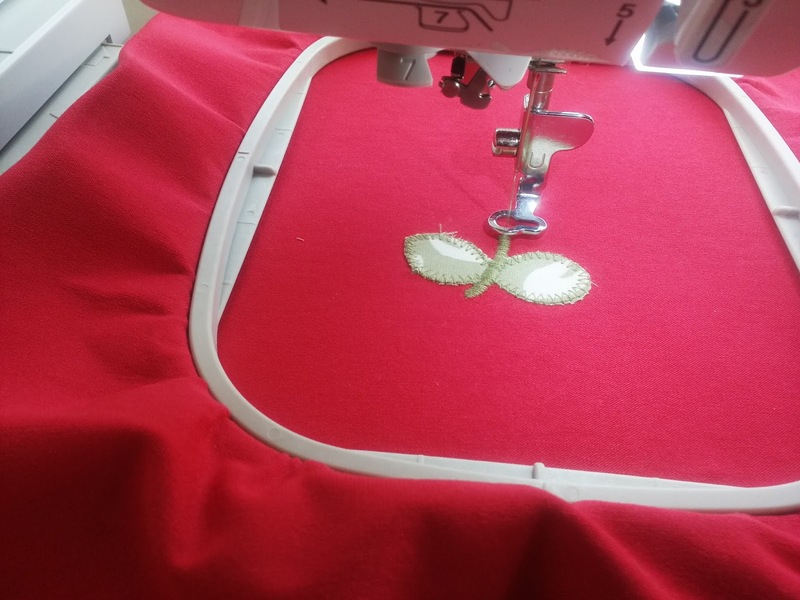 It's so easy to use your embroidery machine to applique garments, bags and household items. 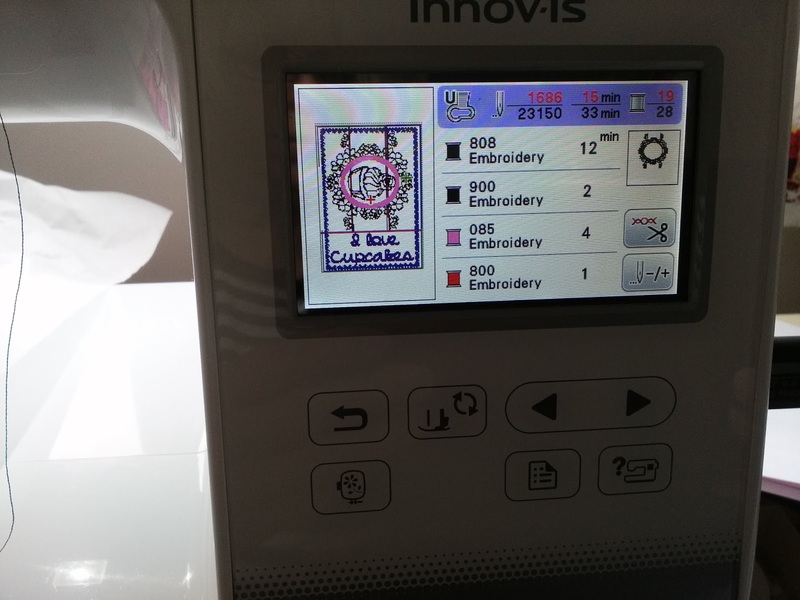 My Brother Innov-is 800E not only does beautiful embroidery and makes free standing lace but it also creates applique easily and quickly. In other words this one machine does everything you need to embelish your sewing project. Or indeed a ready made item! 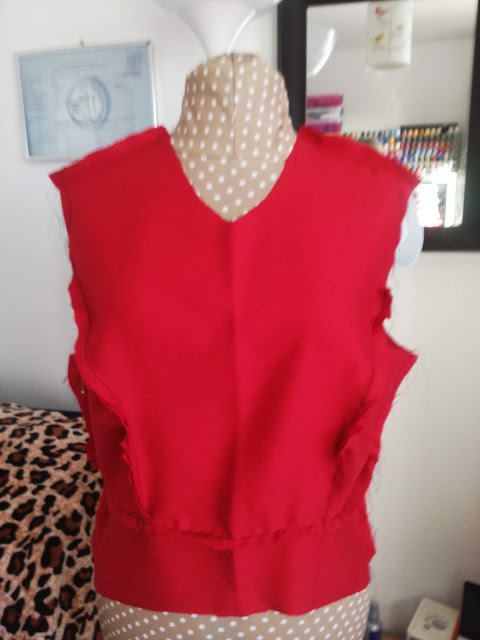 I am currently making a red jersey top ( watch out for it in my next blog post) and wanted a simple embelishment to add to it. A small appliqué flower was the answer. This is my embroidery machine. I do love Brother machines, they are reliable, innovative and come in a huge range of prices to suit all budgets. 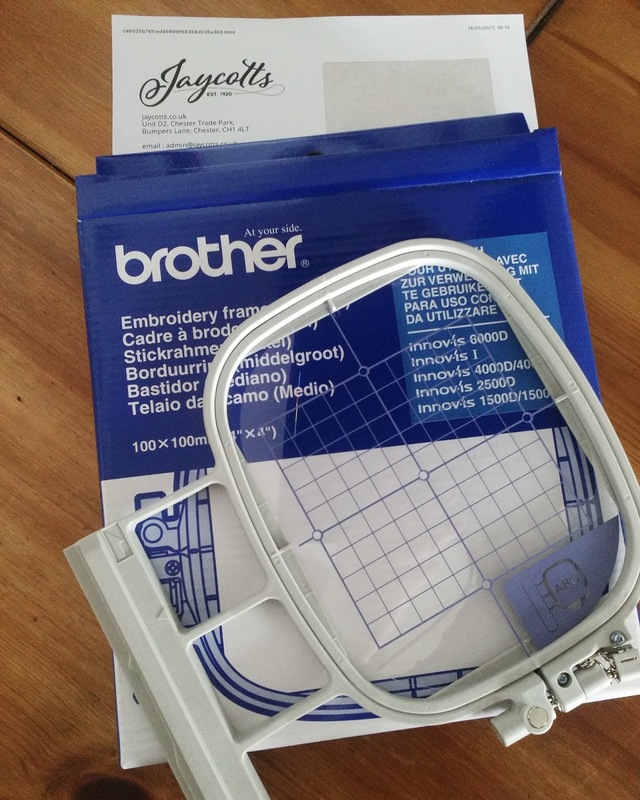 If you are interested in a Brother Embroidery machine, or any other machine, I suggest that you have a chat with Jaycotts, contact details below, to find the best machine to suit your needs and your budget. There are various hoop sizes available to fit this machine, Brother Embroidery Hoops Mostly I use the largest one but I have found when embroidering on stretch fabrics better results are achieved with a smaller hoop. It is really easy to view which of the inbuilt designs are suitable for each hoop as it is all displayed on the touch-screen. The hoop I am using for this project is 4"x4" and I find that it is perfect for this type of fabric. 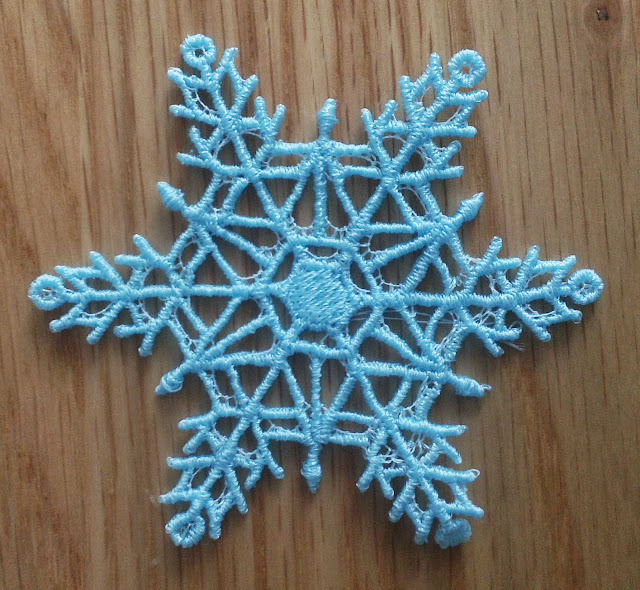 You will need threads, embroidery needles and various stabilisers. More about stabilisers later. 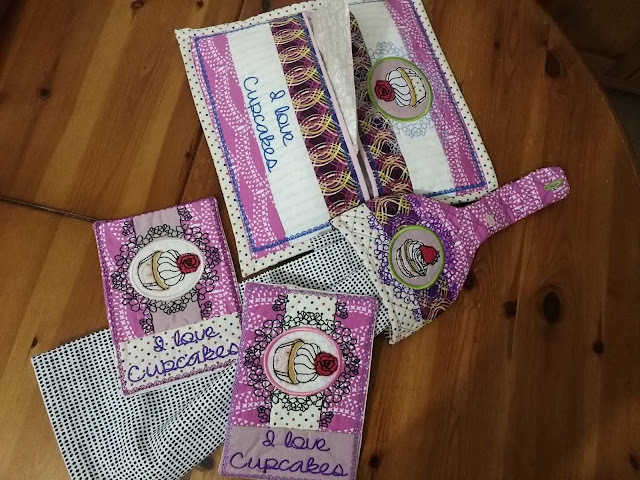 There are a lot of Embroidery and applique patterns built into your machine, these are a selection of the applique designs. The design has a list of threads next to it which tells you what colour you need and the order you need it. When using a smaller hoop this problem does not occur for me, and when using a woven fabric either of the stabilisers works very well. The steps needed to produce the appliqué are fully explained in the manual and also on the display screen. 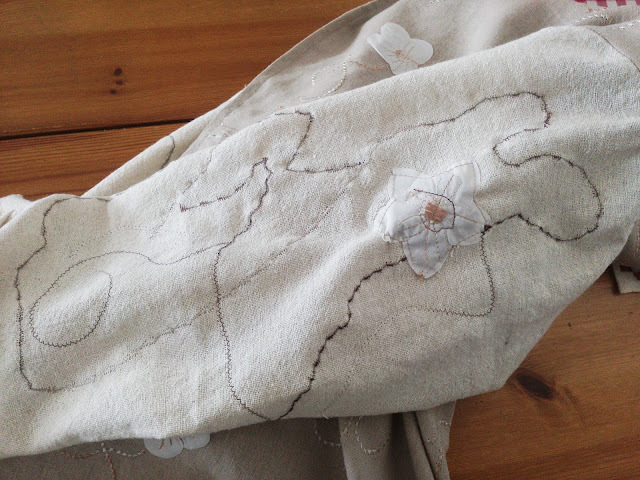 The first thing you need to do is to hoop your stabilised appliqué fabrics , in my case a flower head and petals. The machine embroiders the outline and you cut them out. What could be simpler. You then insert your stabilised main fabric into the hoop in the position where you want your appliqué to go. 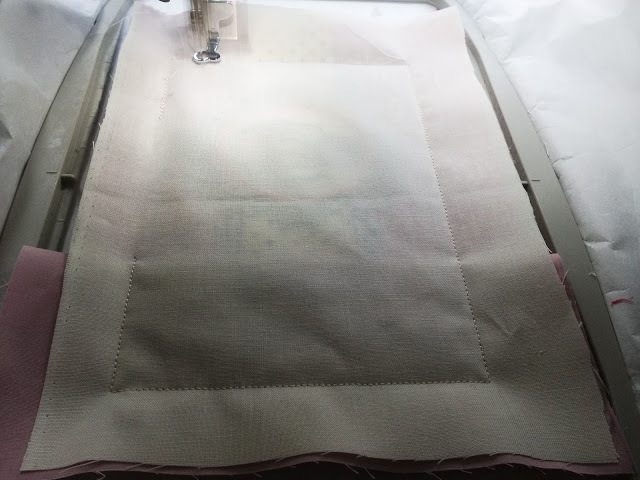 The machine then embroiders the outline of the design. 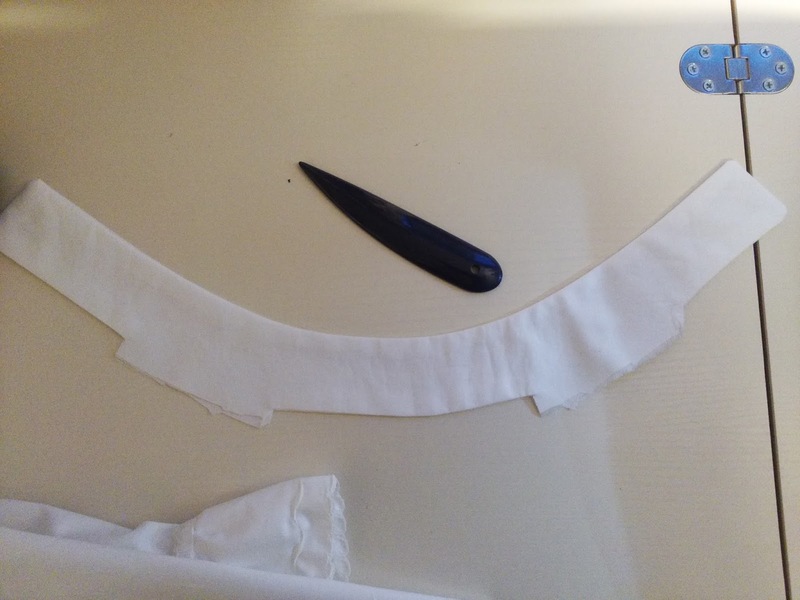 Take the hoop out - all this takes seconds by the way, and glue your shapes exactly into the outline on your fabric. Do not take your fabric out of the hoop. I love this little temporary glue pen by Prym, it washes out too. Aqua Glue Pen It is actually one of my favourite products. It has refills too. 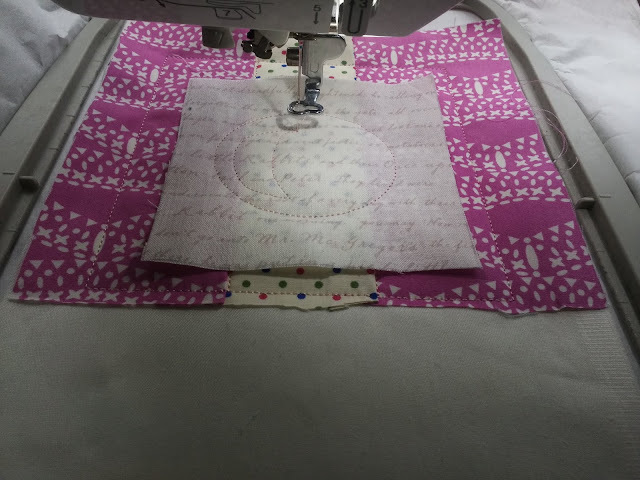 Once you have fixed your shapes in place then press the start button again and change your thread if the machine tells you to. 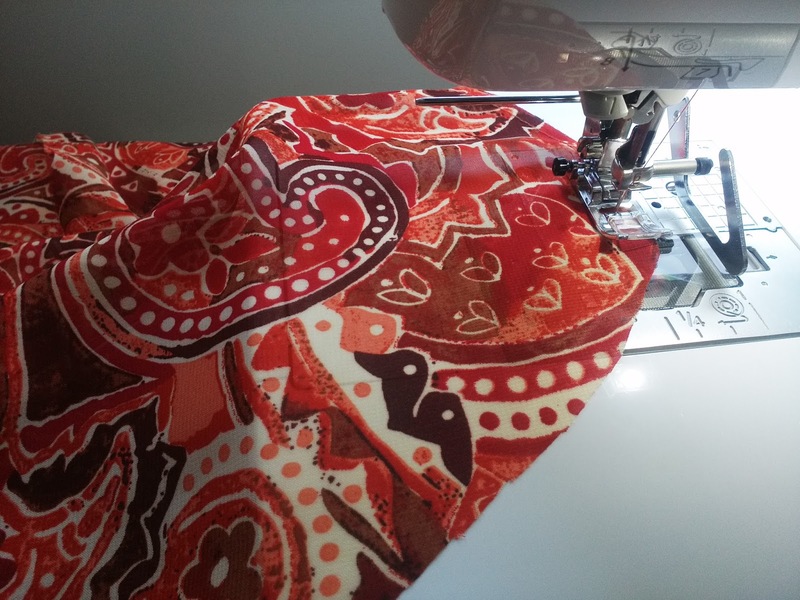 The machine will affix the appliqué onto your base fabric, and complete any further detail and embelishment. All you need to do then is to remove the stabiliser from the back of the design and it is finished. I know that you all love to watch this machine working, it is fascinating, so click on the picture above to watch a short clip on YouTube. There are other clips of this machine in action on my YouTube channel too. This is my very cute finished flower. 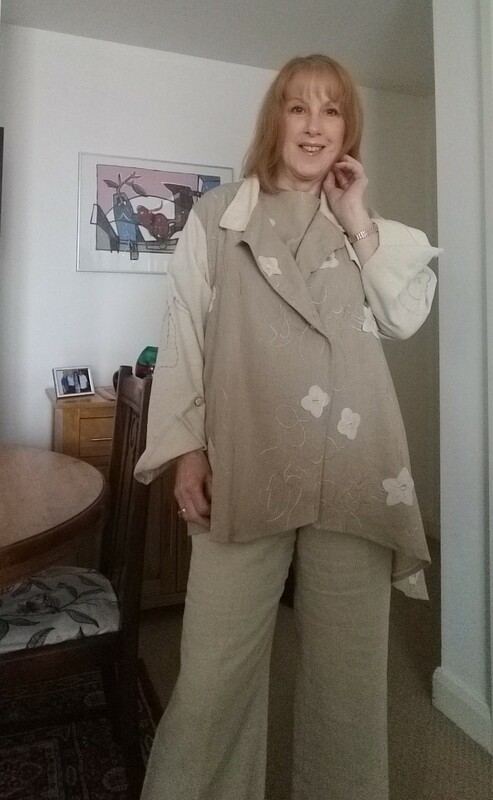 It now adorns a garment which I making and will blog about next time. I thought that the process of creating this simple but very effective appliqué was worth a blog post all to itself. The free standing lace can also be used to make stand-alone items such as Christmas stars and bookmarks and so on. I love this lace don't you. If you are interested in this machine, or another model - and who wouldn't be! Then do give Jaycotts a call , the details are all here Contact Jaycotts you can also arrange to call in for a demonstration. Once you have your machine safely home you are not left alone because Brother provide tutorial days where you can go along for help and advice and new ideas. 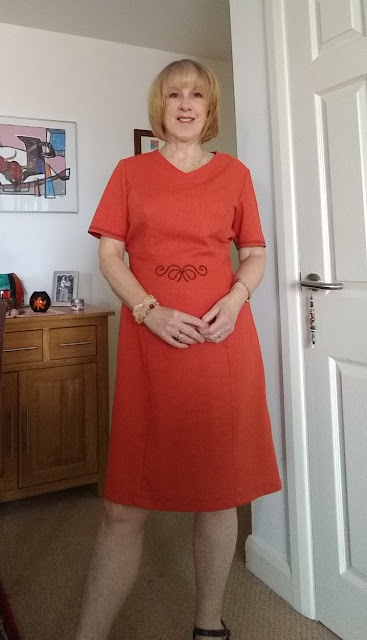 AN EASY MAKE SUMMER DRESS! 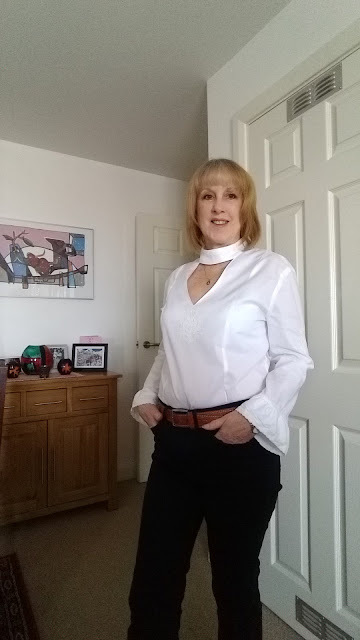 I have been longing to get into my summer clothes here at home and now that summer is here I want some quick easy makes that I can wear in a day or two.I know people who cringe at the thought of wearing summer clothes, assuming wrongly that the sun means baring skin. Not so, some of the coolest clothes to wear are those which offer some protection from the sun. 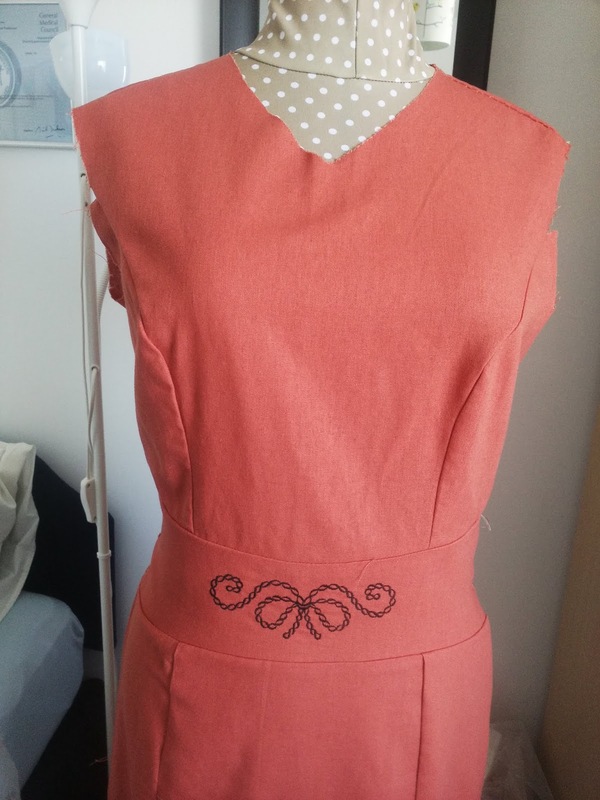 My usual summer clothes consist of pedal pushers and tunic tops, but I guess that's more out of habit than anything else, so I am making myself some dresses. This is a very pretty dress by Simplicity, available from Jaycotts Simplicity S8294 it is a vintage style dress with the option of having a collar, waist tabs and short cap sleeves. There are also two skirt options so this pattern does offer value for money. I made a size 12 and it needed no adjustments. 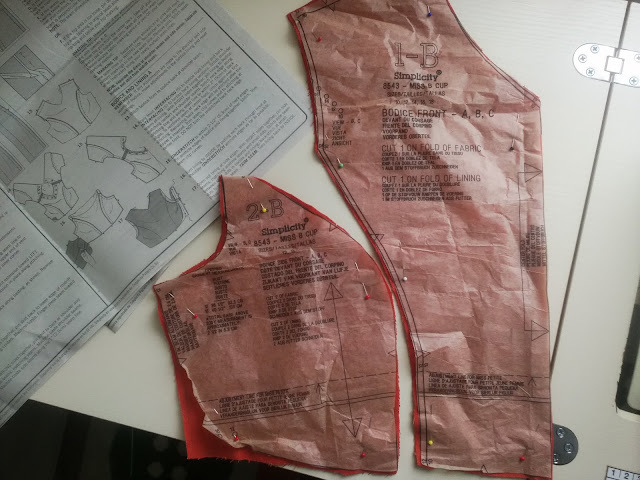 You will find that your pattern size differs from your commercial dress size, please do not be alarmed, just make sure that you cut out the size which most closely resembles your body measurements. If your top and bottom halves differ then this pattern allows you to cut out relevant sizes for your top half, and a larger or smaller size for your bottom half . It is easy then to merge the two sizes together at the waist. 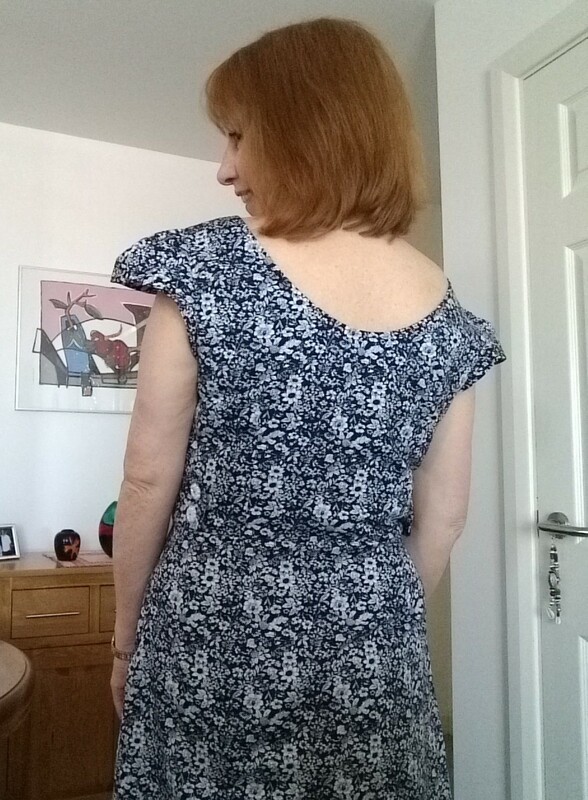 I like the slightly lower back in this pattern and as I do not appreciate having burnt shoulders I was glad that one of the options is to include a cap sleeve. 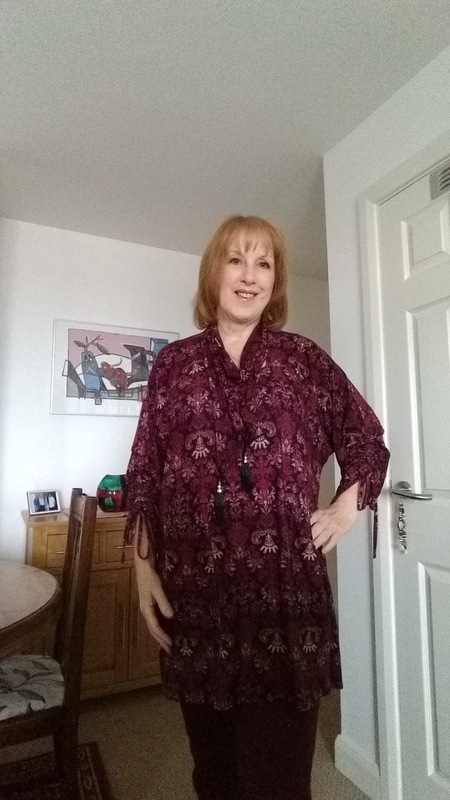 When choosing your pattern think about any parts of your body which you would like to cover up and look for a pattern which will do that. For example if you do not like your arms then think about choosing a pattern with a sleeve - which could be a flutter sleeve, short sleeve or whatever length you prefer. To draw attention away from a problem tummy or hip then choose a flattering neckline to draw the eye upwards. This is the pattern, as you can see there are a few design choices and the skirt is just above the knee. The fabric I chose is a hand printed Batik which I had in my own stash, but printed cottons are widely available from places such as MinervaCrafts or Abakhan fabrics etc. The pattern on this fabric looks as though it totally random, but if you look at the dress being worn you will see that there is a pattern which forms definate vertical lines. It is therefore important that you view your fabric from a distance and decide which direction you want the pattern to run and of course you need to cut the fabric out on the straight grain. 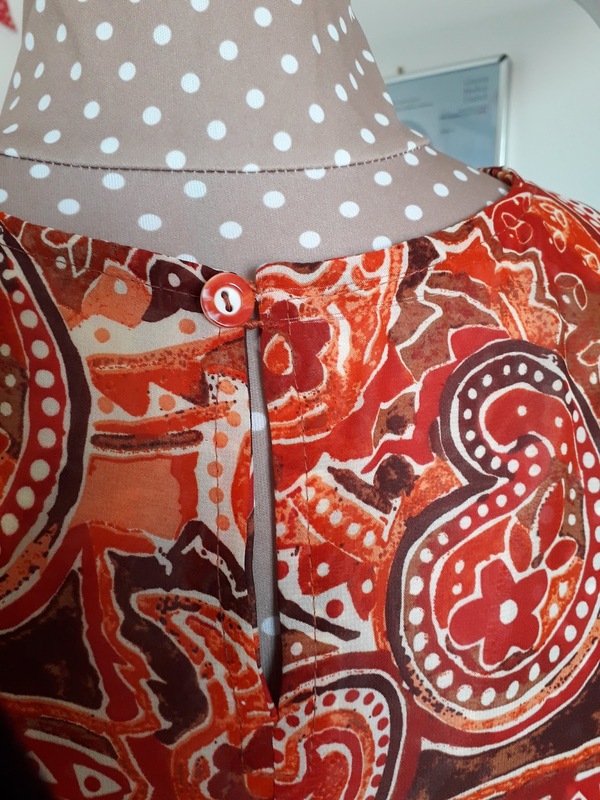 If you are new to sewing the best fabric to choose is a cotton, because it is firm and will not stretch out of shape, and choose a small print as this will not require pattern matching and a massive plus point is that the design will disguise any minor mistakes and wonky stitching. Whilst I do enjoy wearing short skirts, this is going to be a day dress for shopping and sightseeing and for me it would be more practical if it was six inches longer. This is very easy to do. 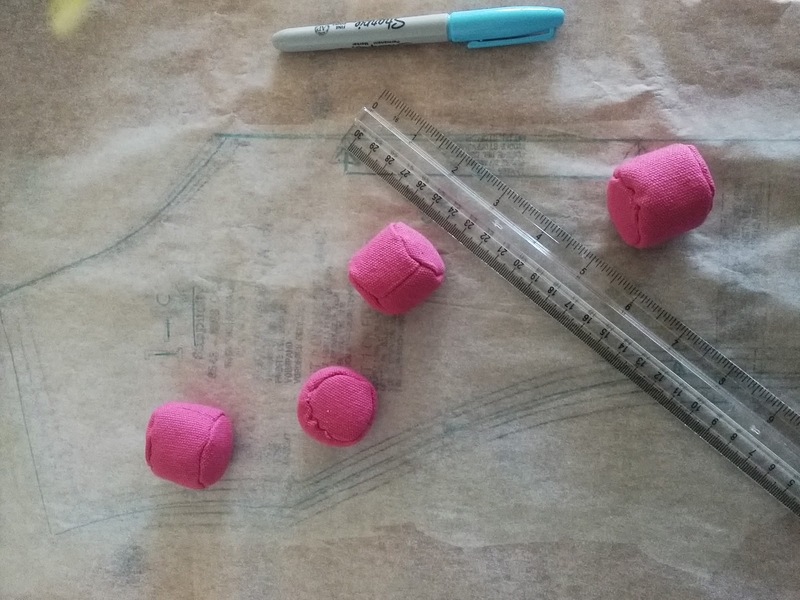 You can either add tissue paper to the bottom of your pattern pieces and measure the new hem line, or if you are confident you can do as I did and measure six inches (or whatever measurement you choose) from various points along the hem and make chalk marks, joining them up before cutting out. This is perhaps one of the simplest of pattern hacks. 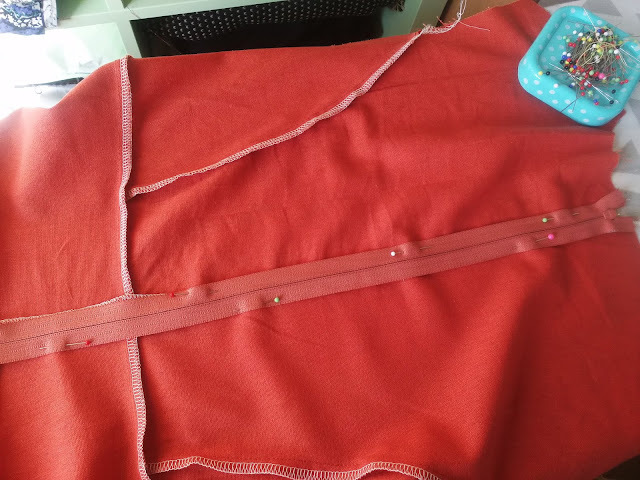 Just remember to continue the flare on the side seams or it will be too tight around the bottom. 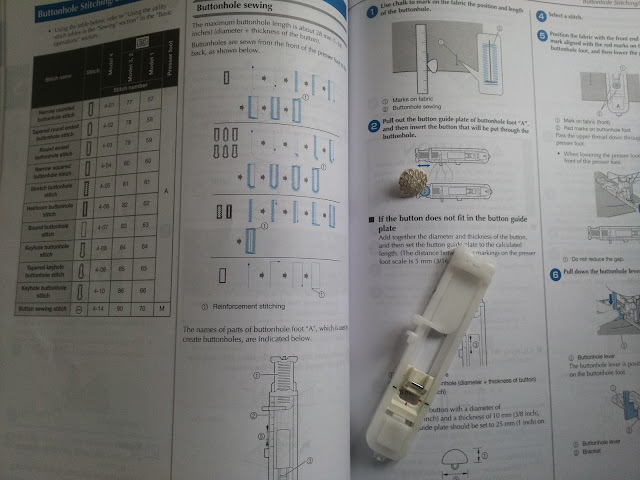 The first thing I am going to do is to get the waist tabs made,pushing the corners out with my Prym point turner By using this nifty gadget you can be certain that your points are sharp. 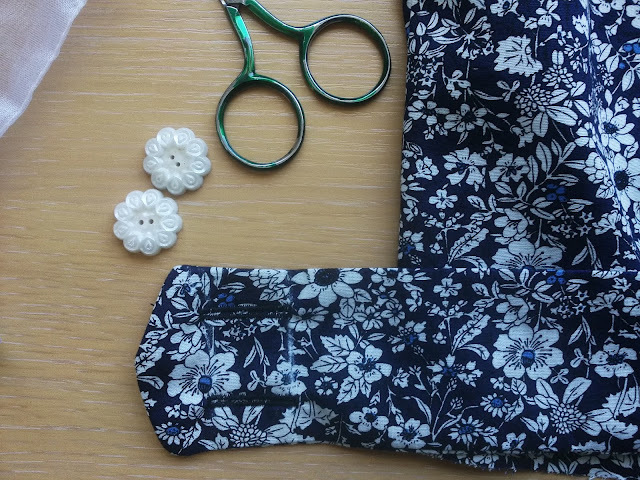 Press the tabs then make the buttonholes . Your buttonhole foot will probably look like this one. All you do is to select the buttonhole you want and put your button into the recess in the back of the foot. It then sews the perfect buttonhole to fit your button. Do mark the positions of your buttonholes with chalk first and do practise on a piece of spare fabric before you do it on the actual garment. 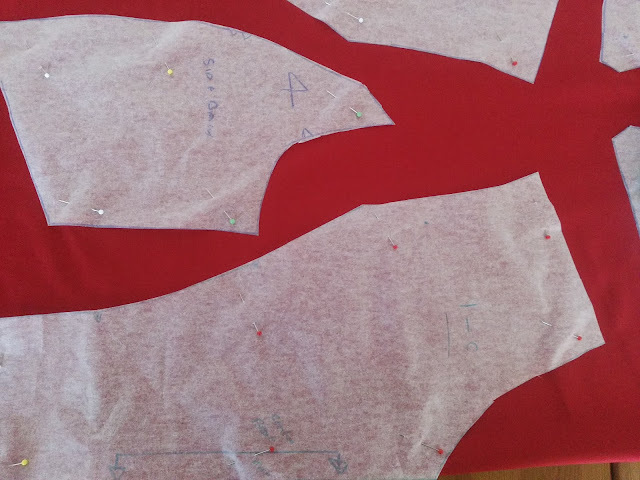 It is simple then to sew the darts and joint the front and back at the shoulders and the left side. Join the top of the right side only as far down as the pattern marking. Then neaten the seams on your overlocker if you have one. 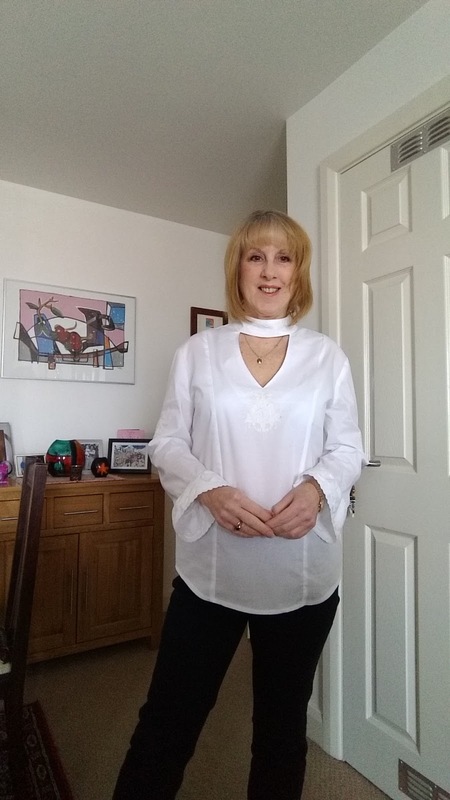 Don't own an overlocker? 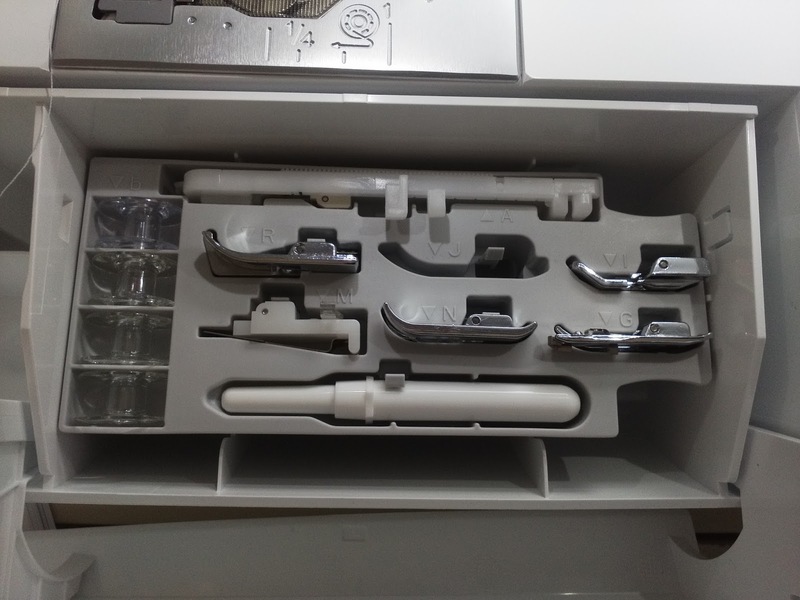 Mine is the Brother 3034D but do view the range of overlockers available Overlockers if you are not certain which machine is right for you then do ring Jaycotts and they will help you to choose a machine which suits your needs and your budget. The pattern says to use a neck band but as there is an actual facing included in the pattern I used that instead. It needs a lightweight iron on interfacing . 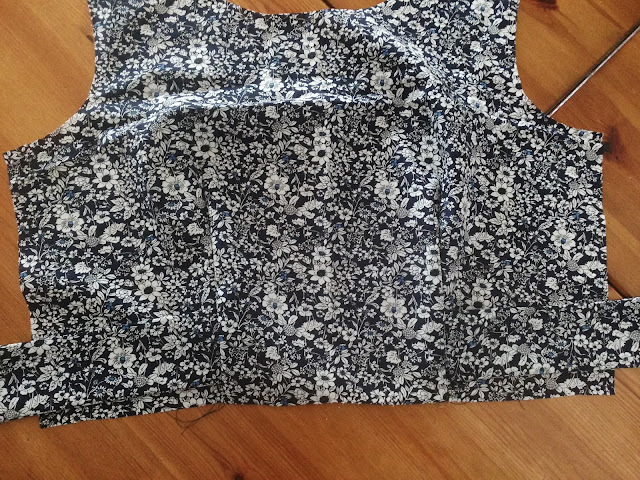 There are lots to choose from here Interfacing from iron on to sew in and all sorts of weights too. Choose the correct weight for your fabric and always choose the best quality you can find. 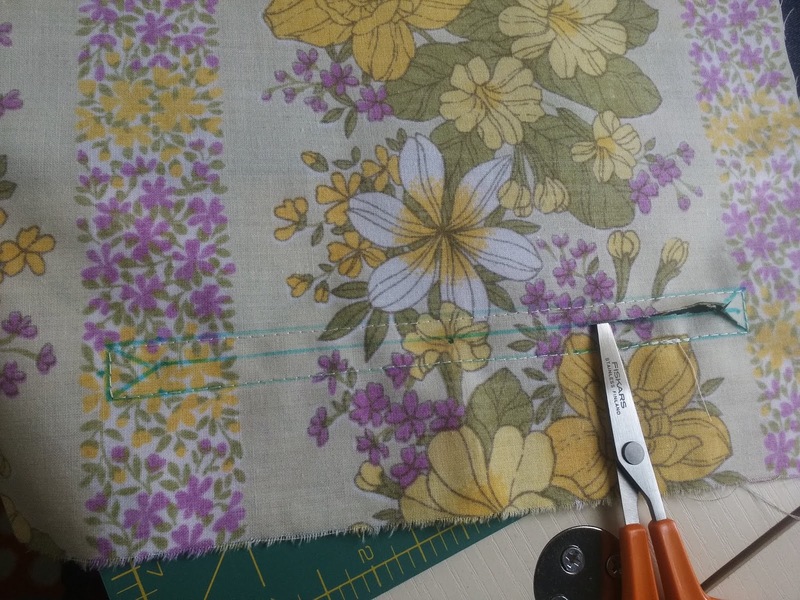 Jaycotts sell Vilene interfacing which is perfect. 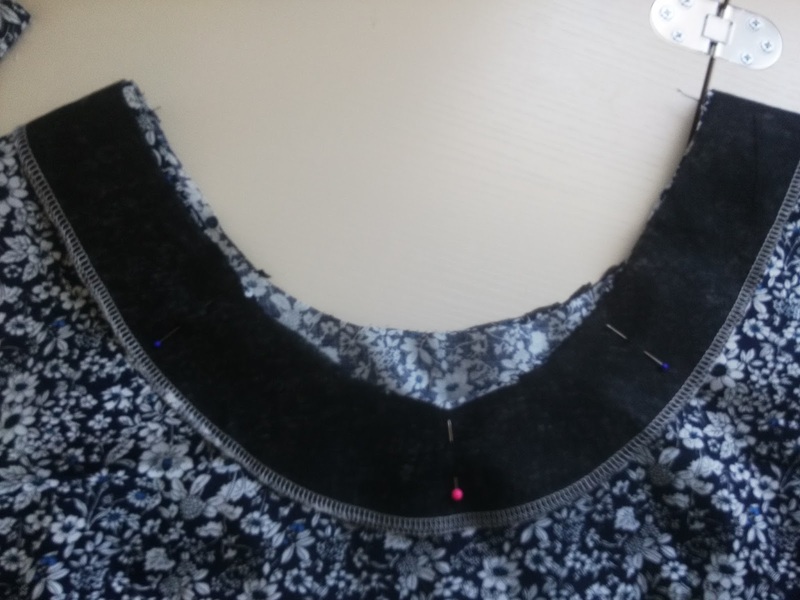 To allow the facing to turn to the inside of the neckline you need to clip the curves, press the seam open and then understitch the facings . 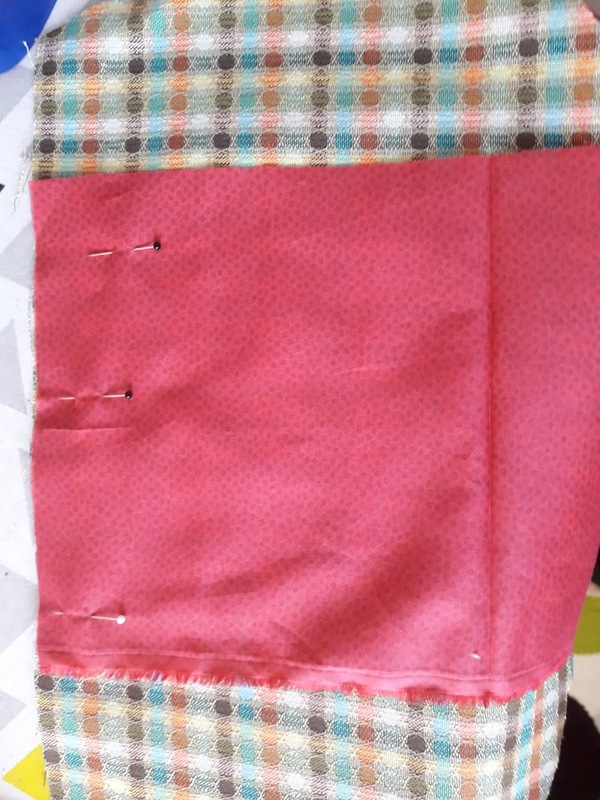 This means that you need to sew the seam allowance to the facing as far as you can. It stops the facing from rolling out during wear. Don't forget to keep pressing as you go. Don't be afraid to top stitch as well if you want to. 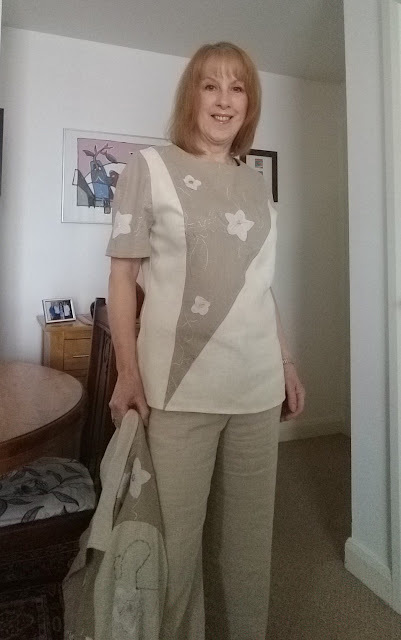 This is my finished facing pressed to the inside.you can just about make out the understitching which does not show on the right side of the garment. 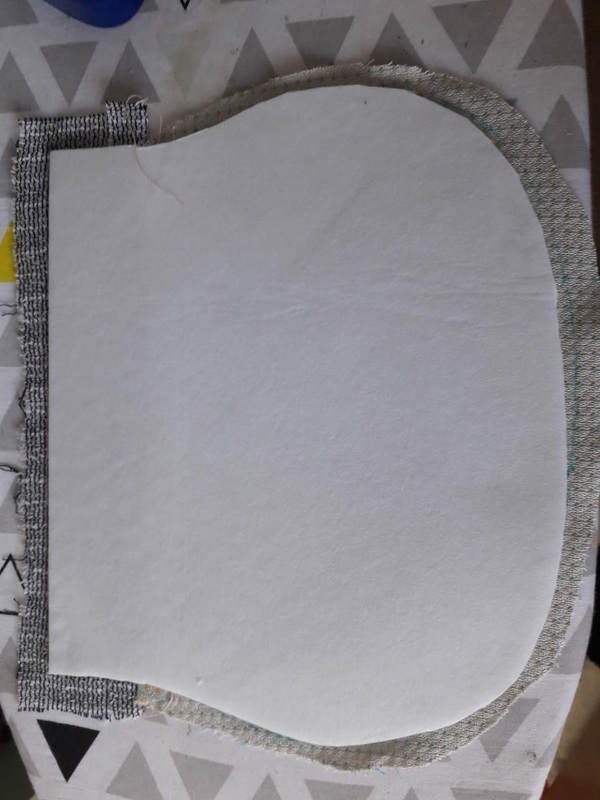 You will need a sleeve board to press the sleeve without making unwanted creases in it. 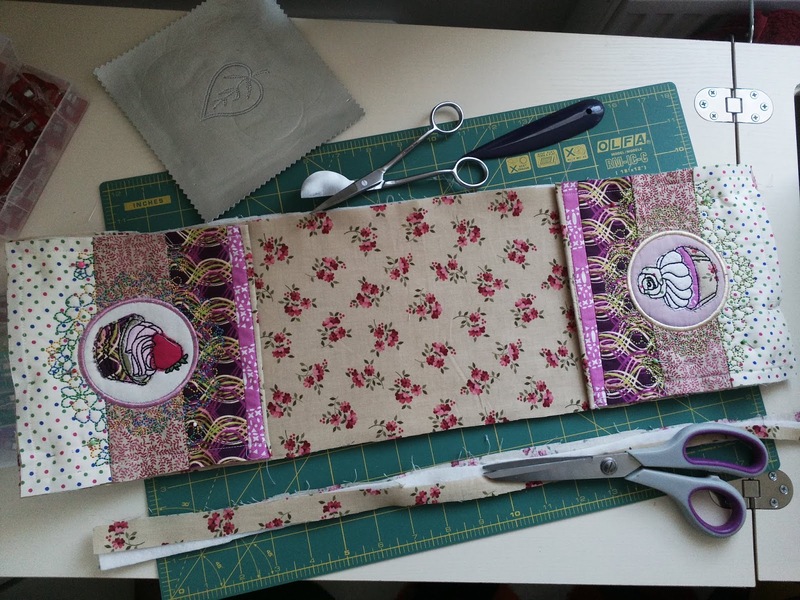 A sleeve board also makes it easy to preserve the shape you have put into the fabric. A sleeve ironing board Sleeve board is a necessary piece of equipment for any sewer. You will use it for every garment you make. Did you know that zips can be shortened? This dress needs a side zip, but the only one I have is too long. 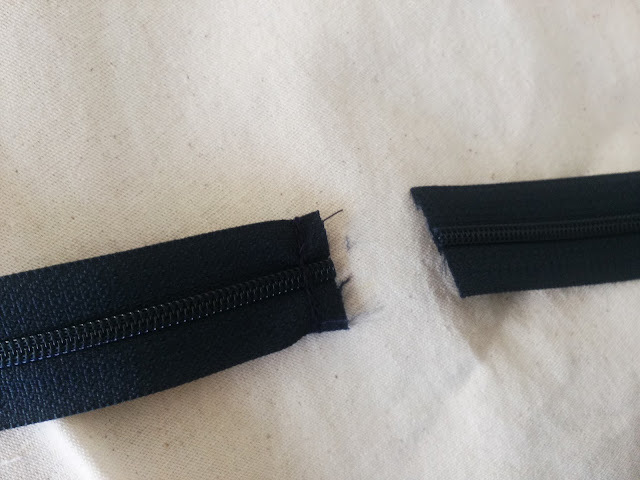 At the point where you want the new end of the zip to be, go over it a few times with your sewing machine. Then cut the end of below this point. As a personal preference I like to whip stitch the plastic teeth below the stitching purely so that it is comfortable against my skin. I am using an invisible zipper. 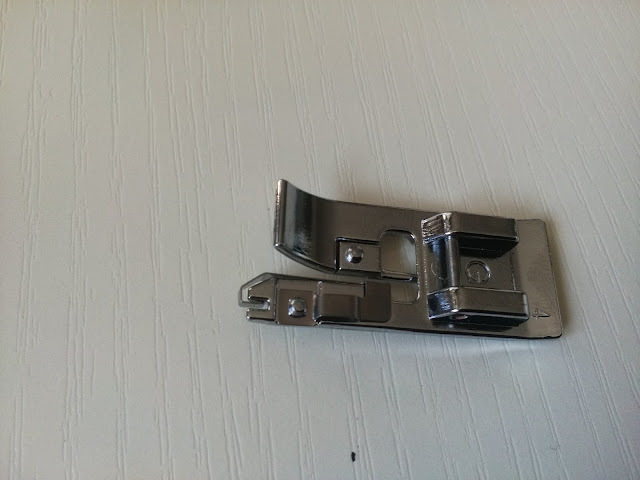 To insert if you will need a special foot which has grooves in the bottom which the teeth of the zip are placed whilst the zipper tape is being sewn on. The invisible, or concealed, zip foot is available for most sewing machines, Concealed zip foot if you are not sure which is best for your machine then call Jaycotts for advice.the most usual one is the one on the right which is for Brother machines, the one on the left is for my Bernina, the only difference really is the way they fit on the machine. It is better to tack the zip in place rather than just pin it. They can slip about a bit otherwise. Sew one side at a time and leave the side seam open for now, we will close the seam later. As you can see the grooves on the zipper foot are enclosing the zipper teeth enabling the machine to sew right up close to them, this means that when the zip is closed you will not see it at all. 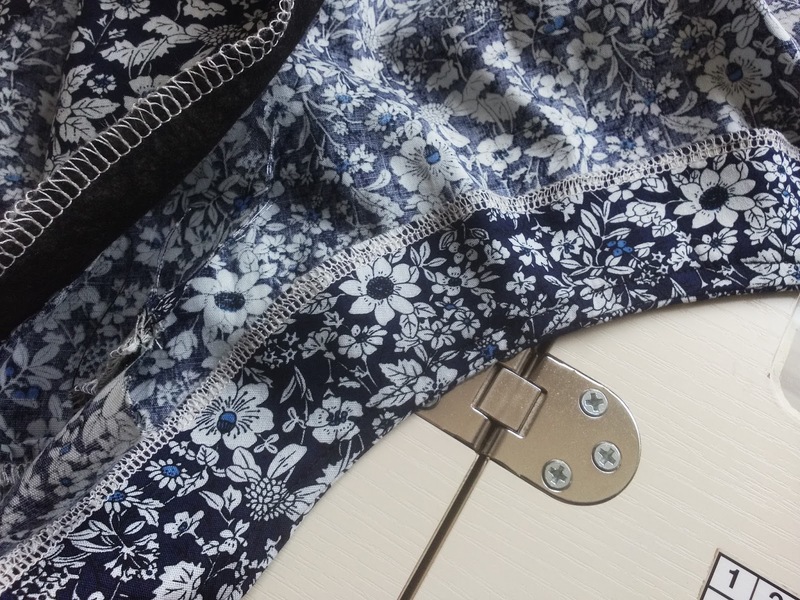 For all your zips , at fantastic prices, just look at the wide choice here, Zips as you can see there is a high quality zip for everything and as I said the prices are the best anywhere. Neaten any loose threads and catch the bottom of the zip to the seam allowance if necessary..
All that you can see of an invisible zip is the zip pull which makes it a great choice for dresses. All you need to do now is to finish the hem. I overlocked the bottom and then pressed it up by half an inch and top- stitched. The tabs fold towards the back of the dress, so press them to the back and stitch the buttons on. You will only need to undo the buttons which cover the side opening. The buttons show on the back of the dress and add a bit of interest. The tab would look great in a contrasting fabric, which is an option on the pattern envalope. 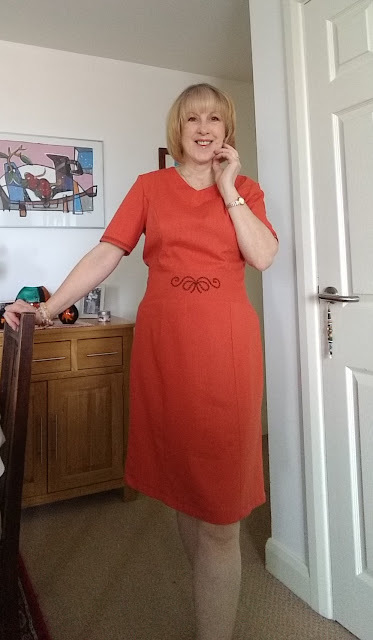 I am sure you will agree that this is a very nice fitting dress, easy to wear and practical for almost every occasion. When I make it again I am going to add the collar which I feel would look great from the back, and I am going to make both collar and tabs in a contrasting fabric . It is totally suitable for beginners, there is nothing too difficult about the construction at all and the instructions are clear.